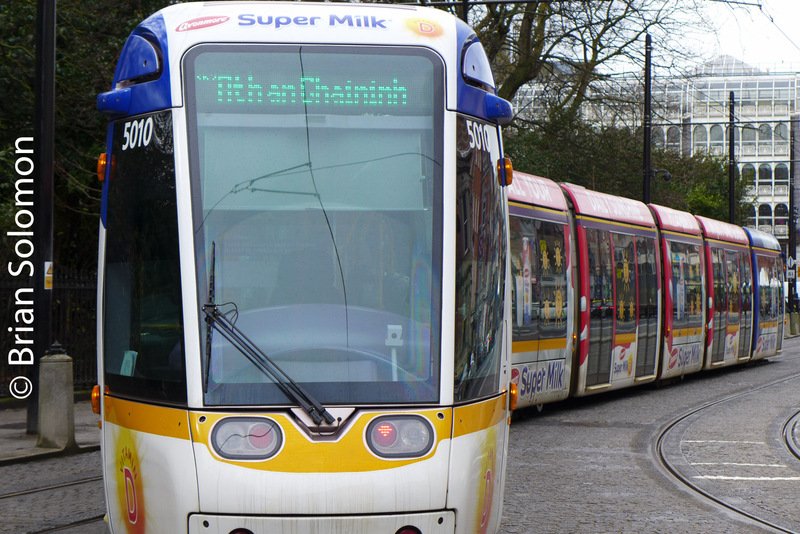 Milk Tram at St Stephens Green—LUAS Avonmore Ad Tram Round 2! 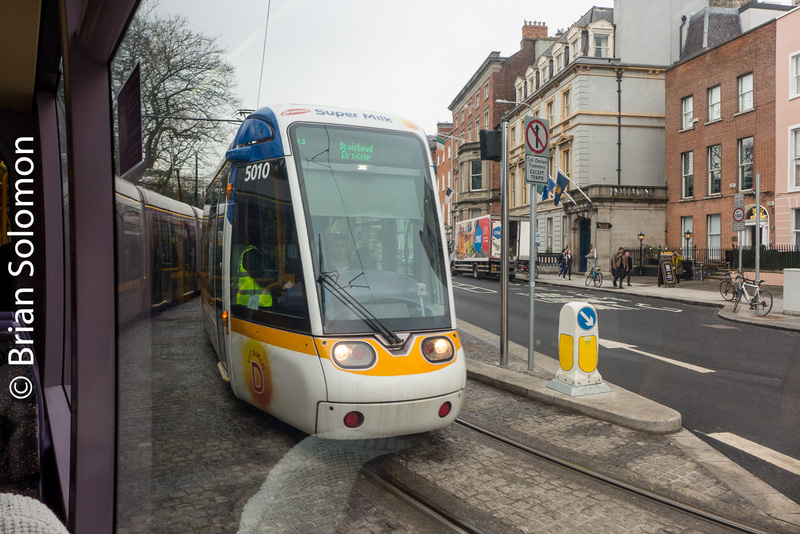 Two weeks ago, I was traveling south on the LUAS Green Line from Marlborough Street to Harcourt Street, when I spotted the one-of-a-kind LUAS Avonmore advertising tram taking the bend around Dublin’s St. Stephens Green. My Lumix is always at the ready, so I made a few grab shots from the windows of the tram, which was bound for Broombridge. I’d worked out in my head roughly how long it would take for it to make a return trip, and did some shopping to kill time. 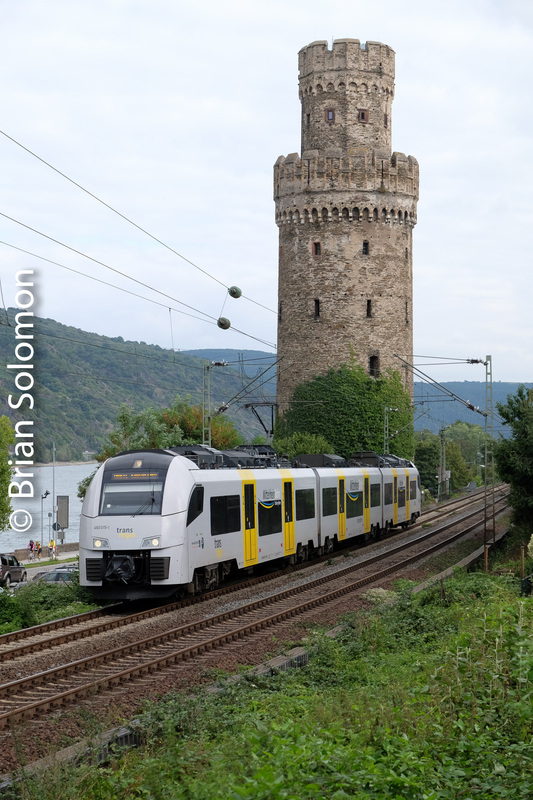 An hour later I returned to the curve and made a few more photos of the same tram going the other way. 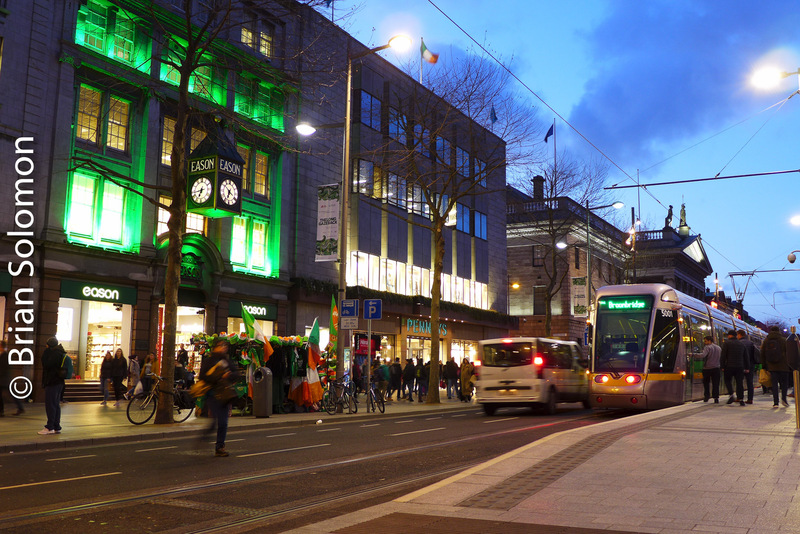 Trams crossing at Dawson Street. Location Location Location: Making Claude Road Work. I was trying think of a title that would get you to read this! 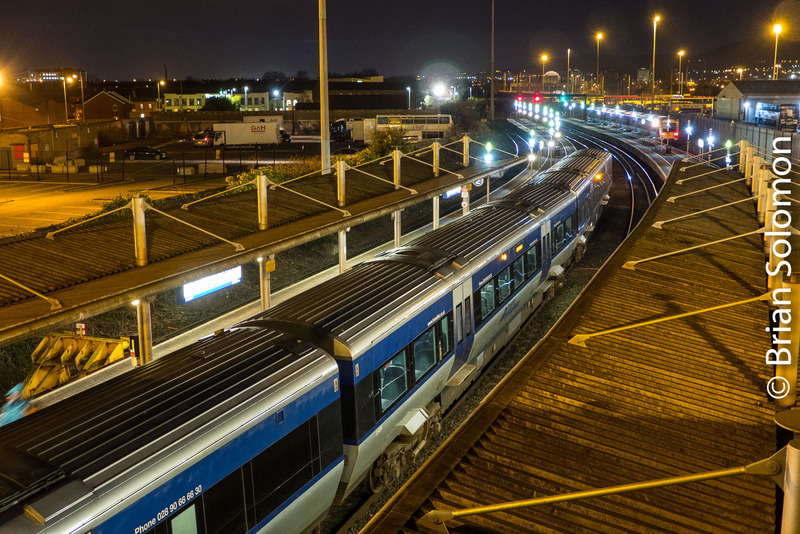 The Claude Road footbridge in Dublin offers an interesting vantage point for Irish Rail, but comes with its fair share of challenges. It’s a location on an S-bend, which is a good thing, but also a visual puzzle, calling for the optimal lens-camera combination to yield satisfactory results. 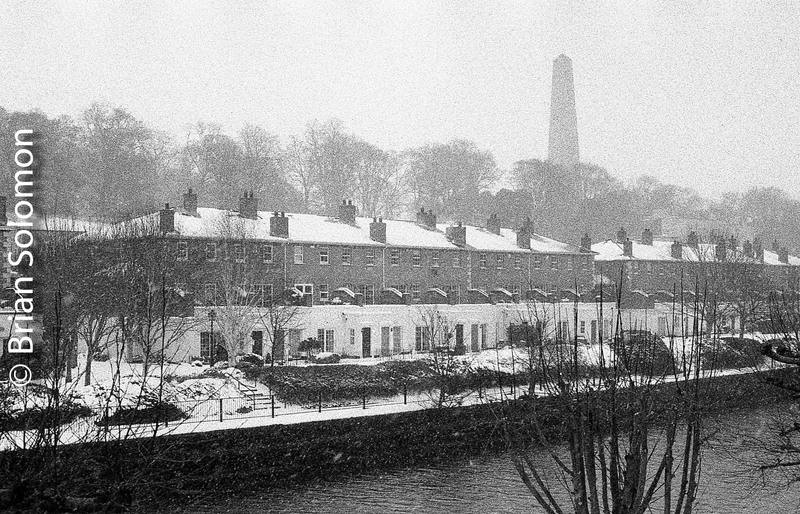 I like the location because of the old mill in the distance to the west, and the views of Croke Park stadium to the east that offer distinctive location identification. 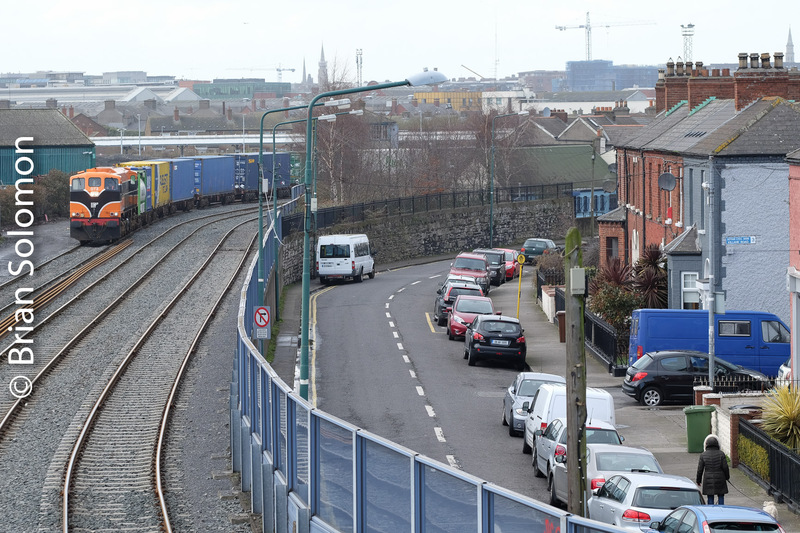 An Irish Rail ICR heading east for Connolly Station approaches Claude Road. 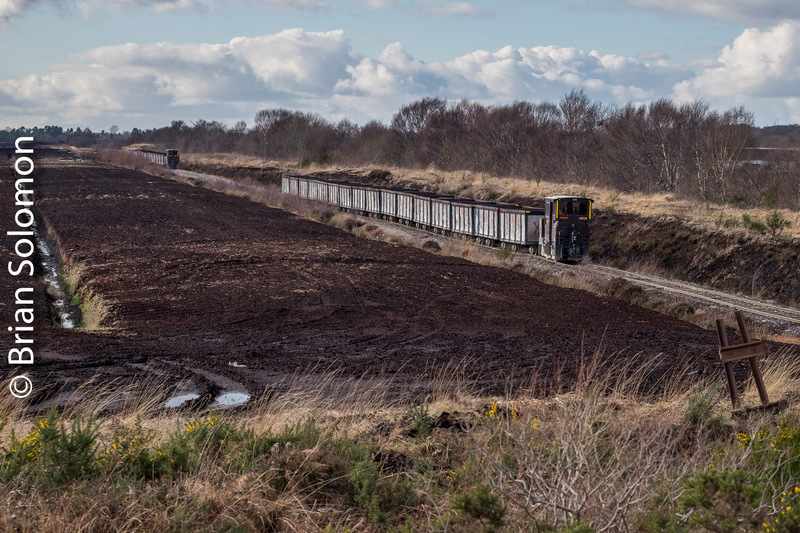 A slightly wider view of the same train. 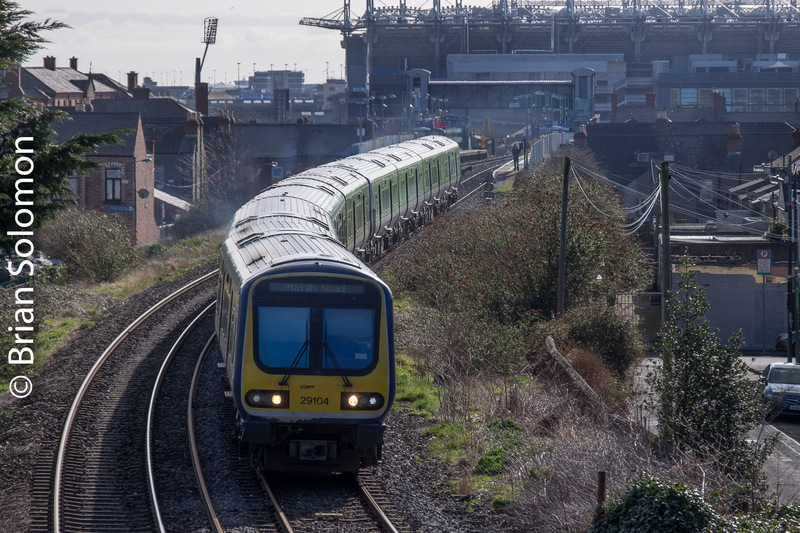 An inbound 29000 series railcar heads toward Drumcondra Station, Croke Park looms in the distance. 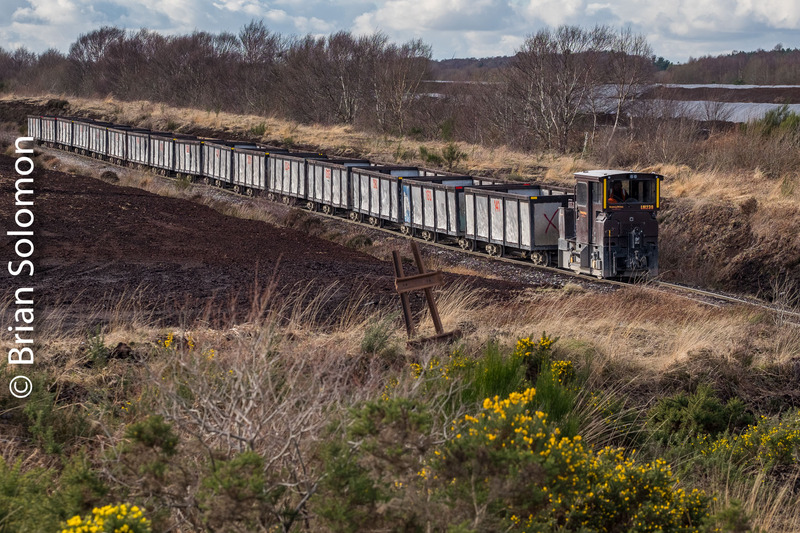 An outbound 29000 series railcar some a similar vantage point. To make the most of this image, I adjusted contrast and exposure in post processing. 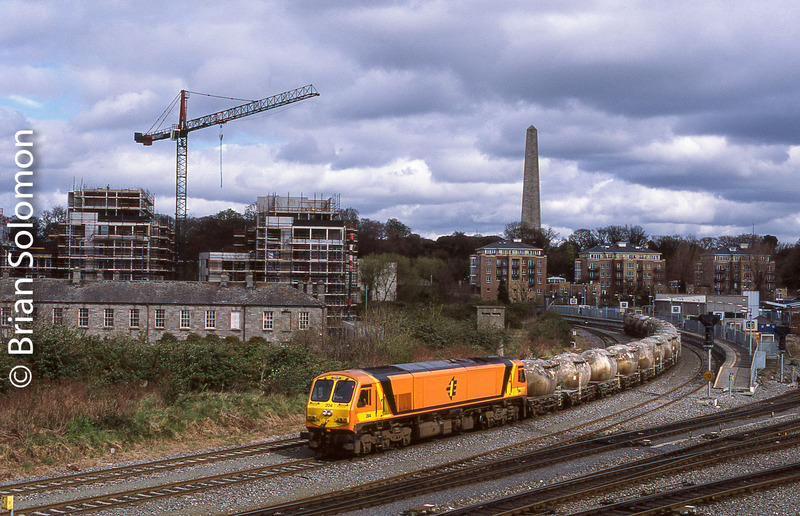 Irish Rail 077 works ‘light engine’ toward Inchicore. 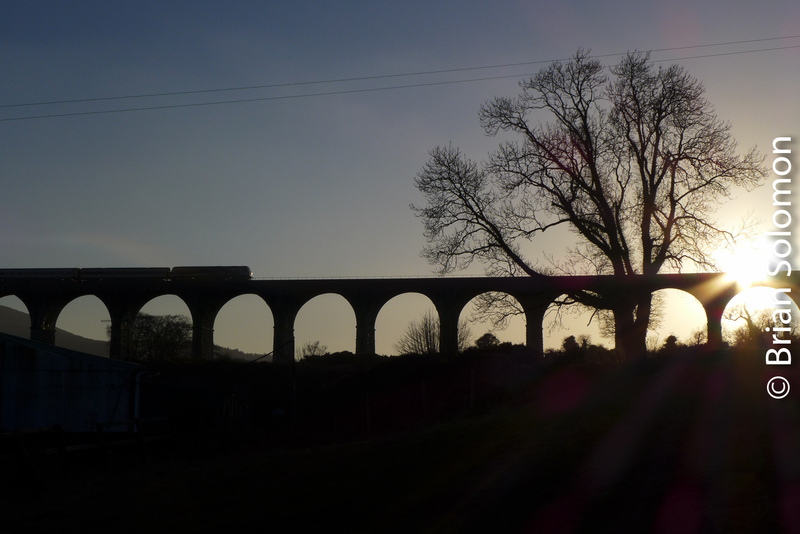 This is a trailing view to make the most of the morning sunlight. High railings at the center part of the footbridge can make it difficult for me to obtain the perfect angle, without aid of a footstool or tilting rear camera display. 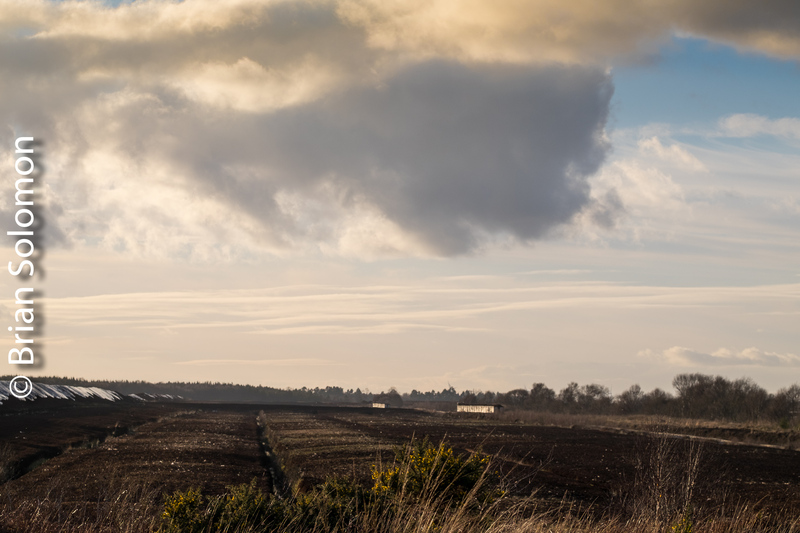 I made these views on a sunny morning with my FujiFilm X-T1 with 18-135mm lens. 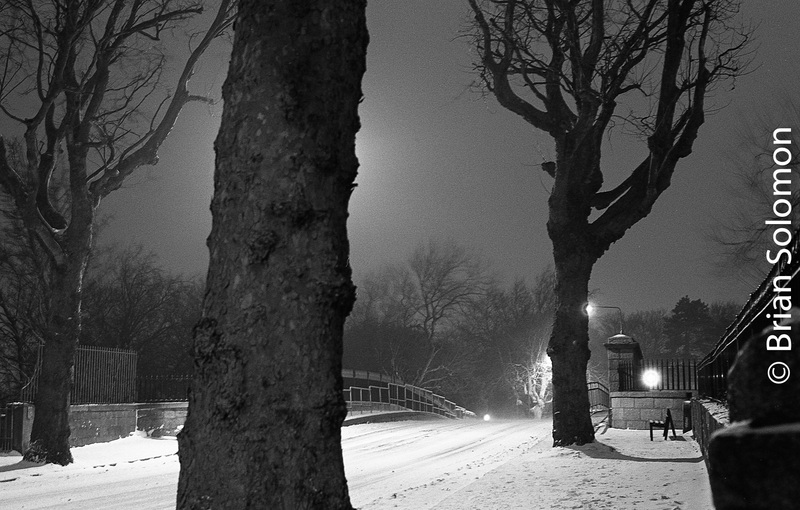 The Fuji’s adjustable rear display allows me to hold the camera at arm’s length over the bridge railing..
Dublin by Night: 1000 shades of Dark. I’d use ‘gray’ in place of ‘dark’, but apparently the phraseology has assumed new meanings. 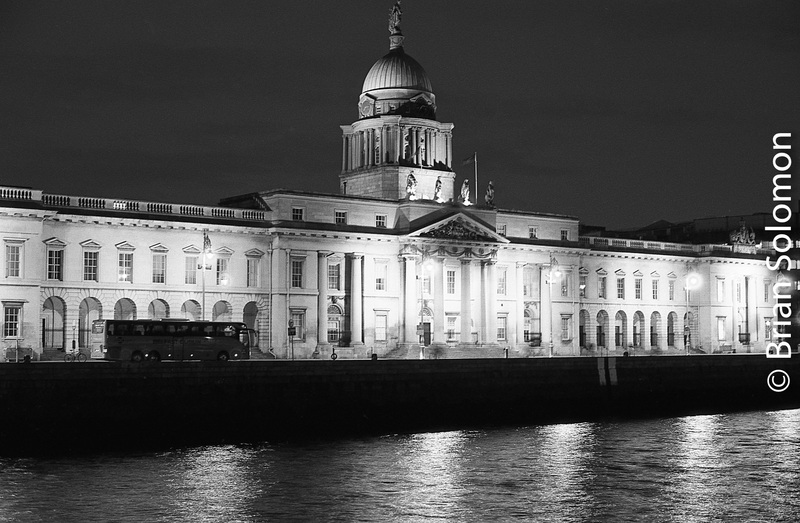 I could just say ‘Dublin in Black & White’, but that isn’t really correct either. 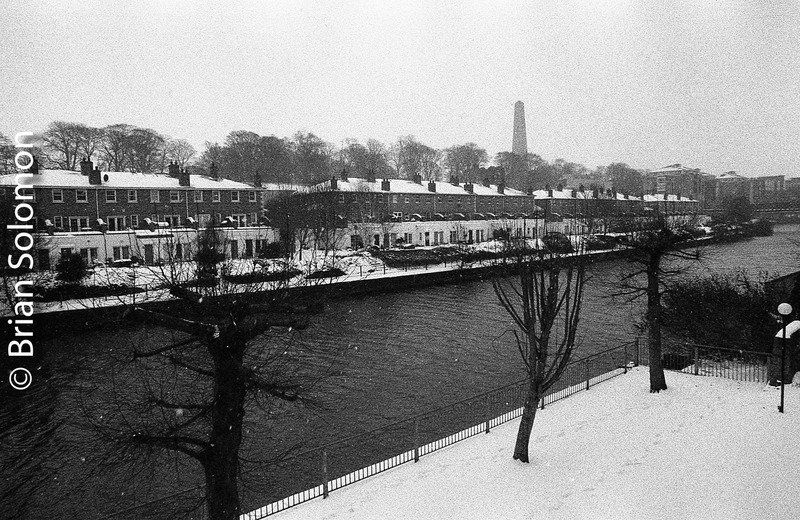 Working with my Nikon F3 loaded with Foma Classic 100 black & white film, I made these photos during March 2018 wintery weather in Dublin. To keep my camera steady for long exposures, I used various tripods, depending on the surface and circumstance. 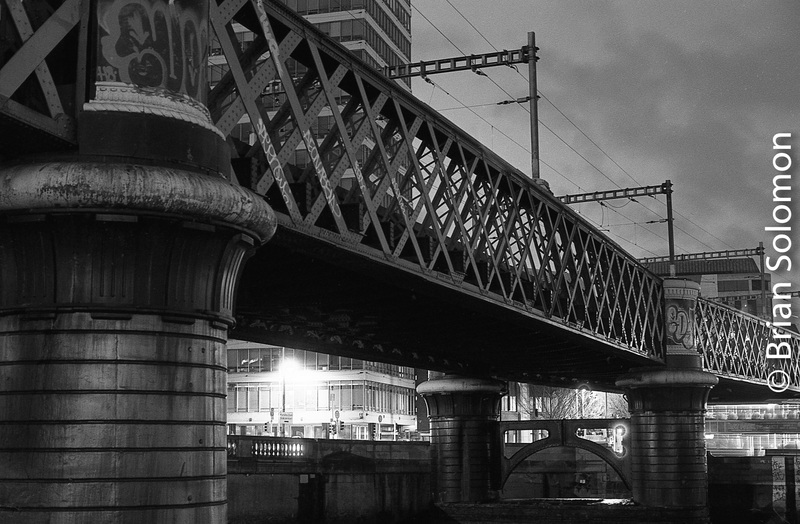 Irish Rail’s Loop Line bridge over the River Liffey. My exposures varied, but most were between 1 and 8 seconds. I calculated exposure manually using a Minolta IV Flash meter (in reflective mode). 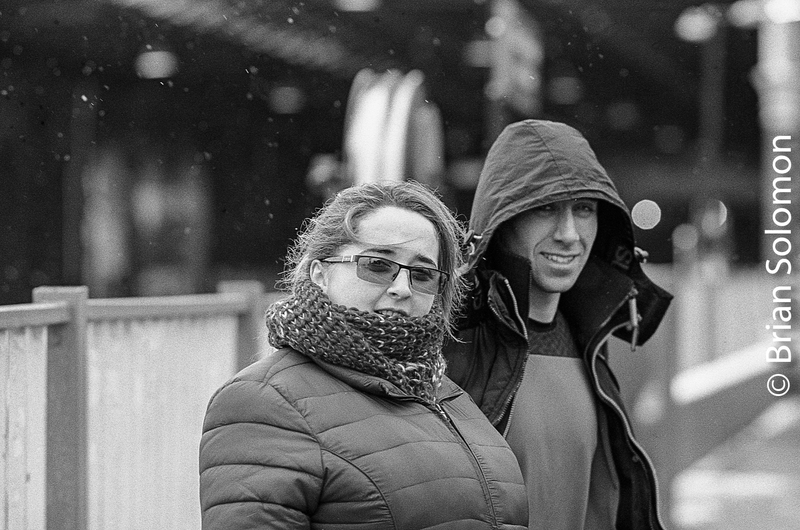 I processed the Fomapan 100 film in Ilford ID-11 stock mixed 1-1 with water at 68F for 7 minutes 15 seconds, plus pre-soak with a token amount of Kodak HC110, then scanned negatives using an Epson V500 flatbed scanner. 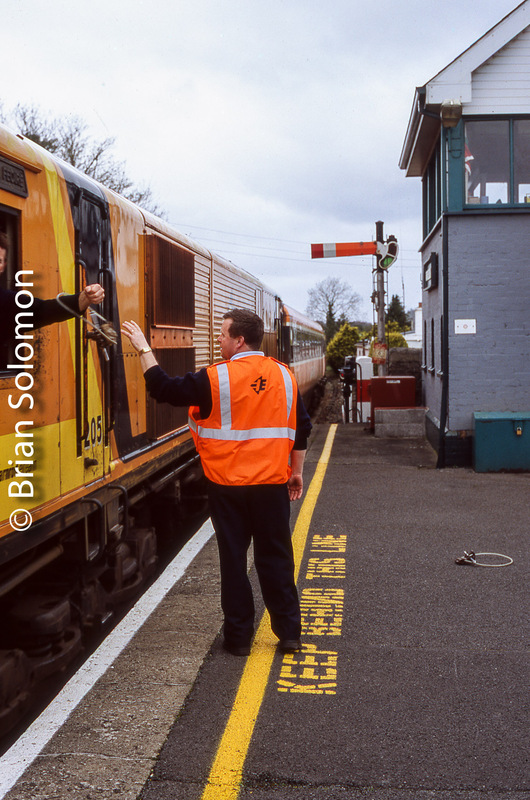 My Photo of Kent Station Appears in Michael B. Barry’s New Book. 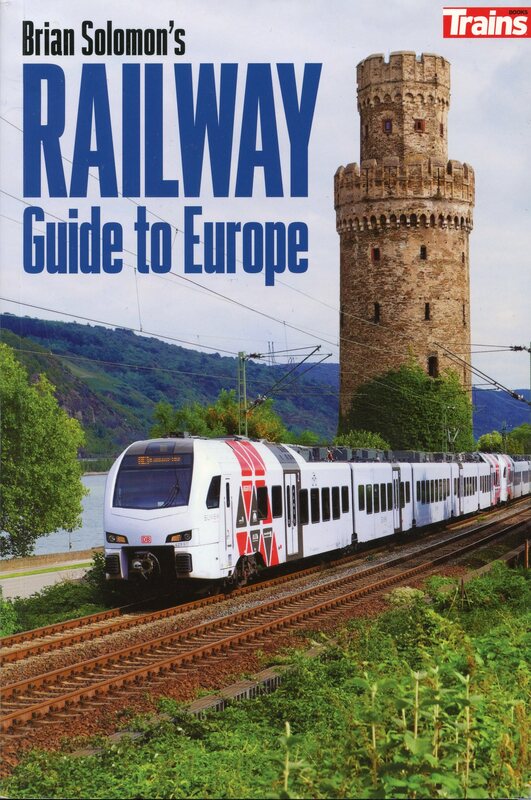 Michael B. Barry’s beautiful new book on Málaga makes the connection between two Kent Stations, one in Cork the other in Málaga. Both were named for politically active Kents who were related. Michael’s book is available from Andulas Press. 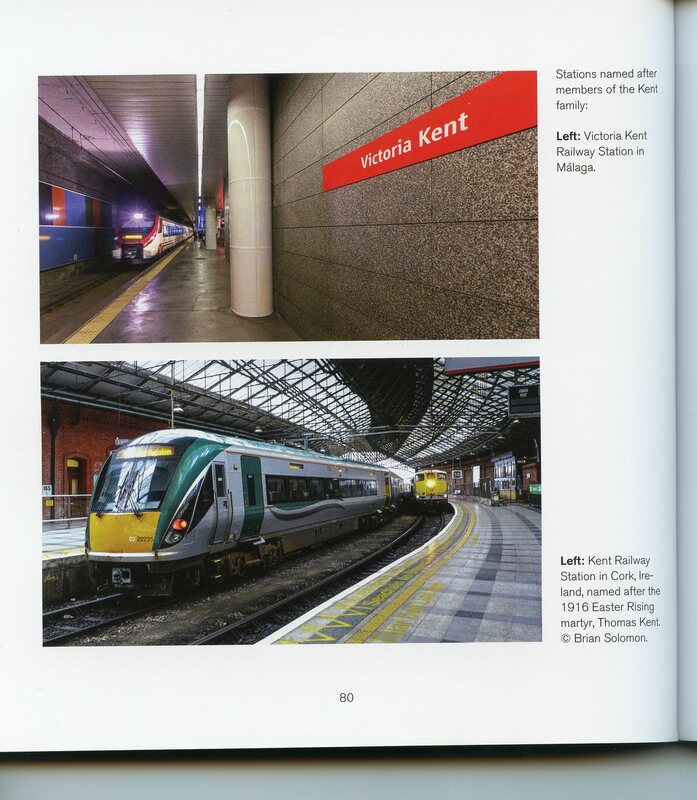 My photo is at the bottom of page 80, and depicts Cork’s Kent Station. The top photo is of Victoria Kent Station in Málaga. I stood here for what? Fool in the Rain: Irish Weather Part 2. Having a little information can be a dangerous thing. 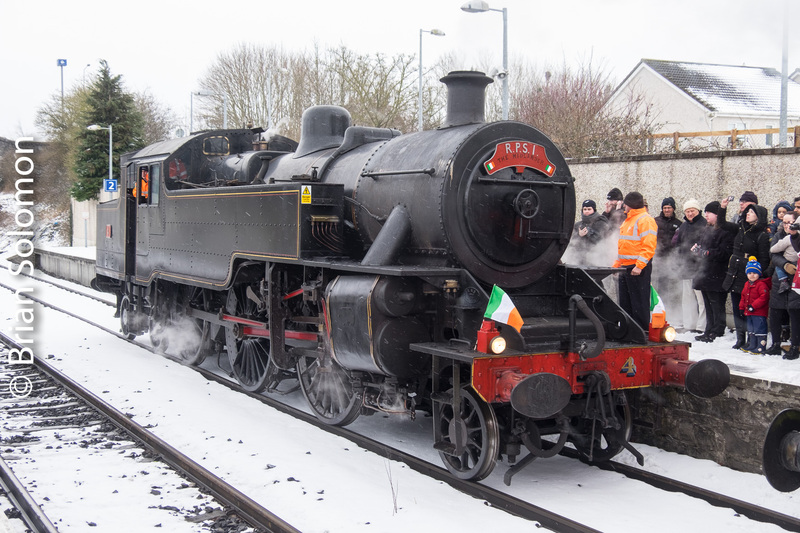 Irish Rail’s 073 in heritage paint was working the IWT liner. 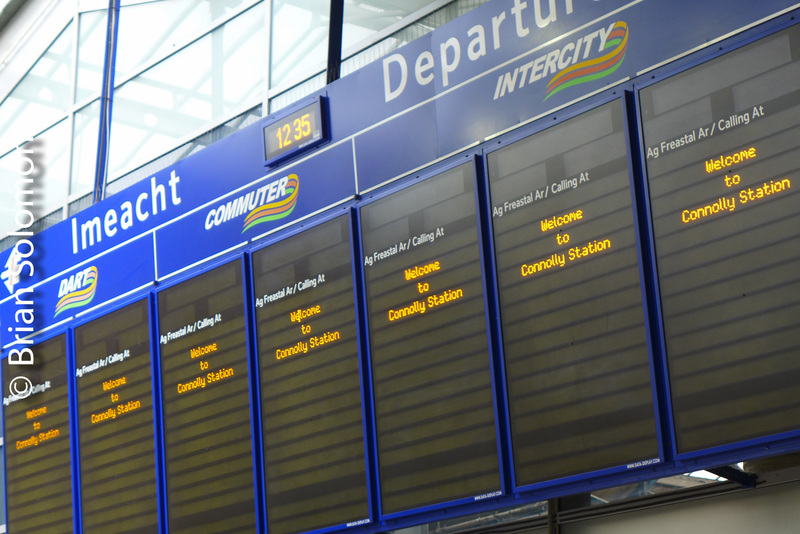 It’s just a short walk to Islandbridge Junction. In theory, if I timed my walk right I wouldn’t have to wait more than a couple of minutes. 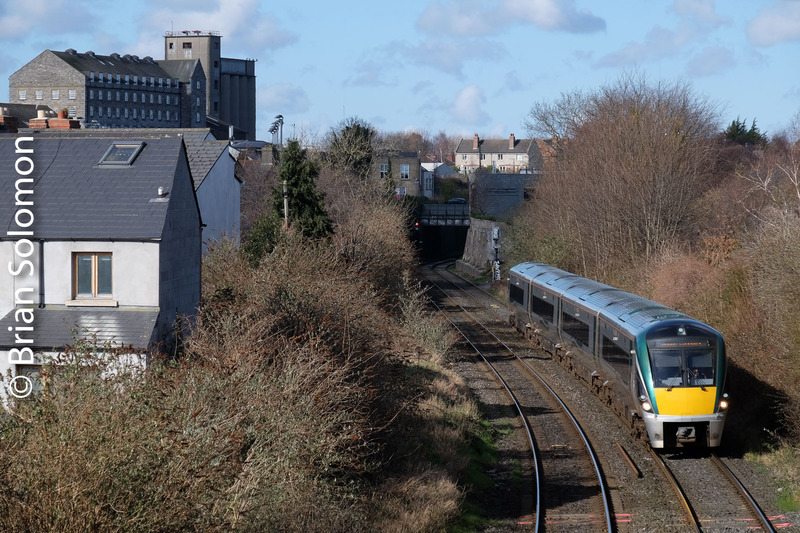 And then for reasons unknown, Irish Rail held the IWT Liner in the Phoenix Park tunnel for 20 minutes. 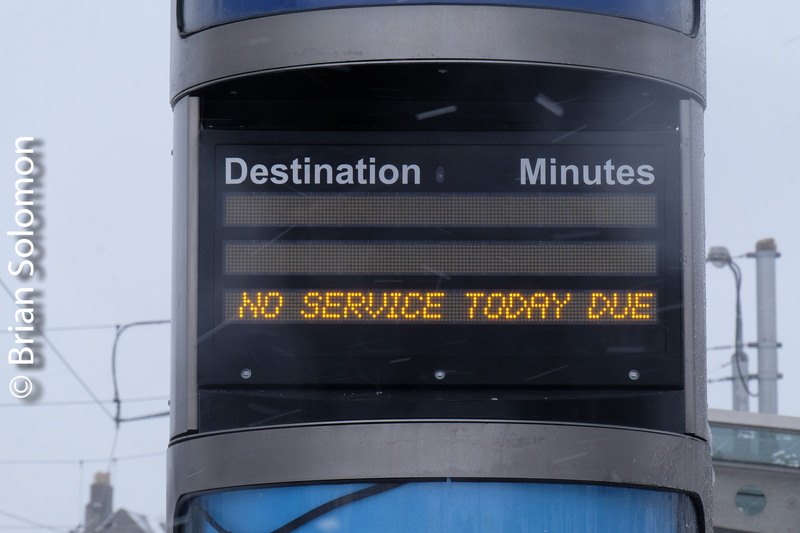 Twenty minutes seems like eternity when some fool is waiting in the rain. 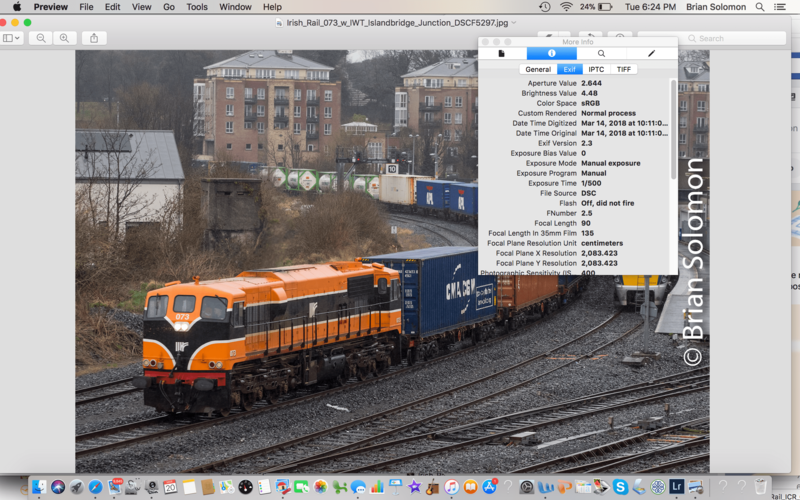 Screen shot showing camera EXIF data. 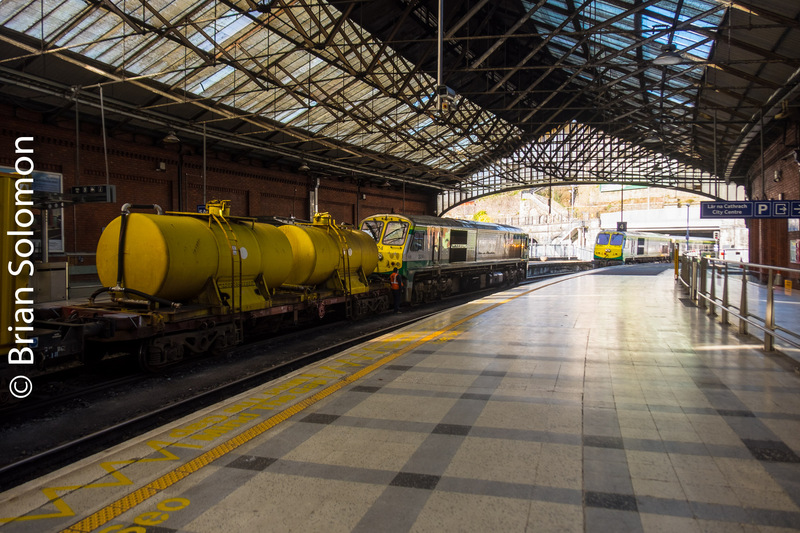 Irish Rail 073 in Heritage Paint at Dublin’s North Wall. 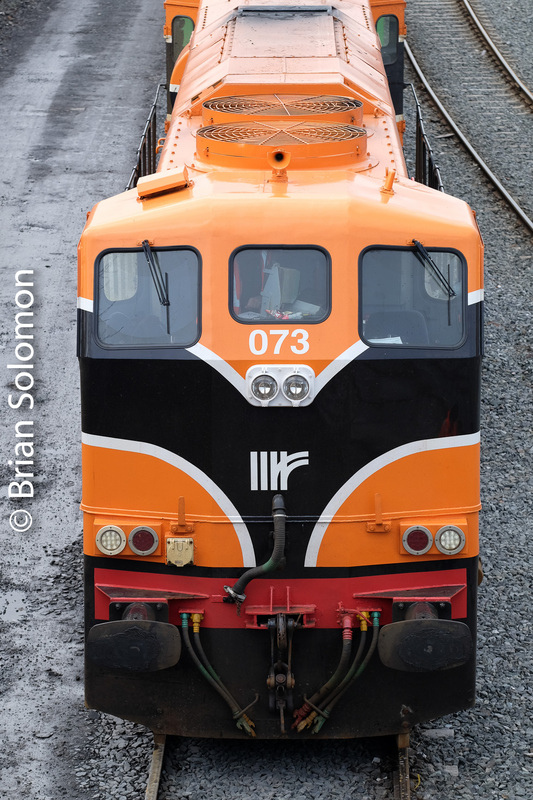 Irish Rail 073 was repainted in 2017 into heritage orange paint. 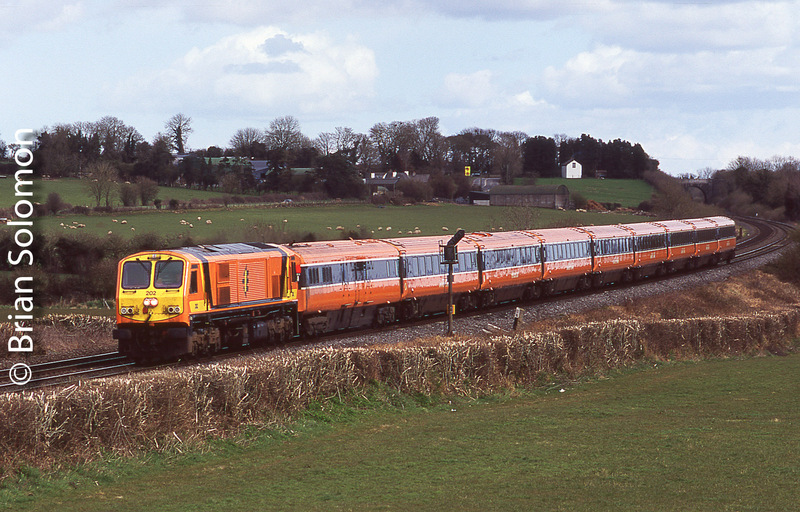 When I arrived in Ireland 20 years ago, most locomotives were in some variation of this orange-livery. Today, 073 is a novelty. The bright orange with white trimming makes for a great subject, even on cloudy days since its stands out well from the background. 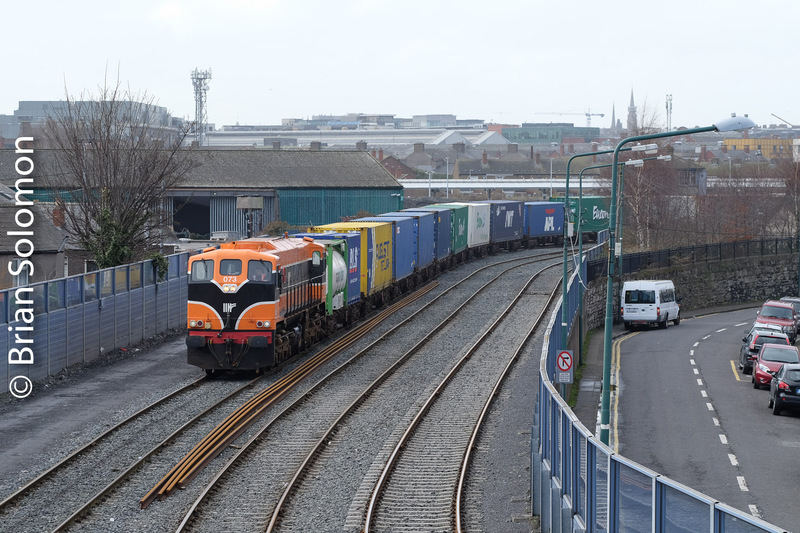 I made these views last week at Dublin’s North Wall of the arriving IWT Liner. Fool in the Rain, Irish Weather Part 1. 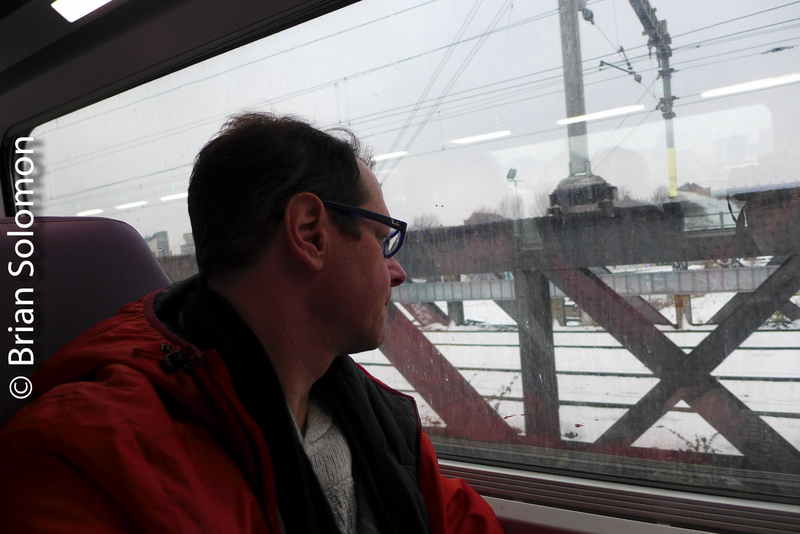 On the way to Belfast from Dublin a couple of weeks ago, the rain lashed down. 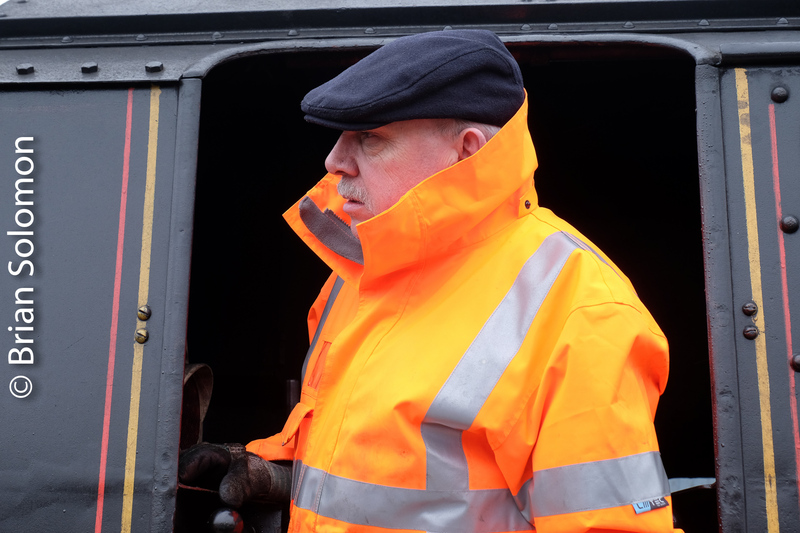 Instead of changing trains at Portadown, I opted to remain dry a little long and remained on the Enterprise all the way to Belfast Central. 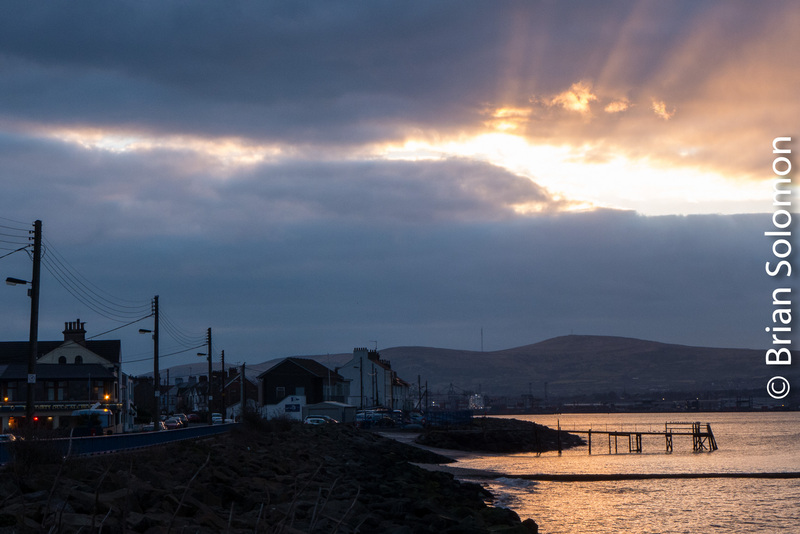 It was still cloudy in Belfast, but the rain had stopped. 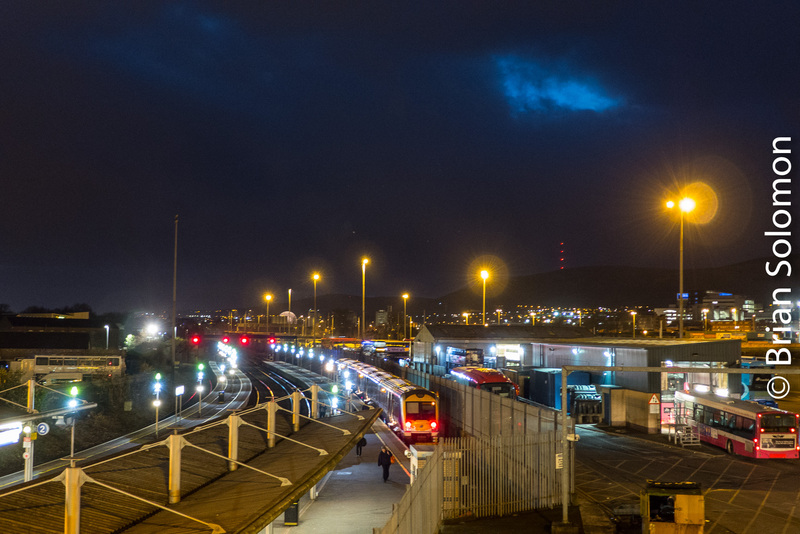 I traveled to Great Victoria Street, then changed for an all stops NI Railways train and alighted at Adelaide just as the clouds receded and bright evening light prevailed. 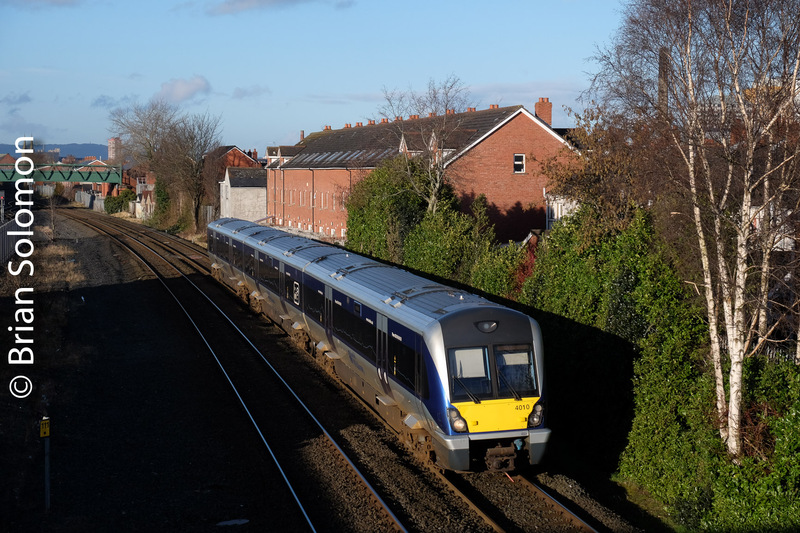 An express to Lisburn passes Adelaide. You’d hardly know that an hour earlier it was lashing rain. 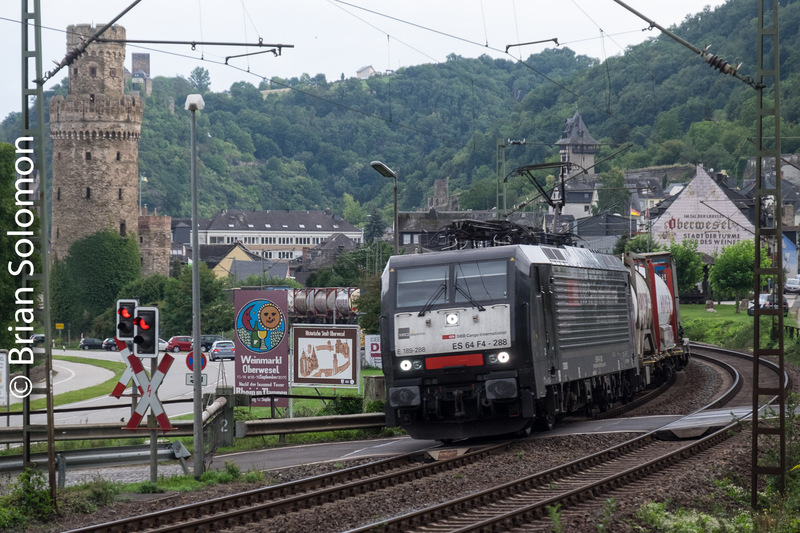 A few minutes later, a 4001-series CAF passes on an all stops service. 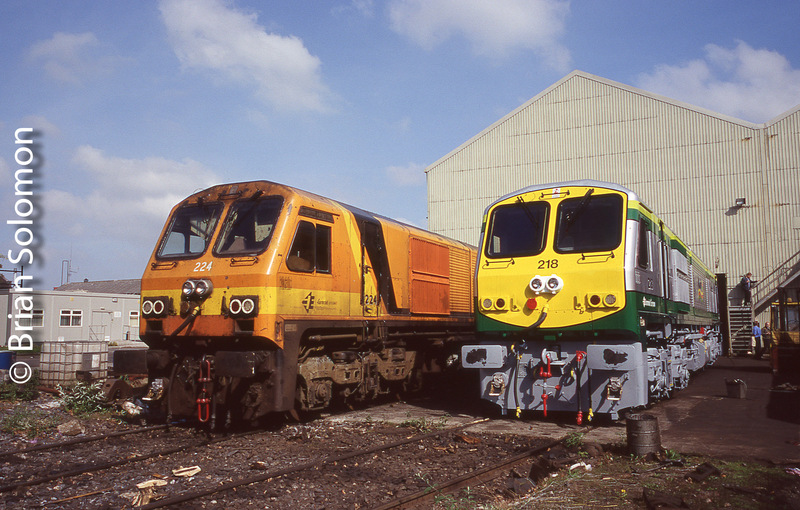 This pair of photos offers a good comparison between the 3001 and 4001 series CAF railcars employed by NIR. 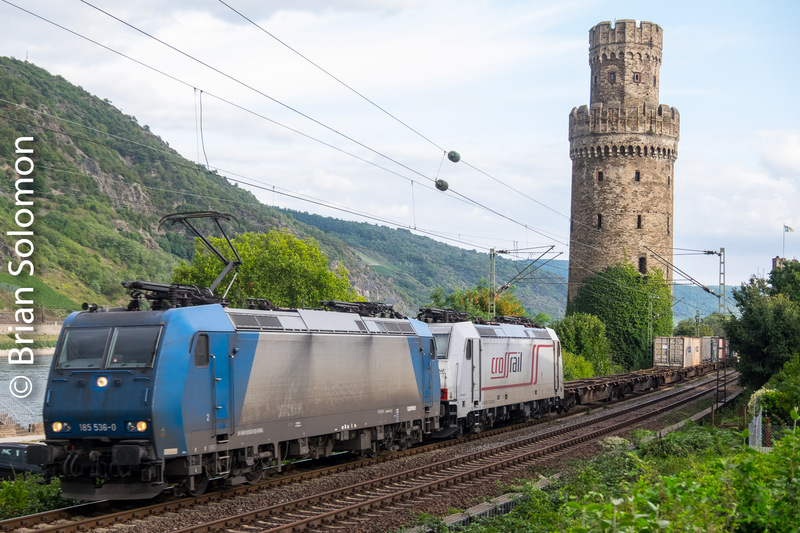 NIR 4010 slows for its station stop at Adelaide. 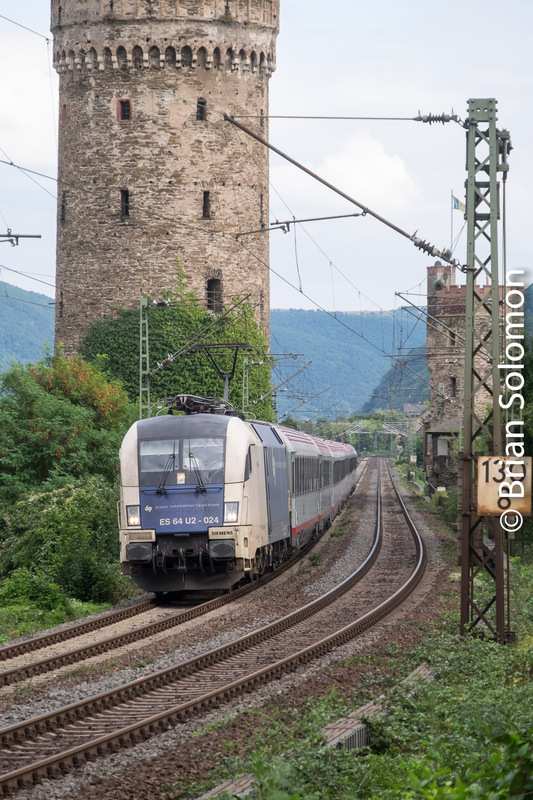 I exposed these views with my FujiFilm XT1 fitted with a Fujinon 18-135mm zoom lens. So I wasn’t a fool in the end; or was I? 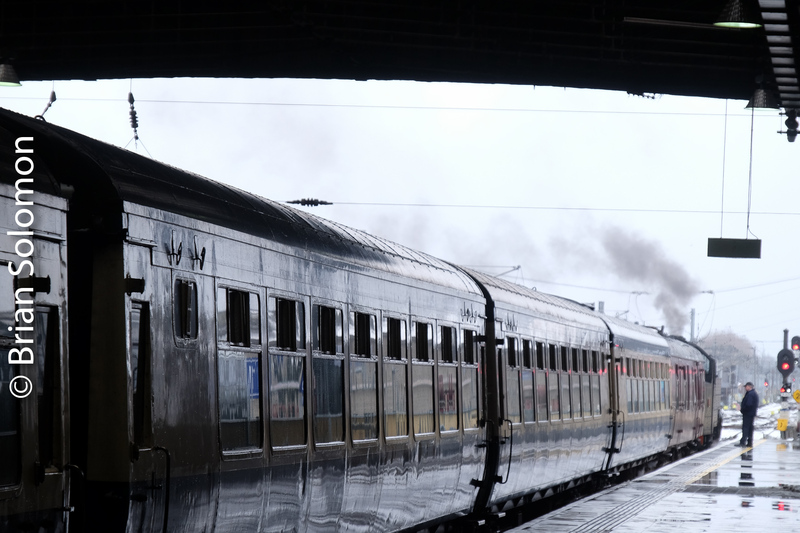 If I’d changed at Portadown, I would have arrived at Adelaide sooner and I may have photographed a train with a rainbow. Looking Down on Great Victoria Street, Belfast. 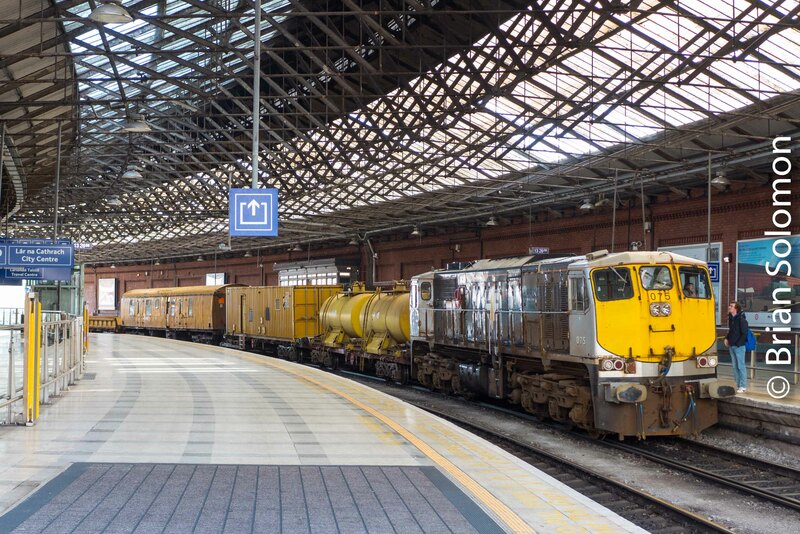 Plans are afoot to redevelop Belfast’s Great Victoria Street Station. 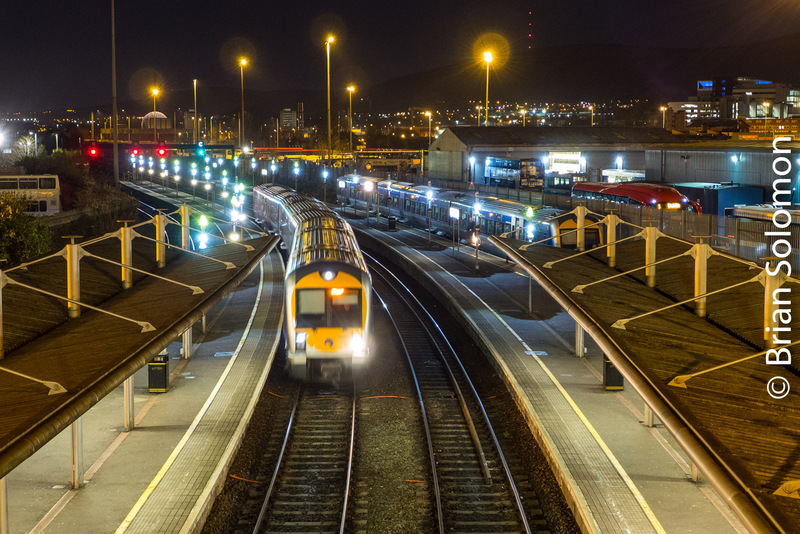 Although NI Railway’s platforms are not an architectural wonder, I’ve been making photos of the present arrangement before it changes. Belfast Great Victoria Street Station from Durham Street. Great Victoria Street at dusk 1/5 second at f1.8 ISO250 with Lumix LX7. 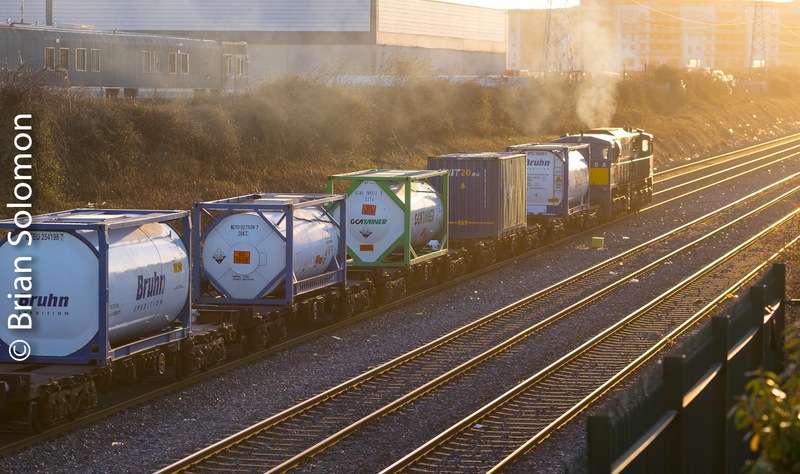 Inbound NIR train arriving Great Victoria Street at dusk 1/5 second at f2.0 ISO250 with Lumix LX7. Great Victoria Street at dusk 1/5 second at f1.7 ISO250 with Lumix LX7. 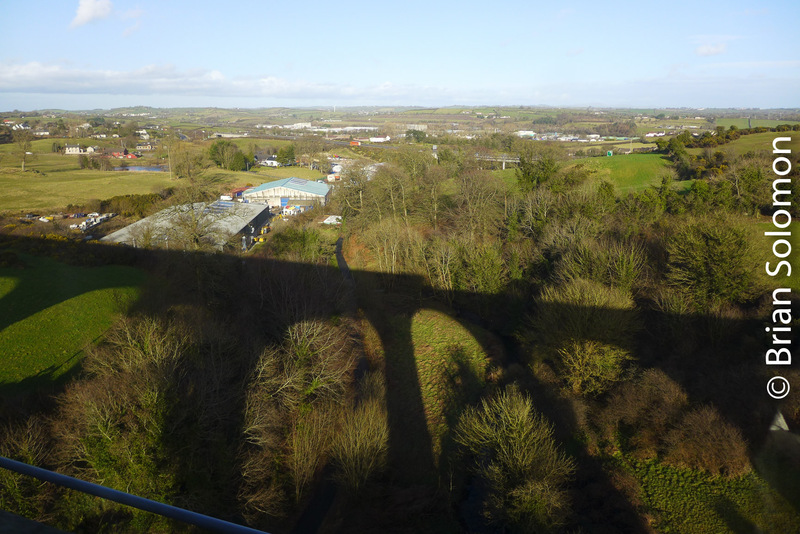 I made these views with my Lumic LX-7 from the Durham Street bridge which crosses above the platforms. Tracking the Light Extra! 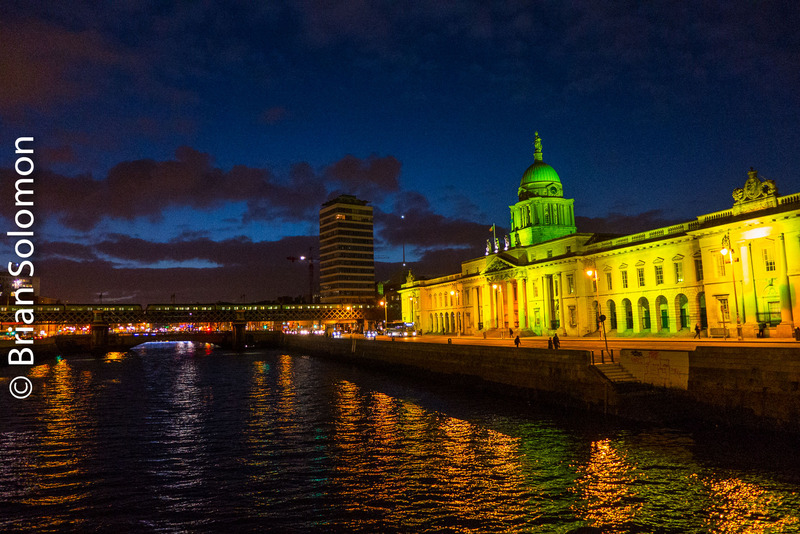 Dublin Greened for St Patrick’s Day 2018! Five NEW photos! Lumix photos by Brian Solomon. Dusk is a great time to capture the light. Once the blue in the sky has faded, the photos just are not as interesting. 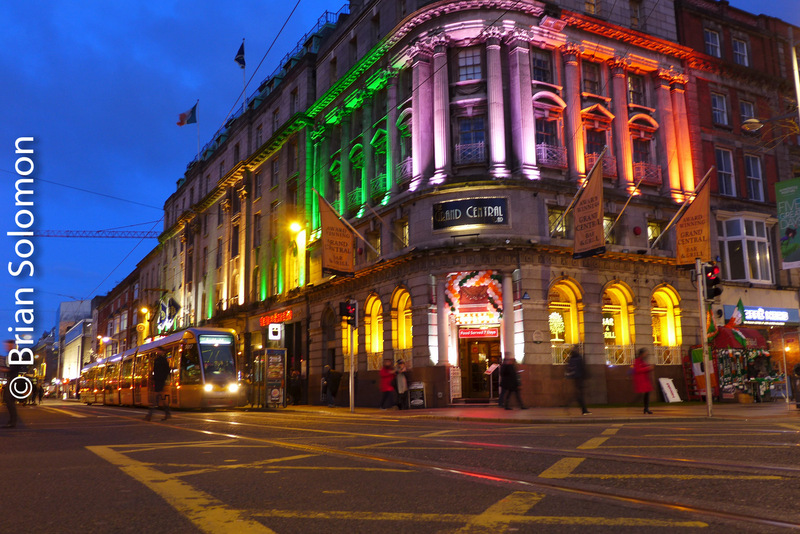 Grand Central at Abbey and O’Connell Street. 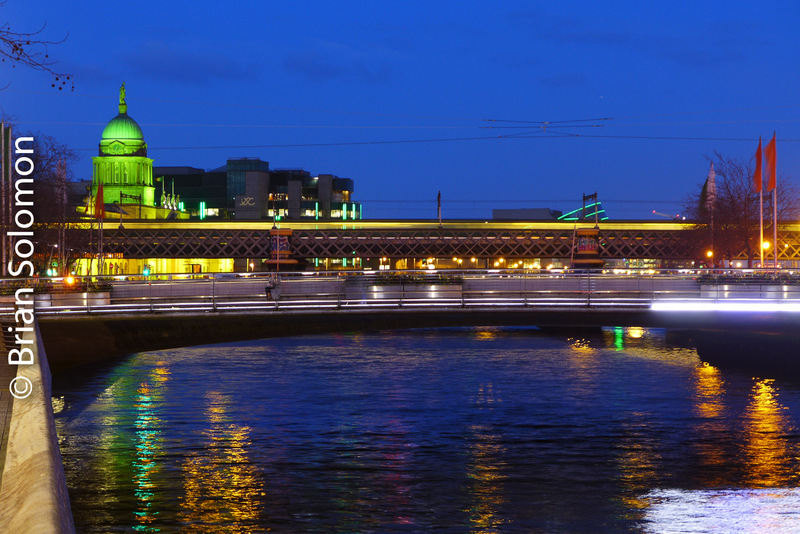 Irish Rail’s Loop Line Bridge with the Custom House. 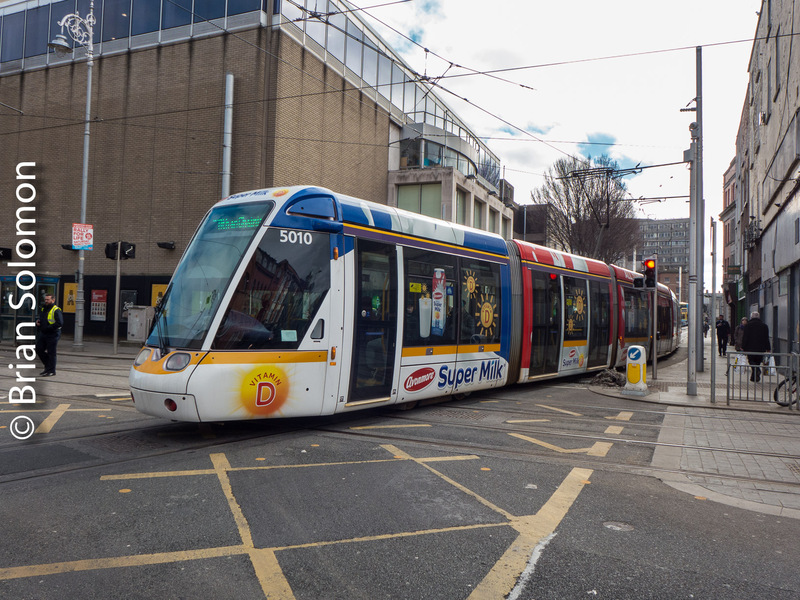 Dublin’s Elusive Super Milk Tram. 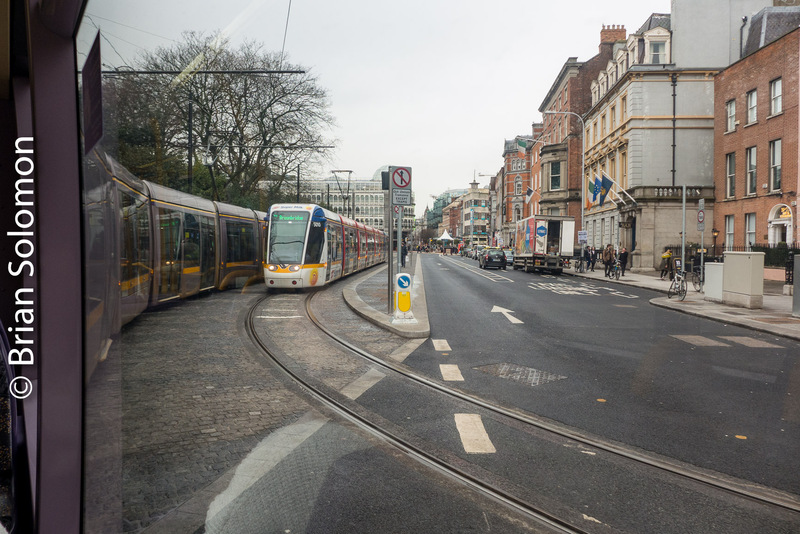 I was on Abbey Street, when I heard the familiar Dong-Dong warning of a LUAS tram . 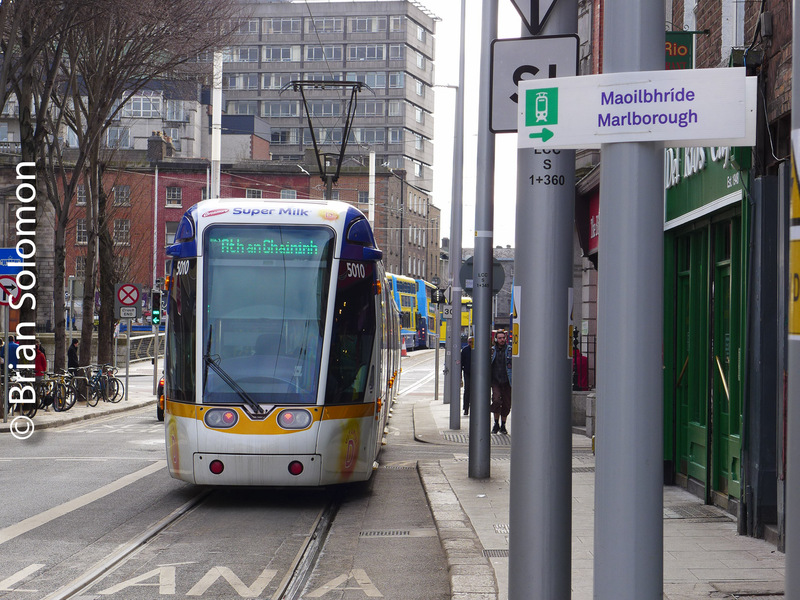 . .
this wasn’t a red line tram, but rather a car working the new Green Line Cross City route on Marlborough Street. 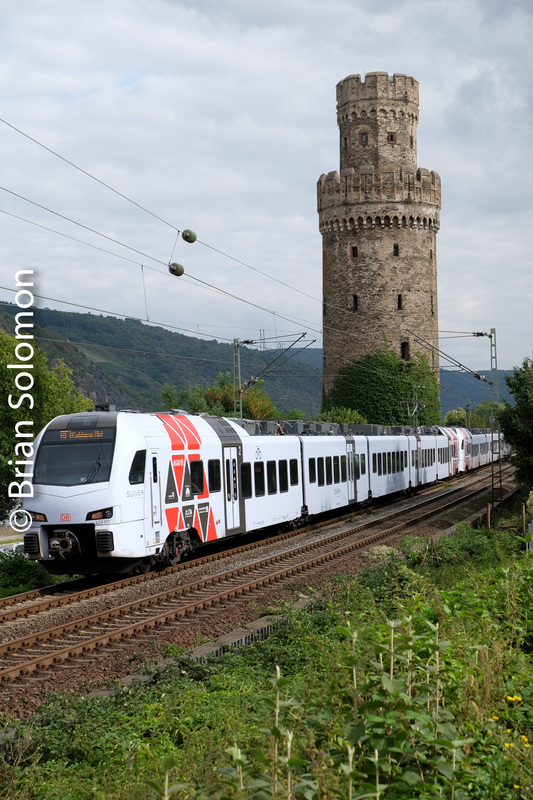 So there it was in all its creamy-whiteness; the red-white-blue Avonmore Super Milk Tram! 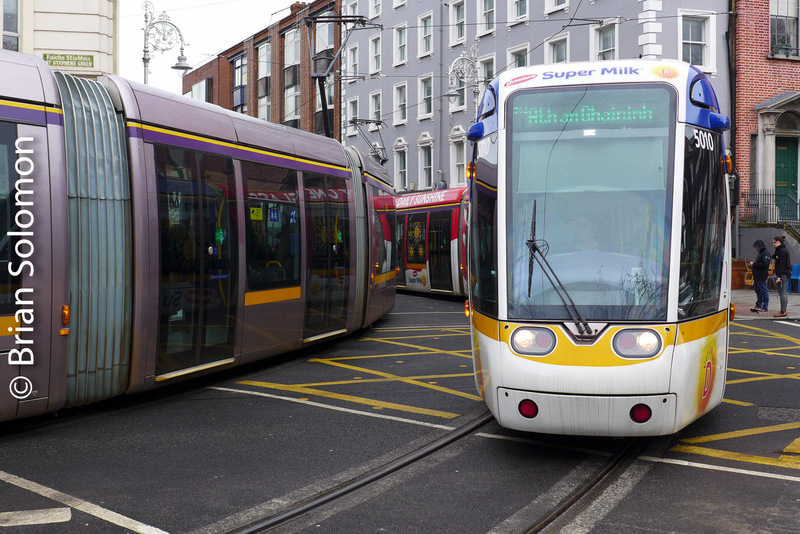 LUAS Tram 5010 painted for Avonmore Super Milk passes the Abbey Theatre. 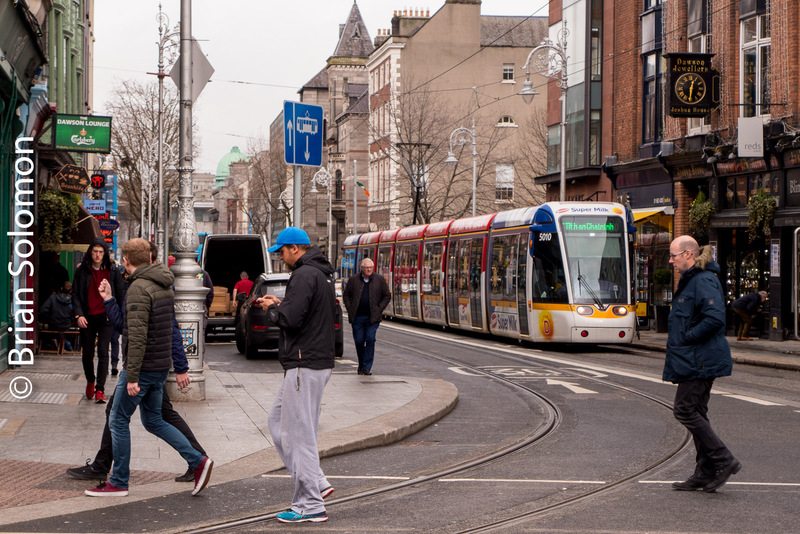 Avonmore Milk Tram in the Dublin City centre. 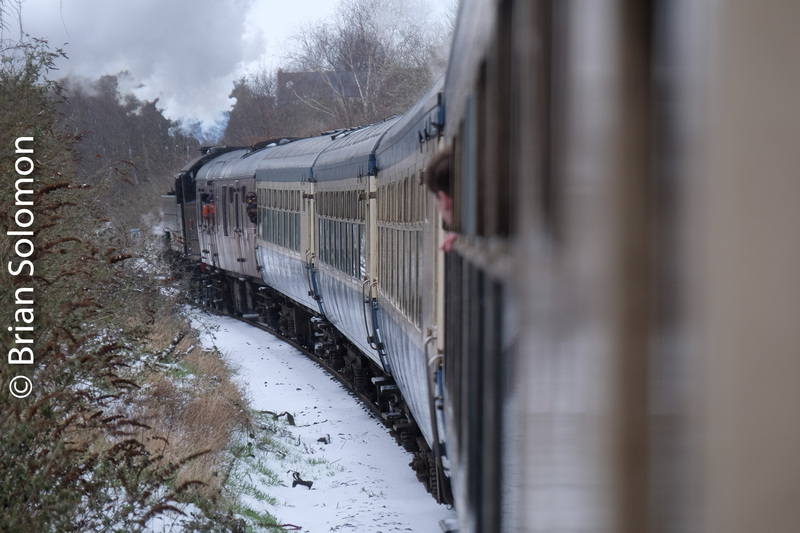 Lucky for me I had my Lumix LX7 at the ready. 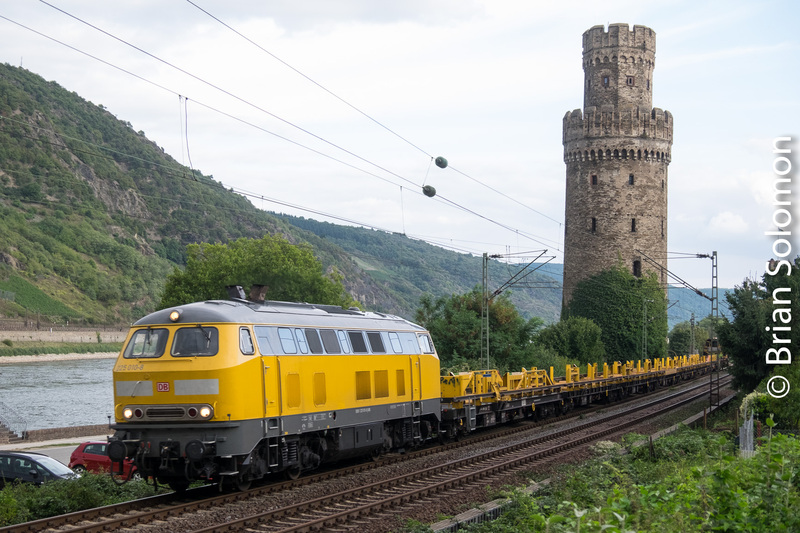 Class 201 Retrospective: Old reliable, 203. 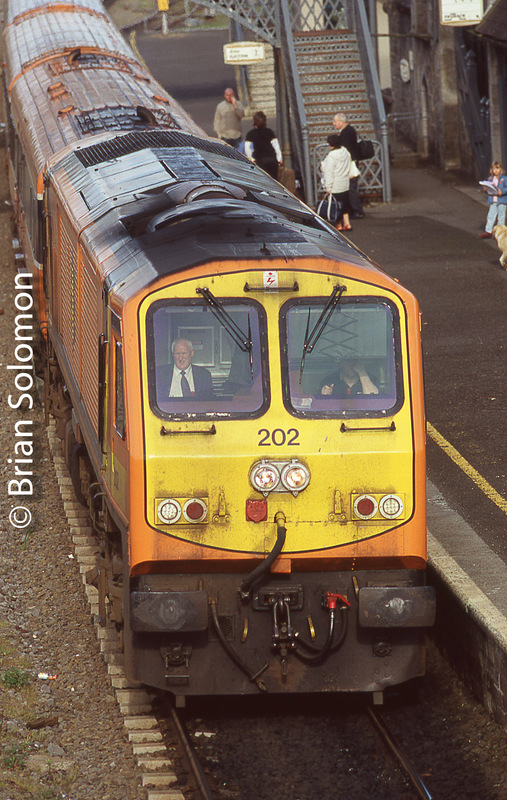 As part of my 20 years in Ireland/201 numerical retrospective, I’ll offer just a couple views of Irish Rail 203. 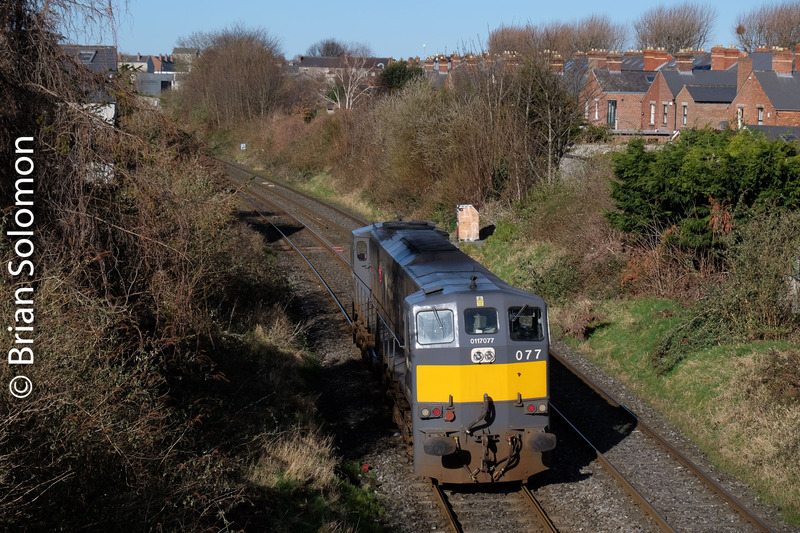 My memories of this engine are largely the blast a horn and the rush of air as it passed with Mark 3 carriages in tow on the Dublin-Cork line. 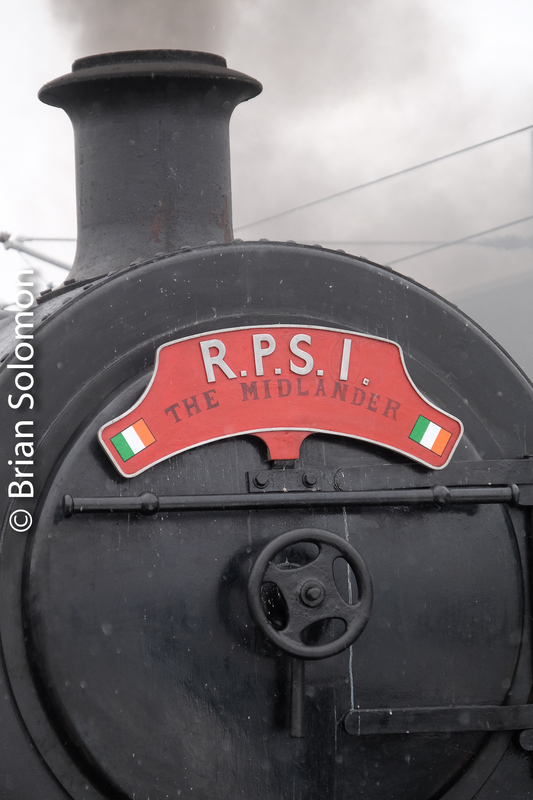 My first summer photographing trains in Ireland was characterised by gray days and dirty 201s. 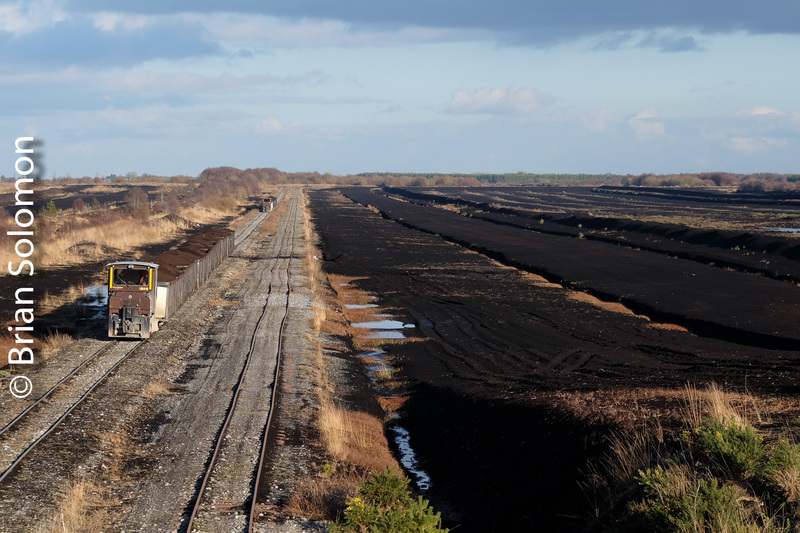 I don’t recall why, but Irish Rail had let its fleet become manky at that stage. 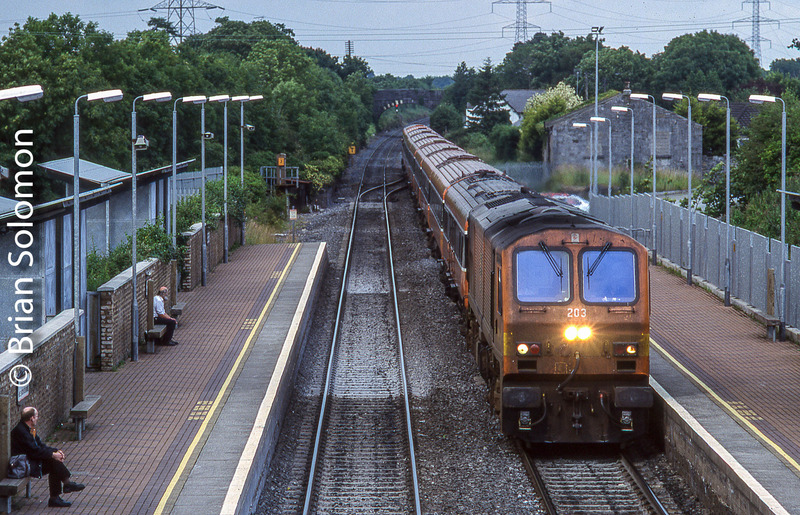 Irish Rail 203 blasts through Hazel Hatch mid summer 1998. Exposed on Fujichrome Sensia 100 with a Nikon F3 and 135mm lens. 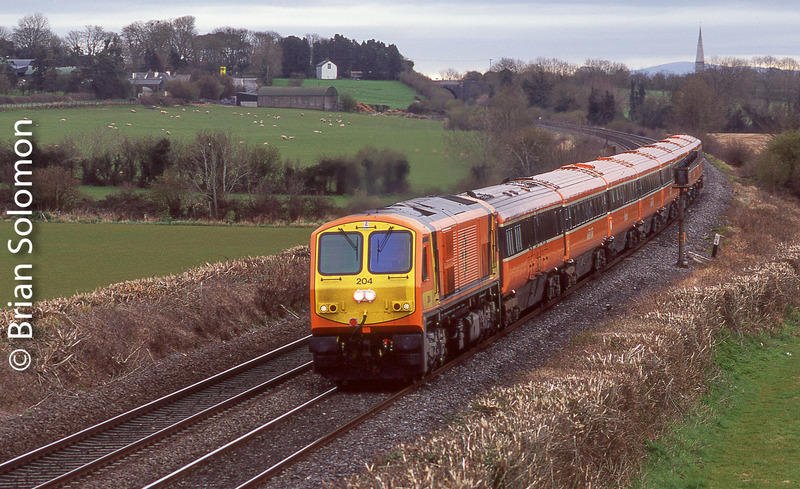 On 23 Jan 2005, Irish Rail 203 approaches Cherryville Junction with a down train from Dublin. Exposed on Fujichrome Velvia with a Contax G2 with 28mm Biogon lens. 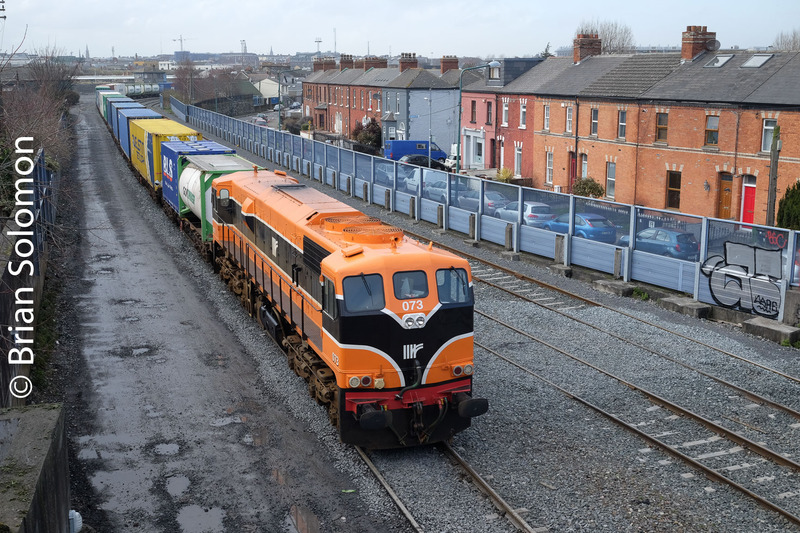 One instance stands out about the others though: I was showing some American friends around the island; we’d borded the Cu na Mara Mark3 international set at Heuston behind locomotive 215 destined for Galway. 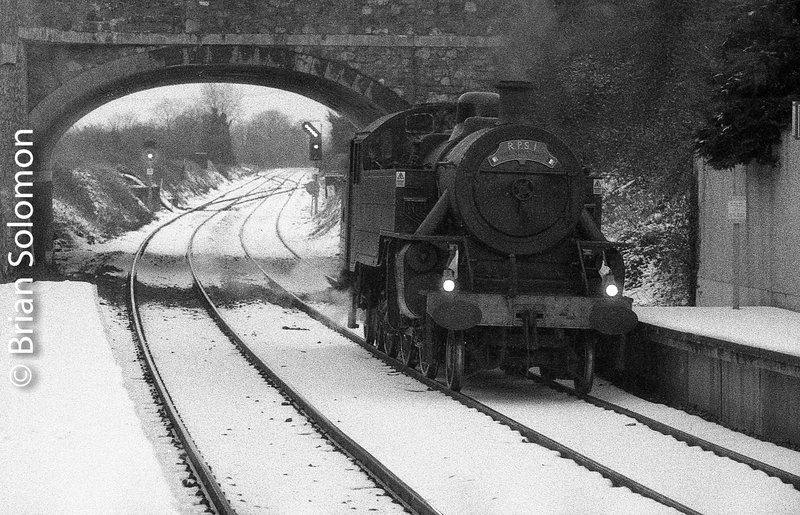 We got as far as Hazel Hatch, when 215 coiled up and we were sent into the loop to await a rescue loco from Inchicore. 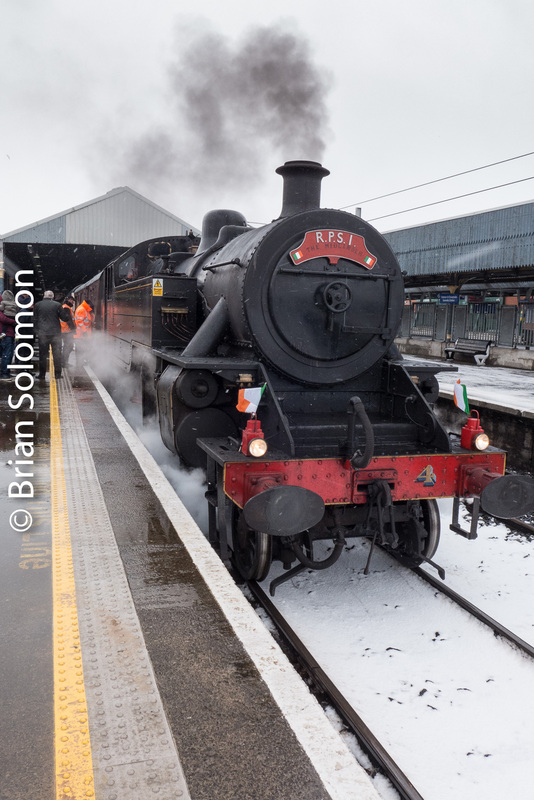 Guess which engine was sent to bring us to Galway? (This is not a trick question). Mechanicville, New York; Then and Now Part 2: Boston & Maine east of Reynolds. 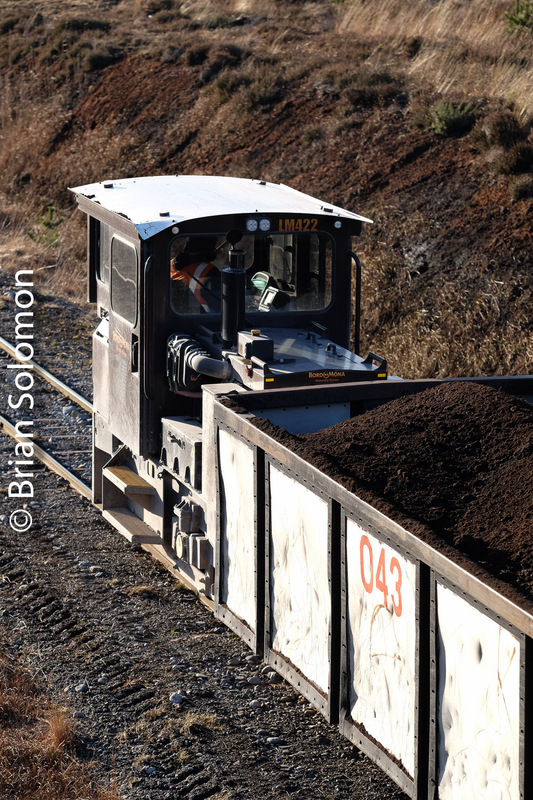 At the end of December 2017, I revisited Mechanicville, New York with an aim of making some contemporary photos at the same angles as images I’d made back in November 1984. Then and Now comparisons are common enough, but what makes these photos significant is that I’ve exposed both the historic photos as well as the modern images using the same type of film and equipment (a Leica IIIA with 50mm Sumitar loaded with Kodak 35mm Tri-X). See: Mechanicville, New York; Then and Now Part 1. 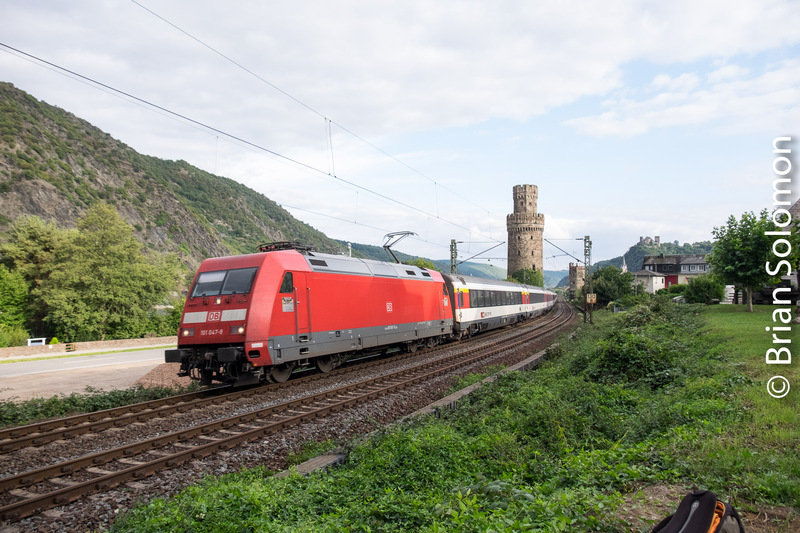 [https://wp.me/p2BVuC-5ha]. 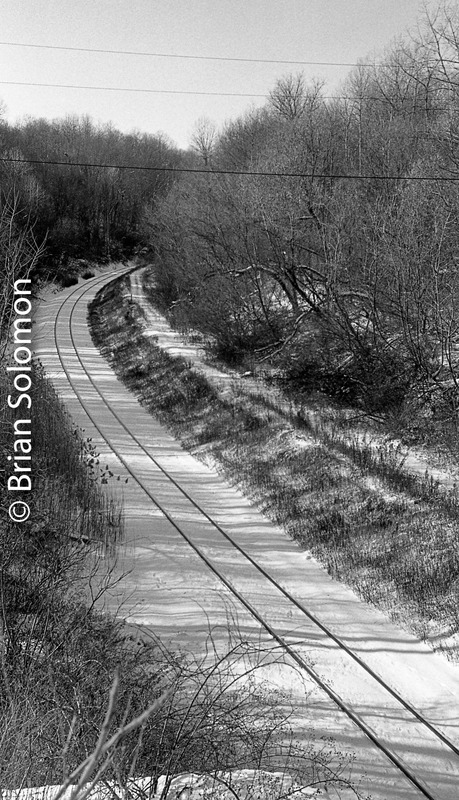 These pairs of photos show the Hansen Road Bridge east of Reynolds, New York, which is just a couple of miles from XO Tower at Mechanicville. 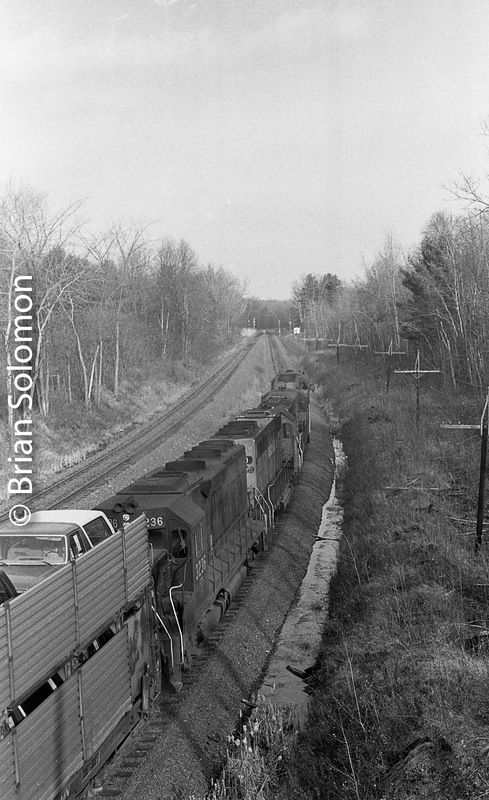 In the 1984 views, my friends and I were following an eastward Boston & Maine train. 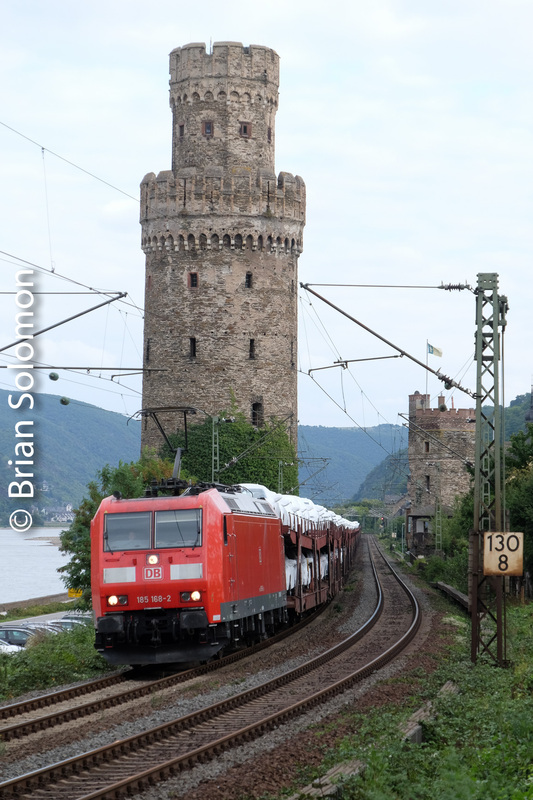 Back then the B&M route was much busier than it is today, although the line still carries a good share of freight. 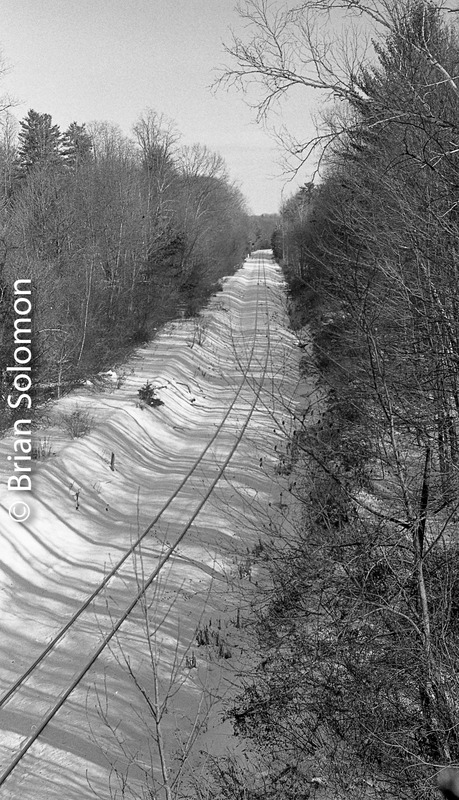 Double track from Mechanicville extended east to an interlocking (which I believe was called ‘Schneiders’) east of Reynolds and near Schaghticoke. 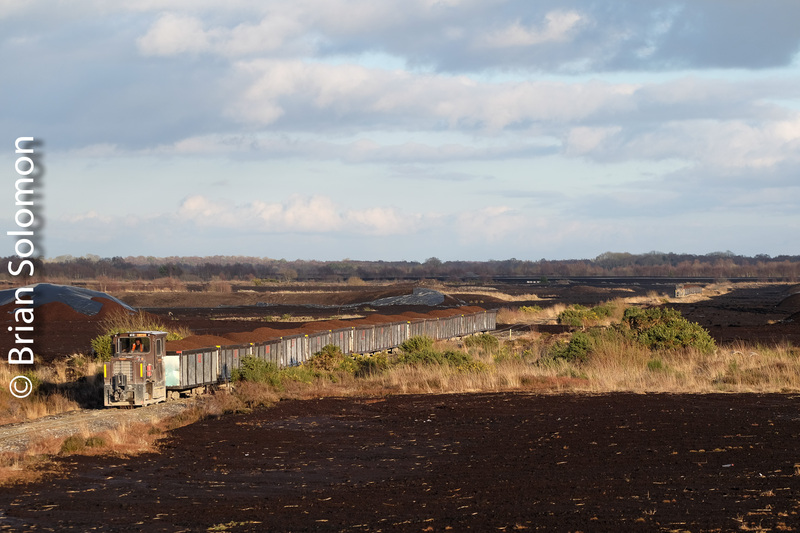 The main tracks were grade separated on approach to the interlocking, which made this a distinctive location. 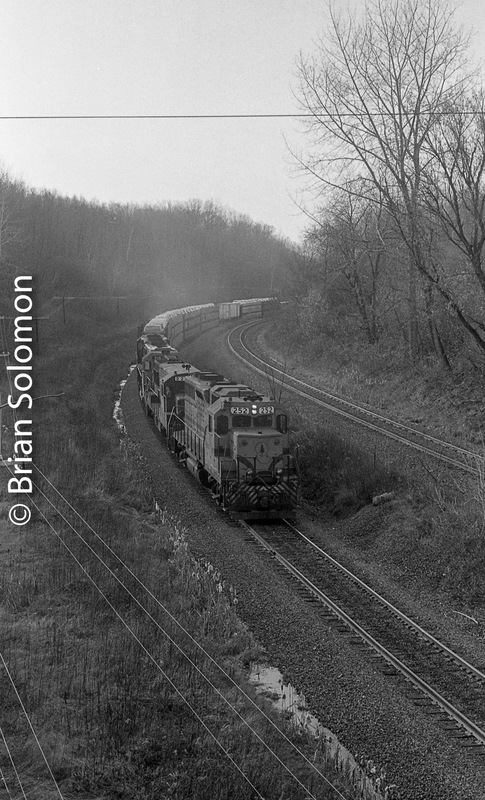 Maine Central 252 leads an eastward Boston & Maine freight at Hansen Road east of Reynolds, New York. 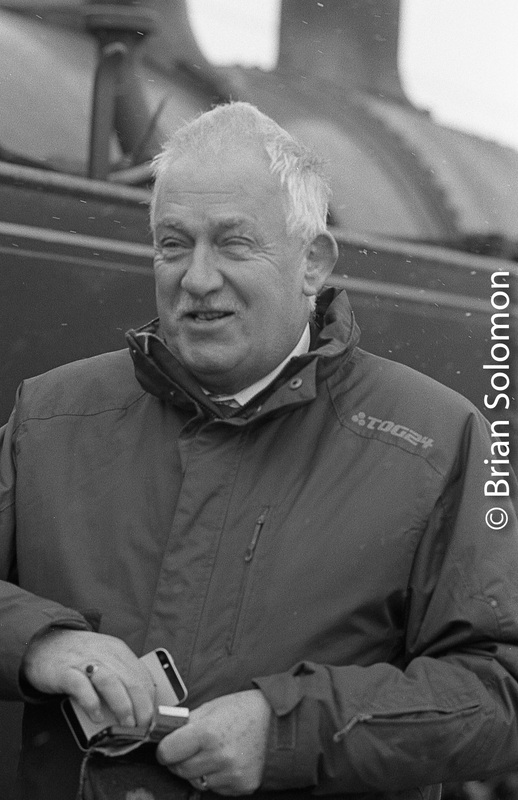 Exposed on Kodak Tri-X with a Leica IIIA with 50mm Sumitar. 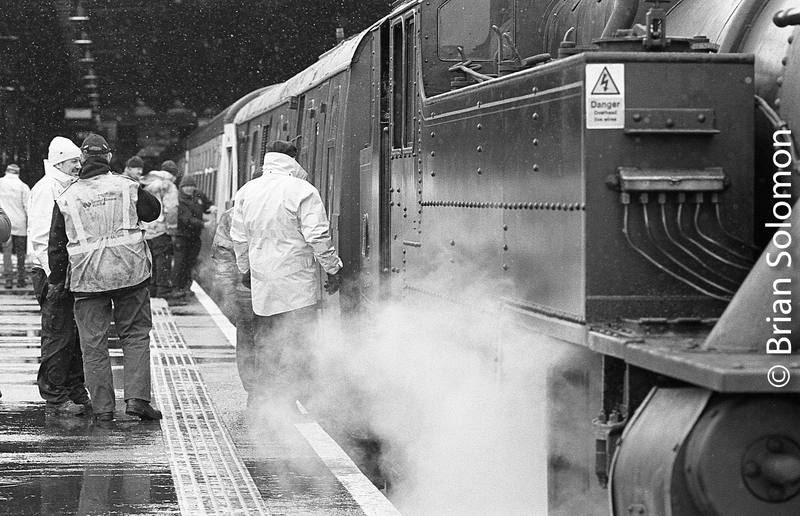 November 1984. 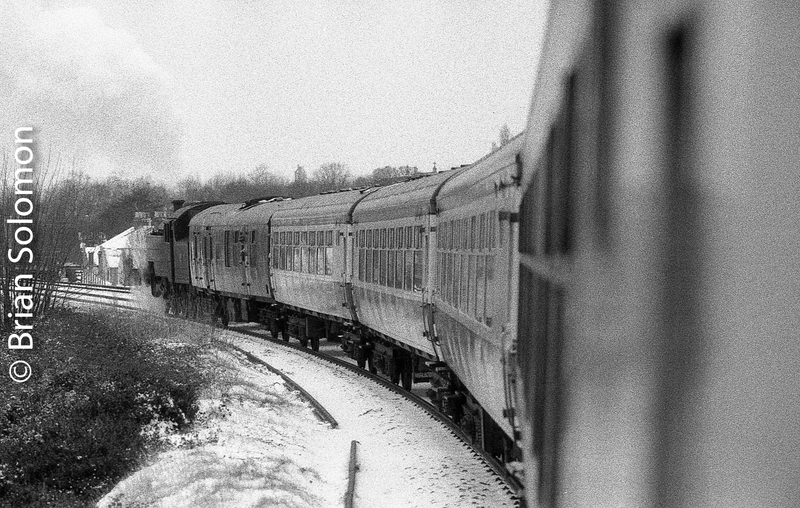 Comparison view on December 29, 2017 also with a Leica IIIA, 50mm Sumitar and exposed on Tri-X. 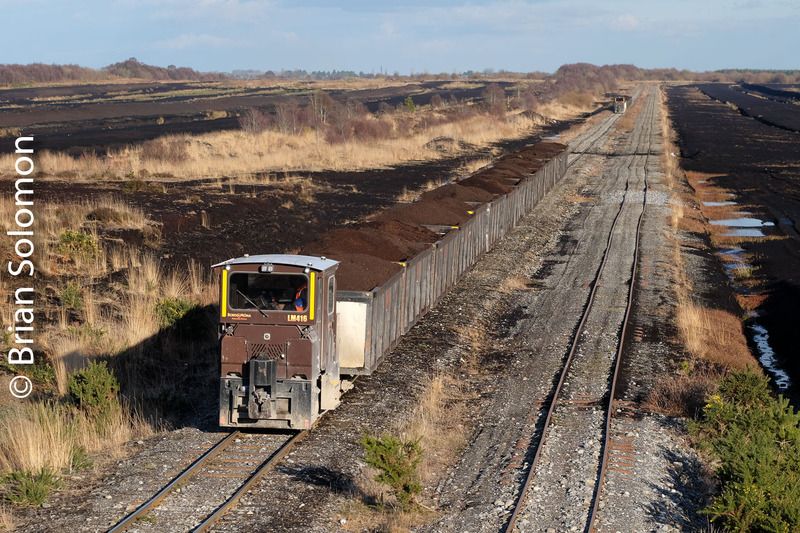 Sorry there’s no MEC GP38 in this view! (You’ll need to visit the Conway Scenic to see that). 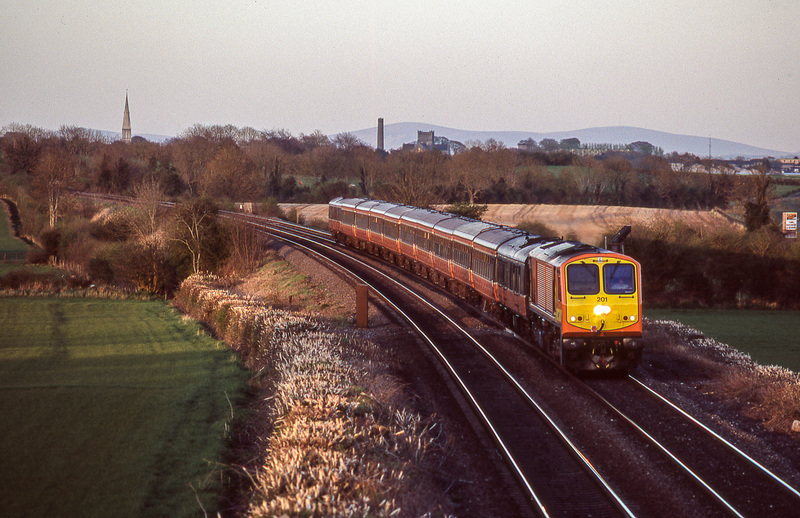 The other main track was lifted in the early 1990s after a decline in freight traffic on the B&M route. 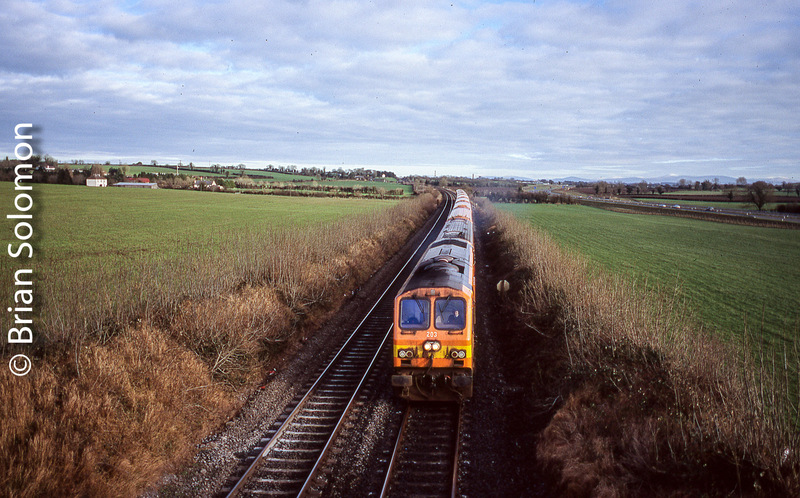 Trailing view from Hansen Road, November 1984. The open top auto racks really date the photo. Comparison view from Hansen Road on December 29, 2017. The trees have really grown up in the last three decades. 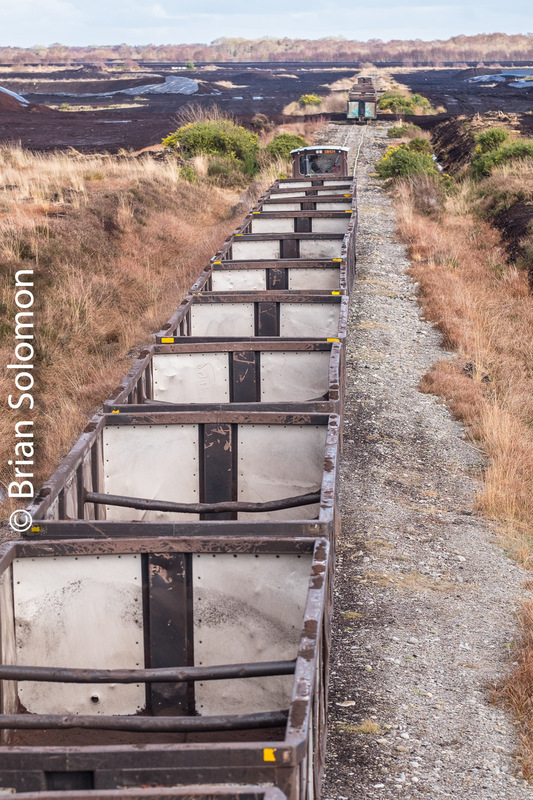 In the 33 year interval between photos, the Hansen Road bridge was replaced, which slightly alters the angle for photography. 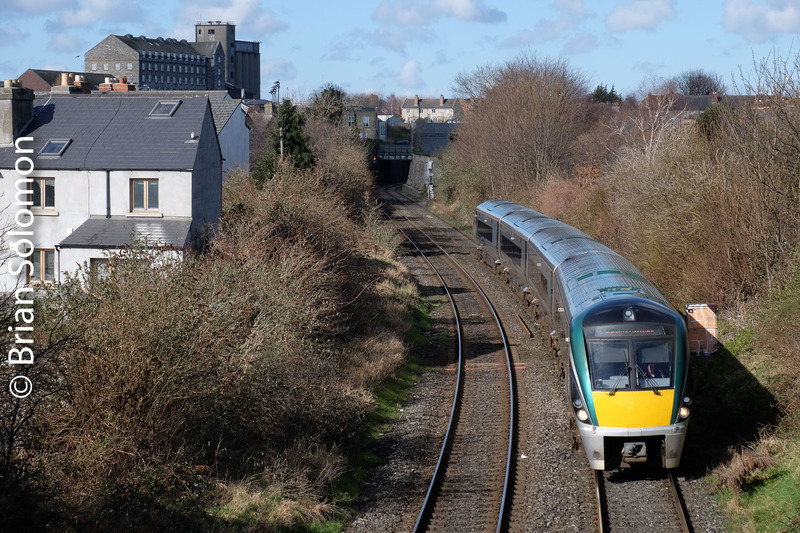 Irish Rail ICR and Sperry Train at Mallow, County Cork. 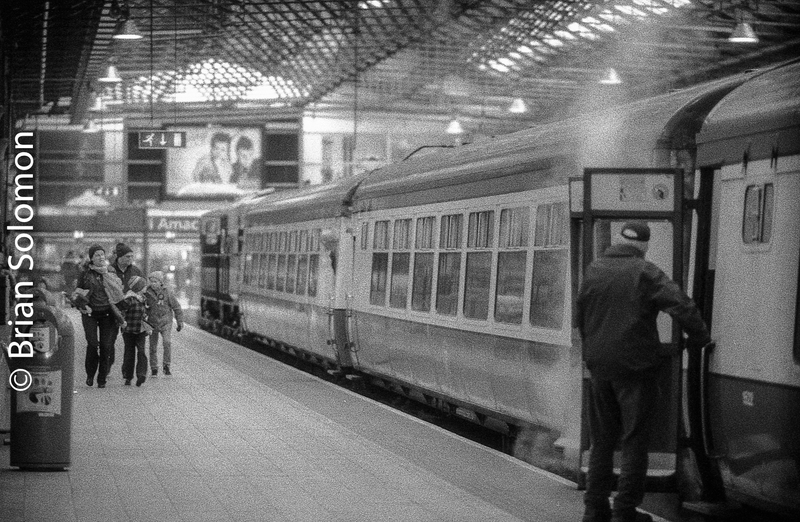 For me, sometimes black & white film provides the best medium for capturing a scene. 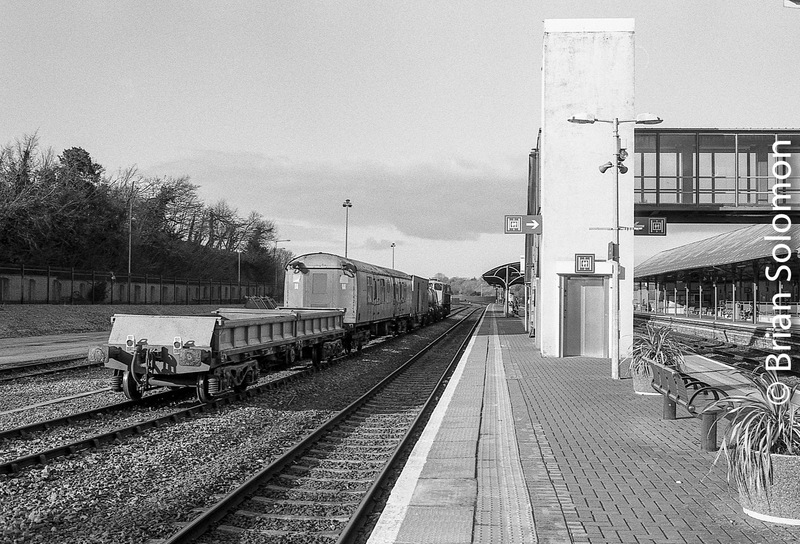 Working with my Nikon N90S loaded with Ilford FP4 black & white film, I exposed this sequence of photographs at Mallow, County Cork. Soft afternoon sun provided some nice light; just the sort of low sun that allows for tonality and texture to be interpreted on black & white film. 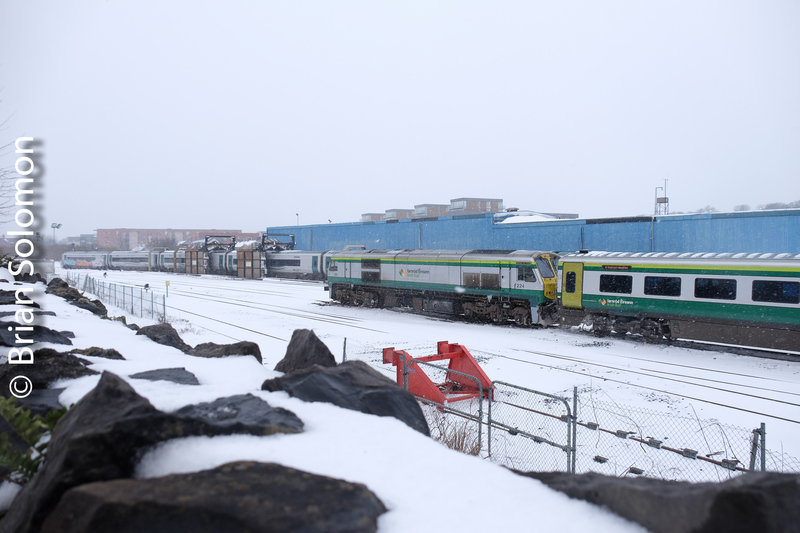 Irish Rail 075 rests in the Mallow yard with the Sperry rail defect detection train. 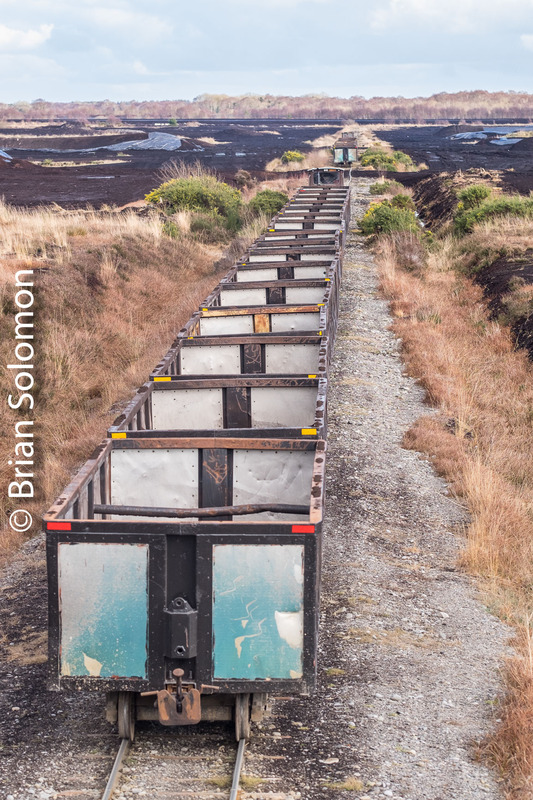 The addition of a spoil wagon at the back of the Sperry consist was unusual and worth of a few photographs. 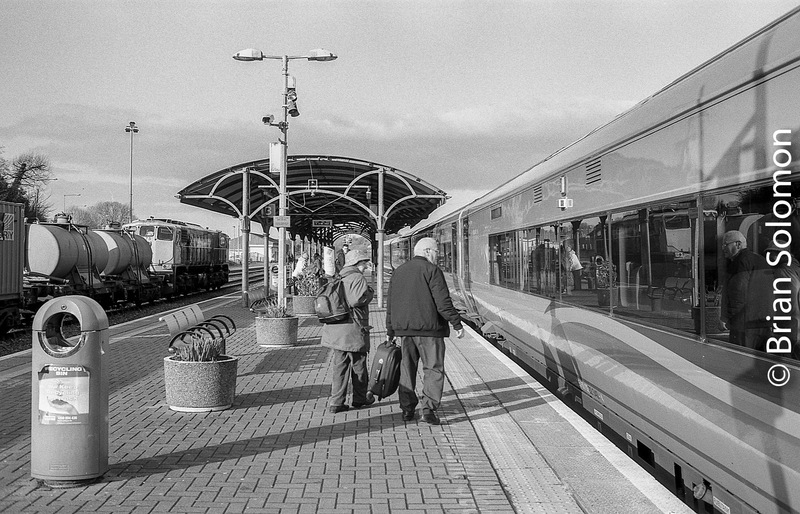 Filtered sun makes for contrast and tonality well suited to black & white film. I exposed these views using my Nikon N90S with 35mm f2.0 Nikkor AF Lens. 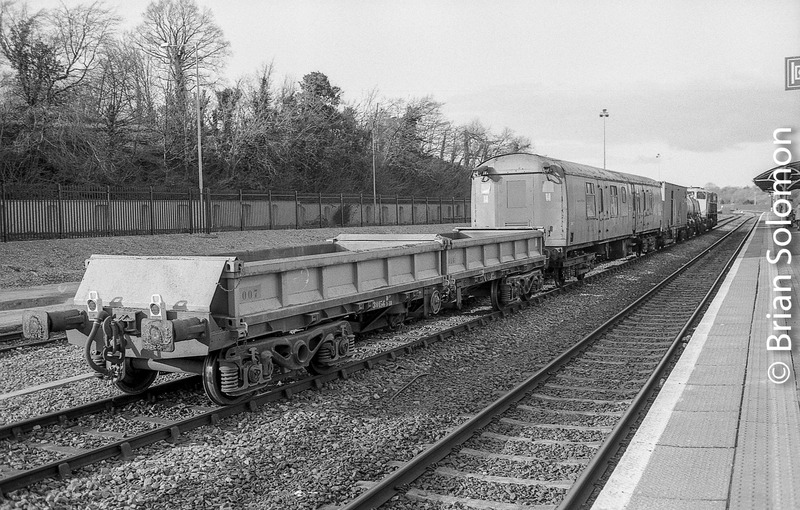 An Irish Rail ICR (InterCity Railcar) arrives at Mallow from Cork on its way to Dublin. 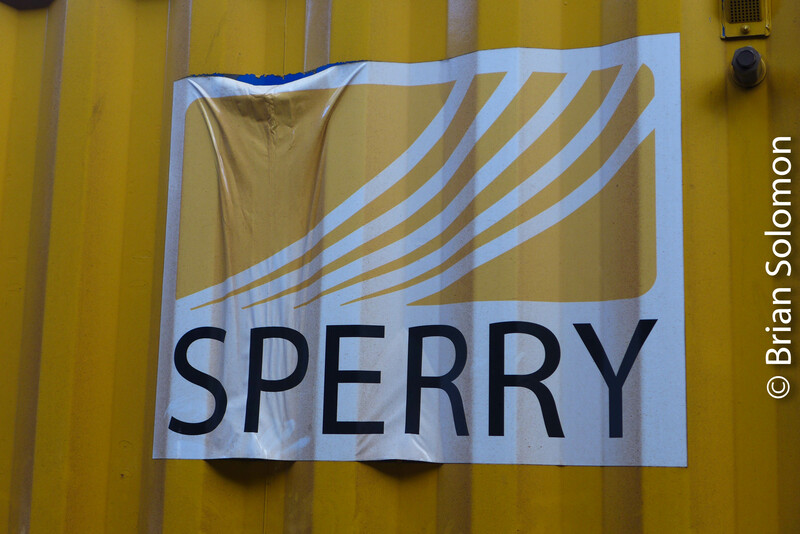 Here’s a contrast between the antique looking Sperry train and the sleek ICR. 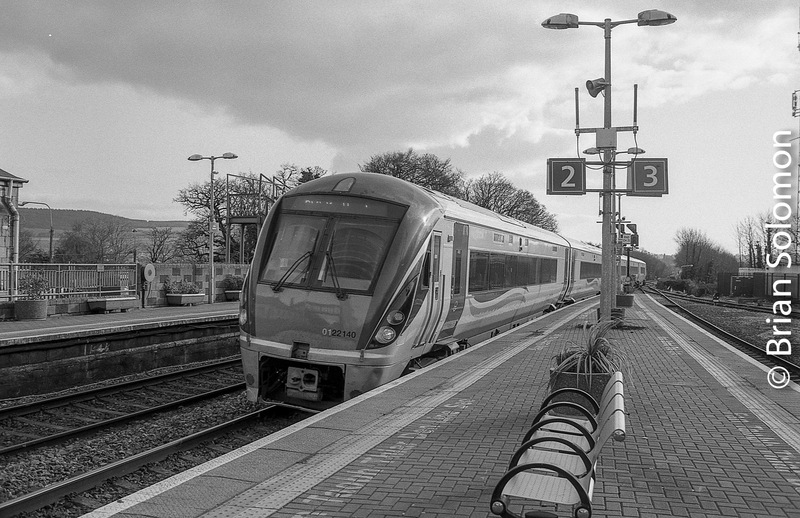 Previously, I’d struggled with FP4 to get a range of tones that satisfy me. 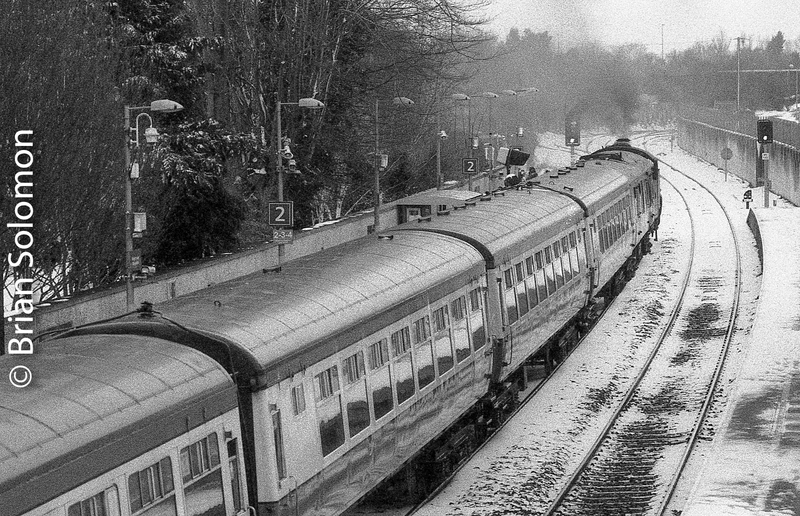 With this roll of film, I used Ilford ID11 stock solution without dilution at 68 degrees F (20C) for 5 minutes, with only a short water bath prior to develoment. Although, my negatives still required a touch of contrast adjustment in post processing, I’m very happy with the way they turned out. 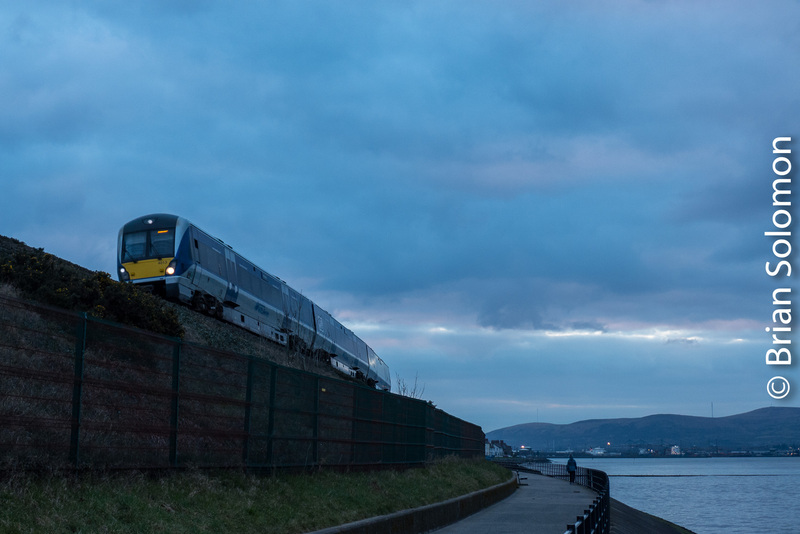 At Holywood, NI Railways skirts the Lagan estuary on its way from Belfast to Bangor. 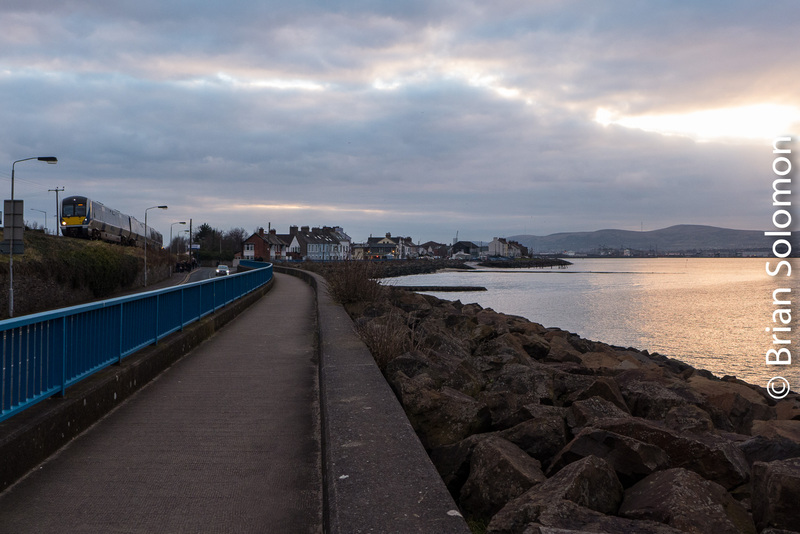 Although a mostly overcast afternoon, hints of colour and the occasional shaft of light appeared in the evening sky. 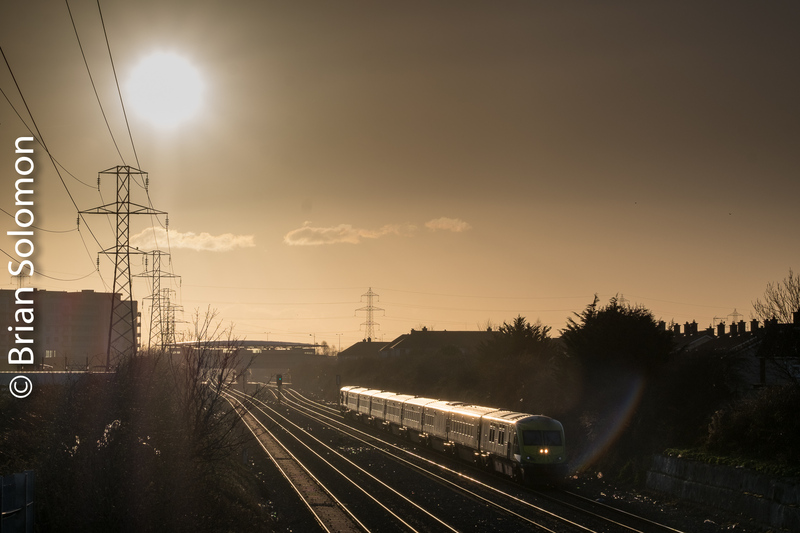 I’d been trying to put the pieces of a lighting puzzle together where I could feature an NIR train with the dramatic sky, but I didn’t manage to get what I envisioned. 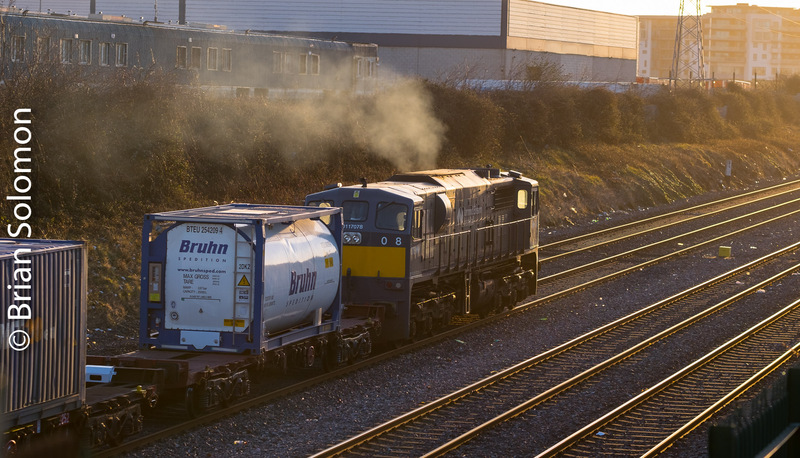 By the time I found the optimal location for a photo with a train, the really dramatic light had faded. I exposed these views with my Lumix LX7. Sunset over the Lagan looking toward Belfast. Exposed with m Lumix LX7. 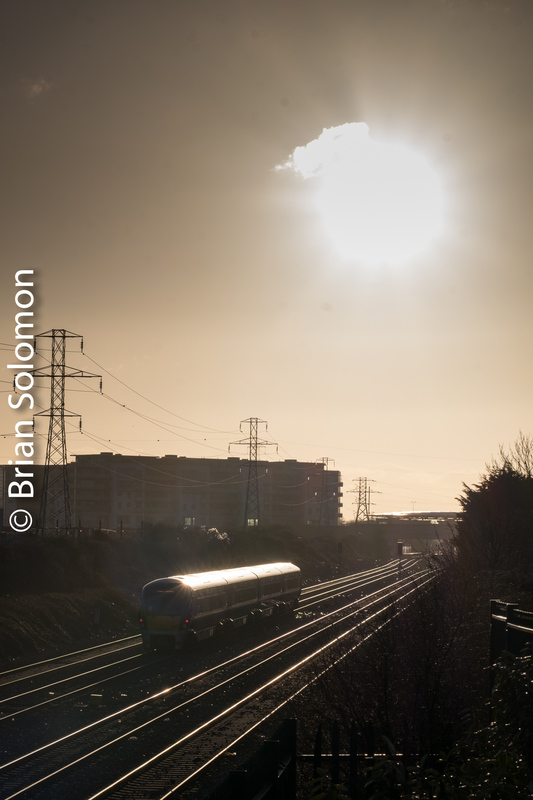 This location would have made for a perfect angle of a train with the dramatic sky, but by the time I reached this spot the light had faded. You can’t win all the prizes. 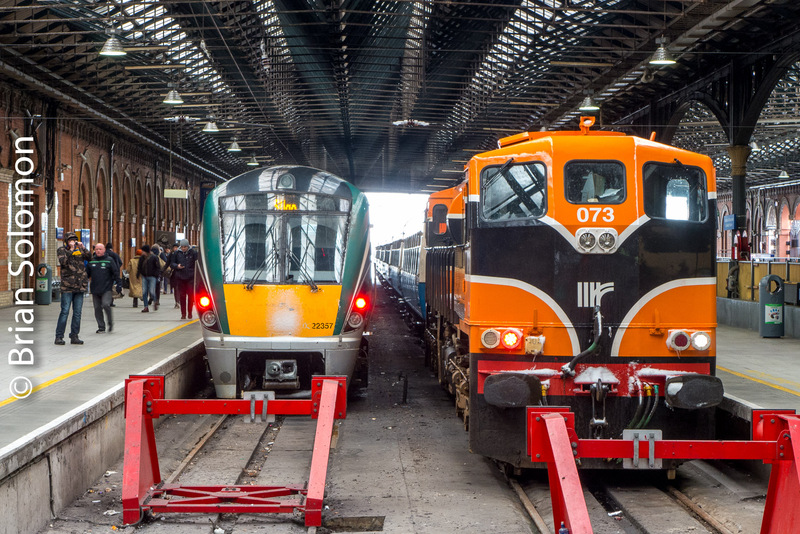 To mark my twenty years photographing Irish Railways, I thought it would be a neat exercise to display images of each of the 201-class General Motors diesels in numerical order. I’ll intersperse these posts with other Tracking the Light features. Today, I’m beginning with the class leader. 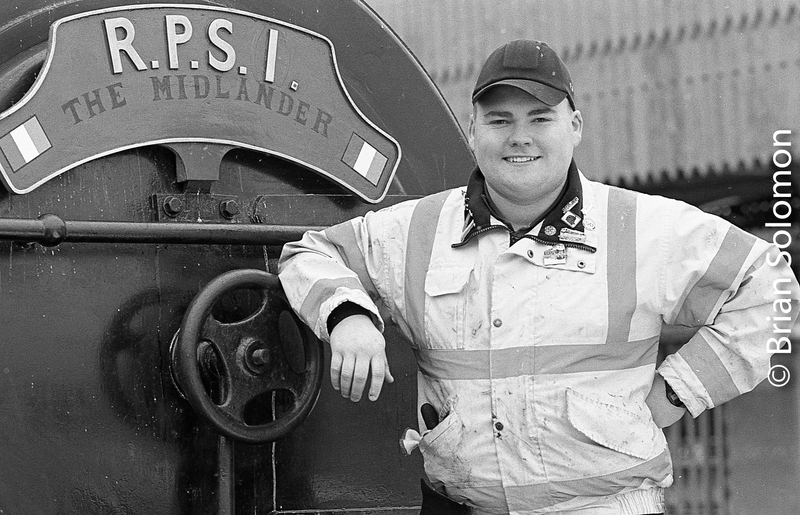 This engine famously arrived in Ireland in a Russian-built cargo plane. 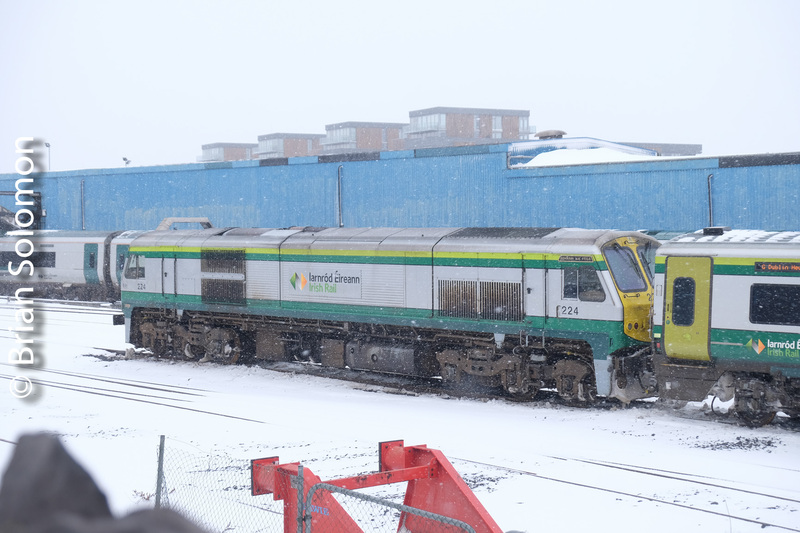 That event was before my time in Ireland, but I made hundreds of photos of engine 201 around Ireland before it was withdrawn from traffic and stored at Inchicore. 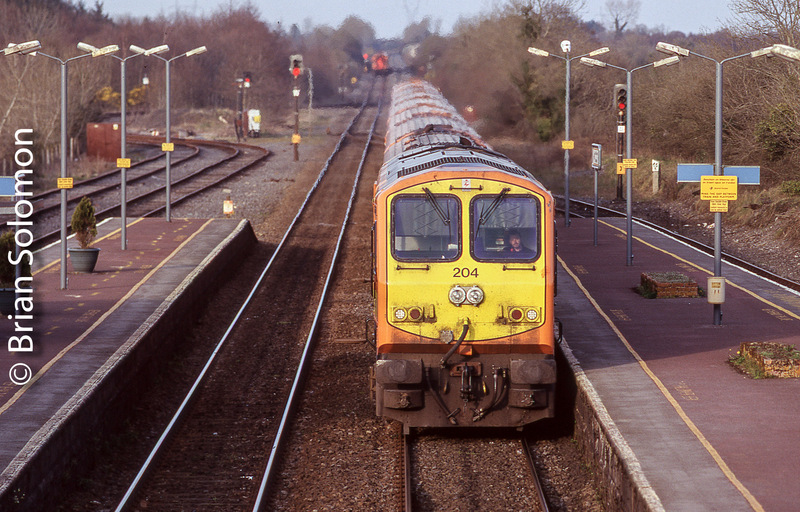 On 23 May, 2003, Irish Rail 201 leads a Dublin-Galway train at Athenry. Exposed with a Contax G2 with 28mm lens on Fujichrome Sensia. 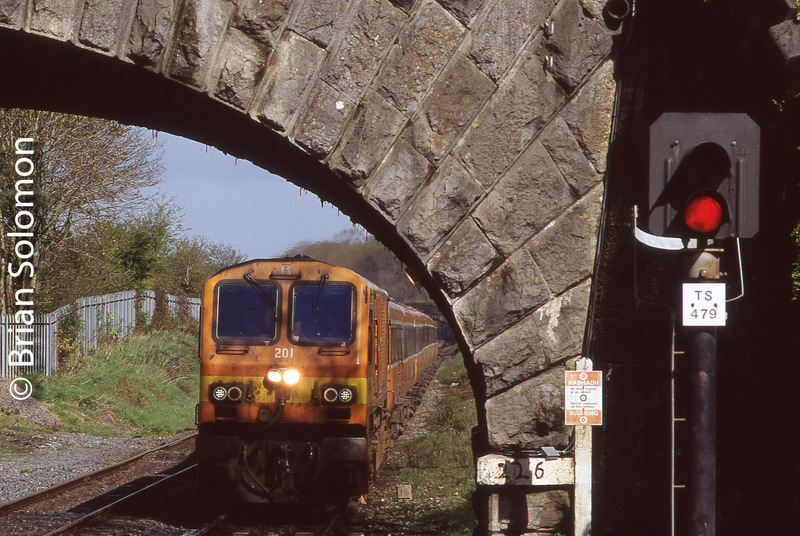 It was on 6 April 2005, that I framed Irish Rail 201 in the bridge arch at Thurles, County Tipperary. Exposed on Fujichrome with a Nikon F3 with 180mm Nikkor lens. 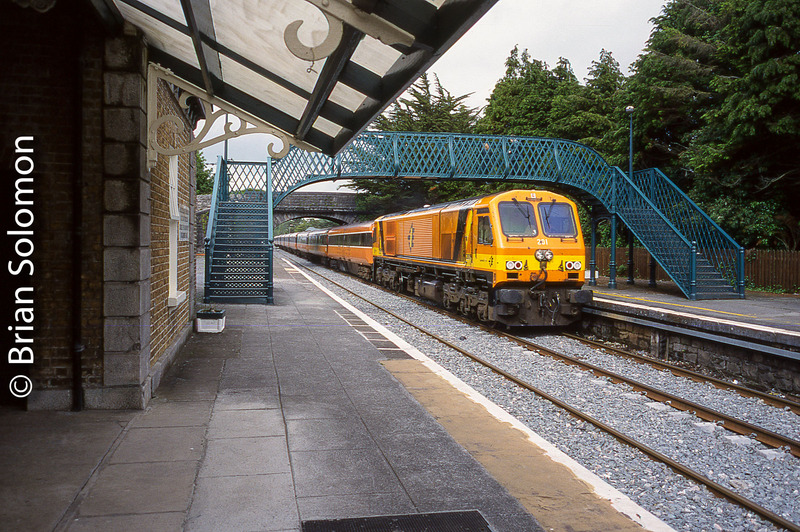 Begin in 2005, Irish Rail began applying a variation of its orange and black livery to the 201s that featured largely yellow ends to make the locomotives more visible. 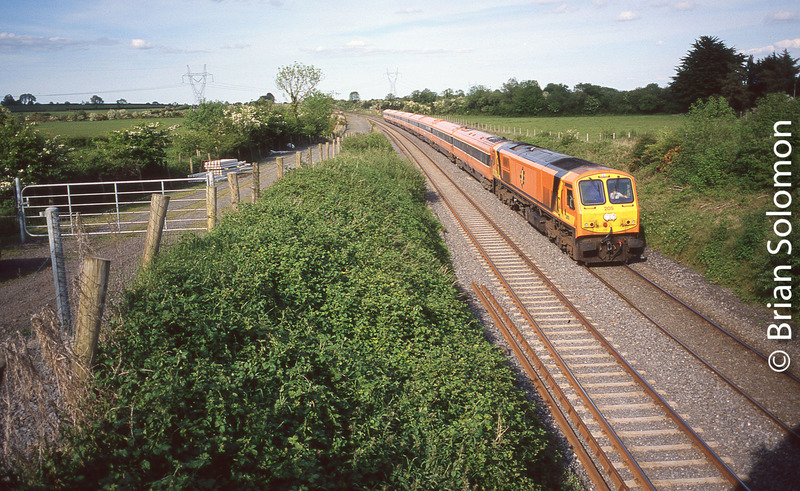 Class 201 works a Rugby special at Cherryville Junction in 2006. Exposed on Fujichrome with a Nikon F3 with 180mm lens. 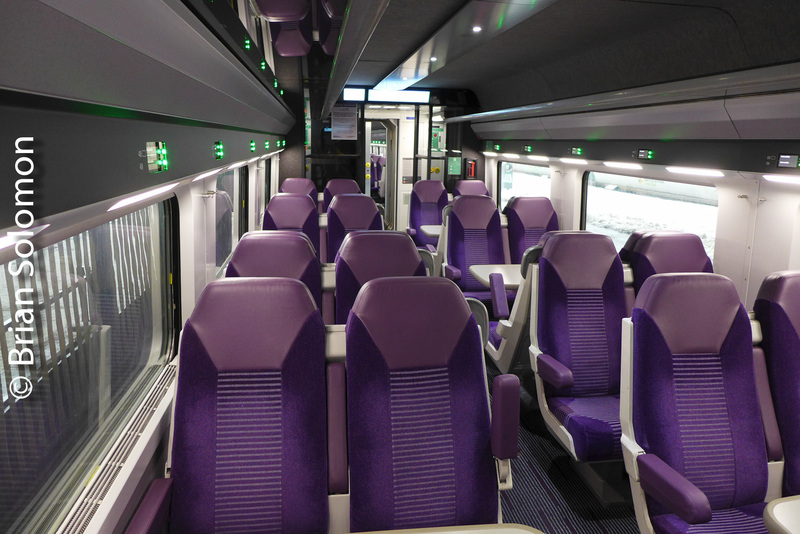 Next in this series, I’ll feature never before published photos of Irish Rail’s very elusive 202. 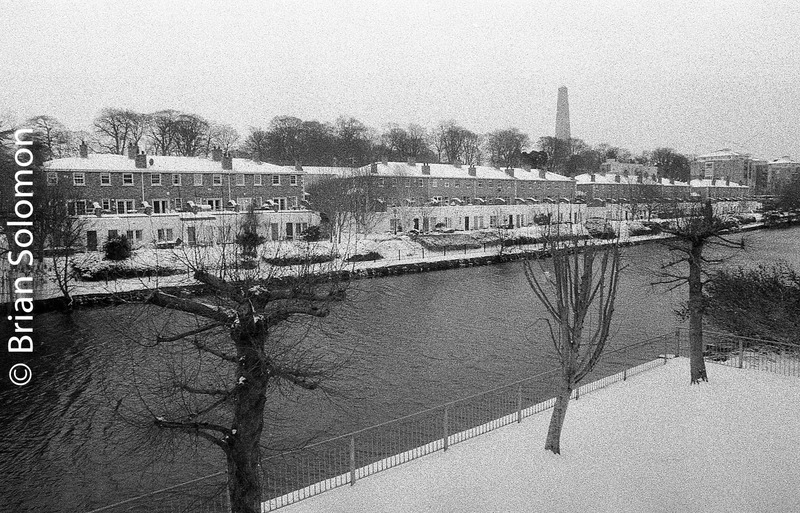 Retropan Test—Further Experiments with a New Emulsion. 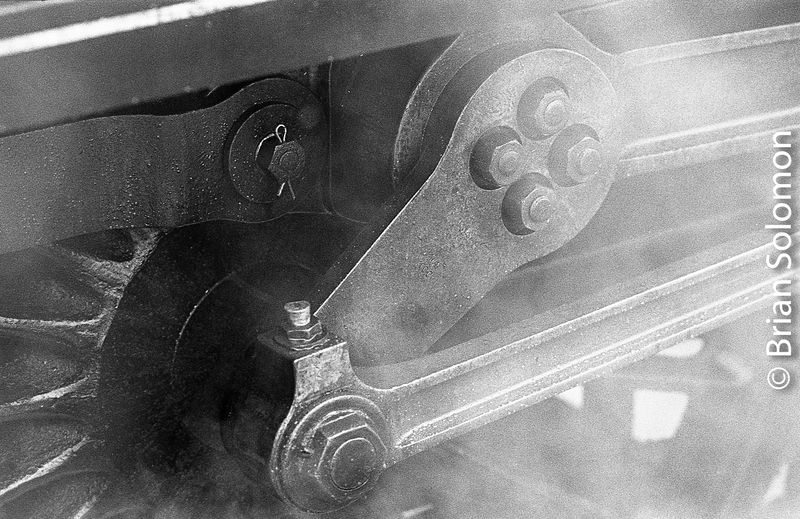 Tracking the Light focus on creating photos and this post is about the nuts and bolts of working with black & white film, and pursuing means to refine the process. 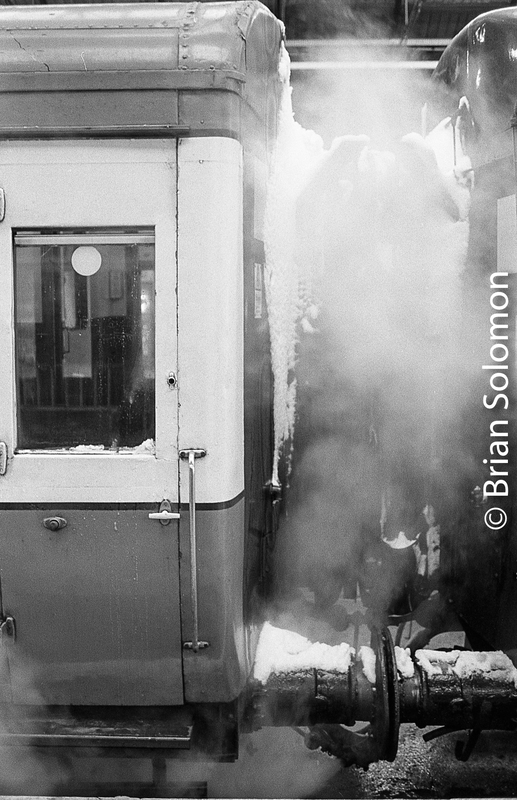 What better way to spend a damp, windy snowy day, then to expose and process black & white film in new ways? I’d read about ‘stand processing,’ but I’d never tried it. 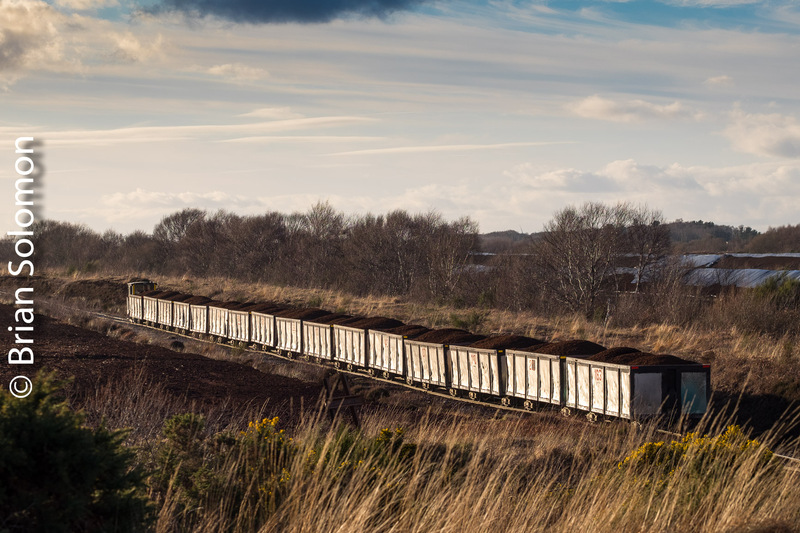 Stand processing uses developer at very low-concentration with virtually no agitation for very long process times. Among the potential advantages of stand processing is greater tonality with exceptional highlight and shadow detail. A secondary benefit is that it requires much less developer. Also, I wondered if I could better control granularity by eliminating the effects of agitation (the answer from this test was: no). 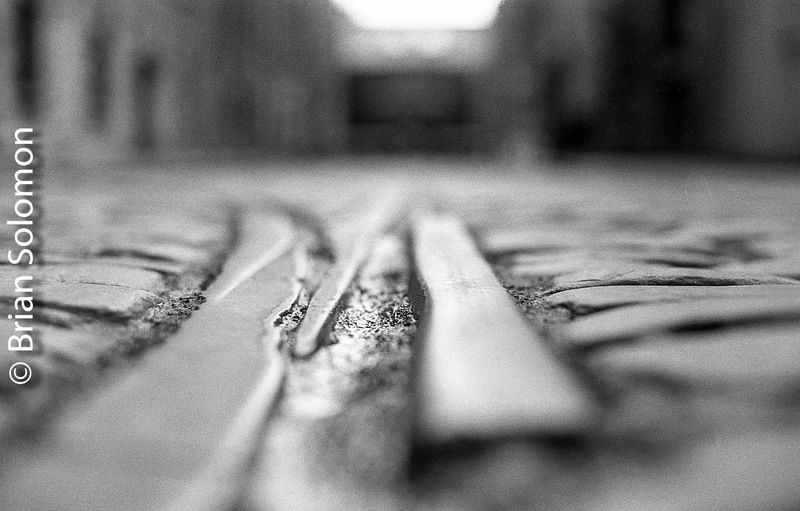 I’d previously experimented with Foma Retropan, a modern film rated at 320 that emulates the effects of traditional emulsions. 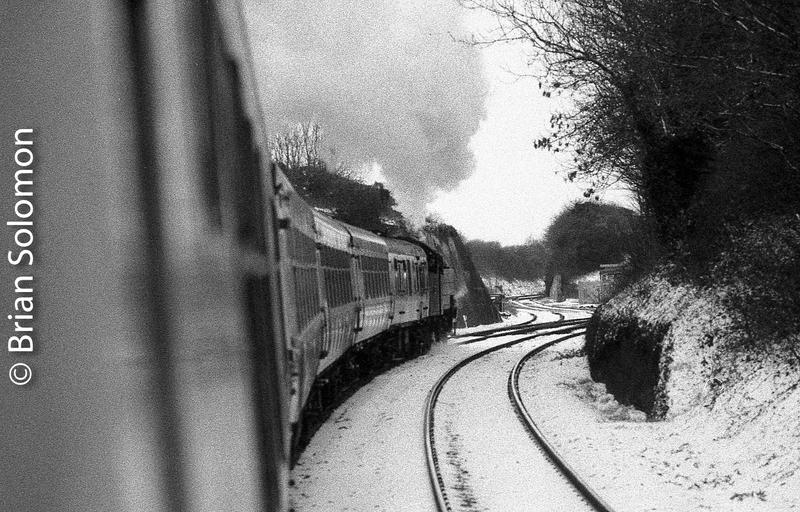 For those photos I processed the film in Foma’s specially formulated Retro developer. 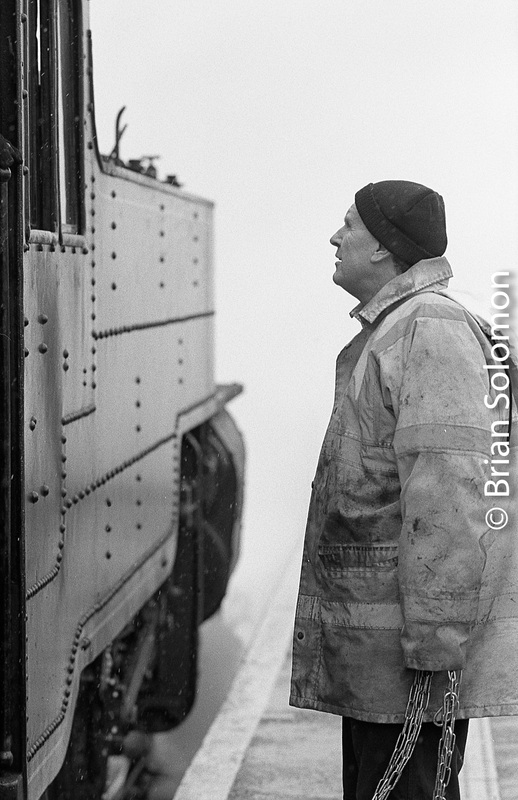 I found the negatives to be grainy, but offering a distinctive tonality with soft highlights. 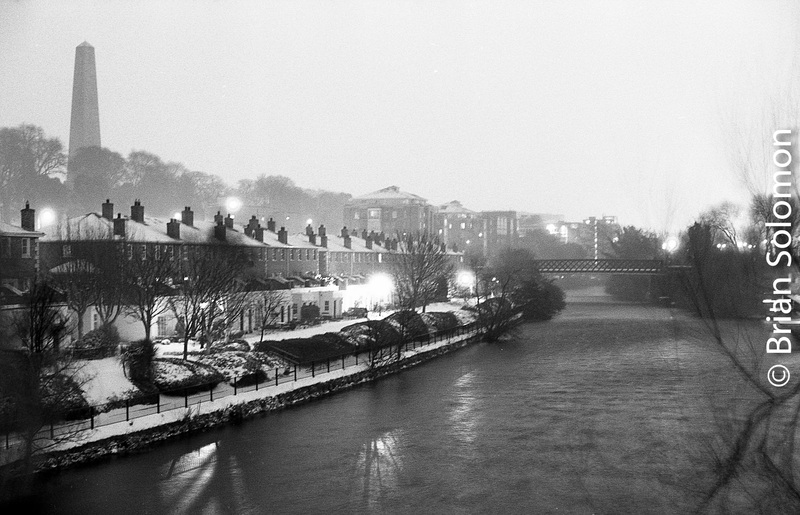 Below are some examples of Retropan using stand development in Agfa Rodinal (mixed 1:100 with water) for 40 minutes, 10 seconds agitation at beginning of development, and again at the end. Development temp 74 F.
Retropan stand process for 40 minutes in Rodinal mixed 1 to 100 with water. 135mm lens. Retropan stand process for 40 minutes in Rodinal mixed 1 to 100 with water. 24mm lens. Retropan 4 minutes Agfa Rodinal Special with 10 second agitation every 30 seconds, plus 9 minutes selenium toner. 24mm lens. A second batch (mixed at 1:32) at 70F for 70 minutes. 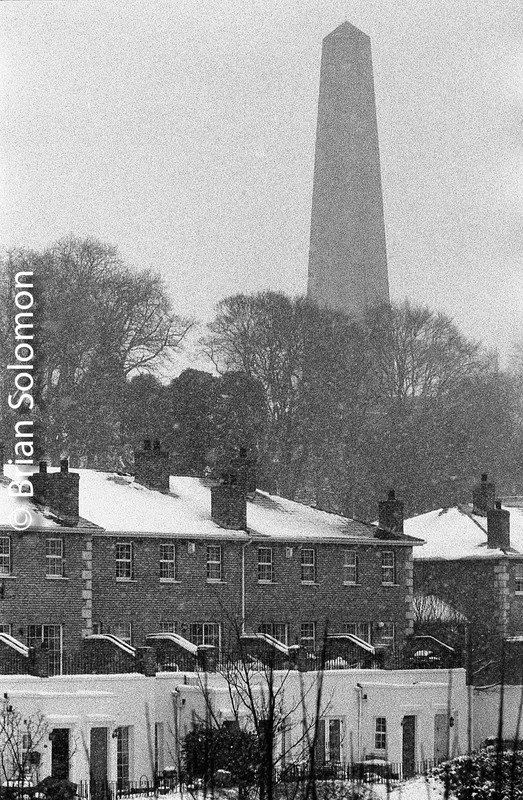 I then toned these negatives for 9 minutes in a selenium solution to boost highlight detail. This is a work in progress and I have no formal conclusions, but makes for some interesting images. 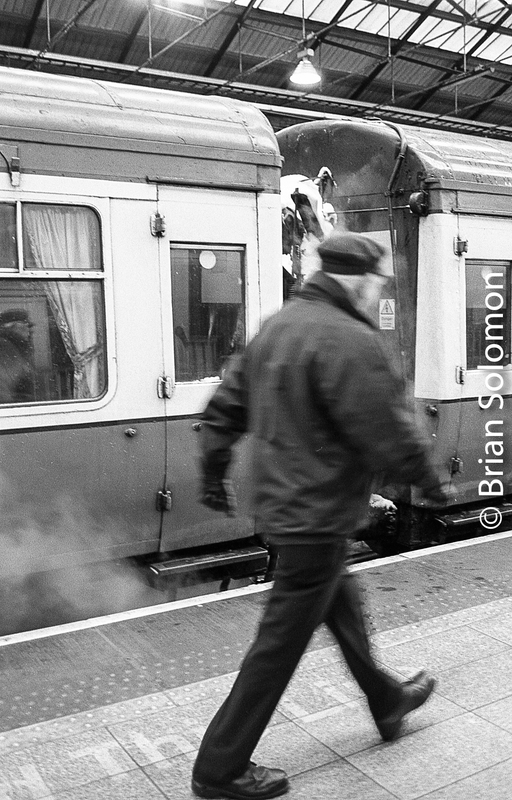 I’ve been exploring and photographing Irish railways since 1998. To mark my twenty years photography, I thought it would be a neat exercise to display images of each of the 201-class General Motors diesels in numerical order. 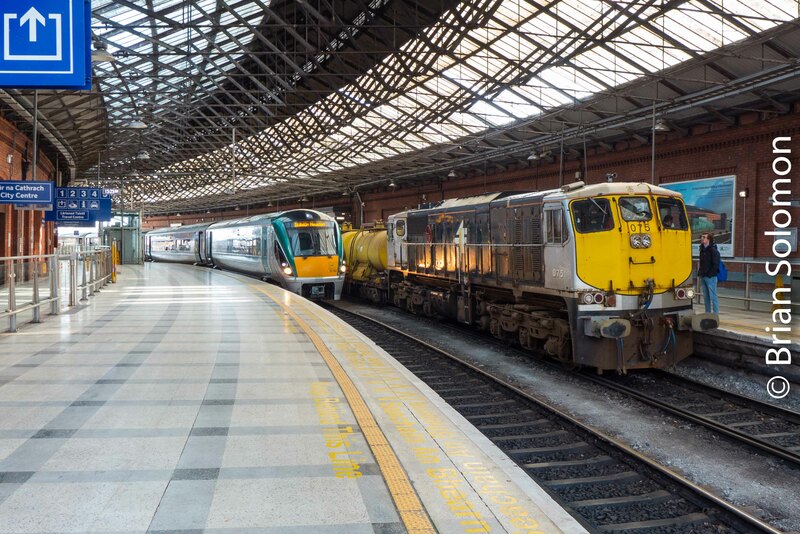 Irish Rail and NIR together have 34 class 201 diesels. 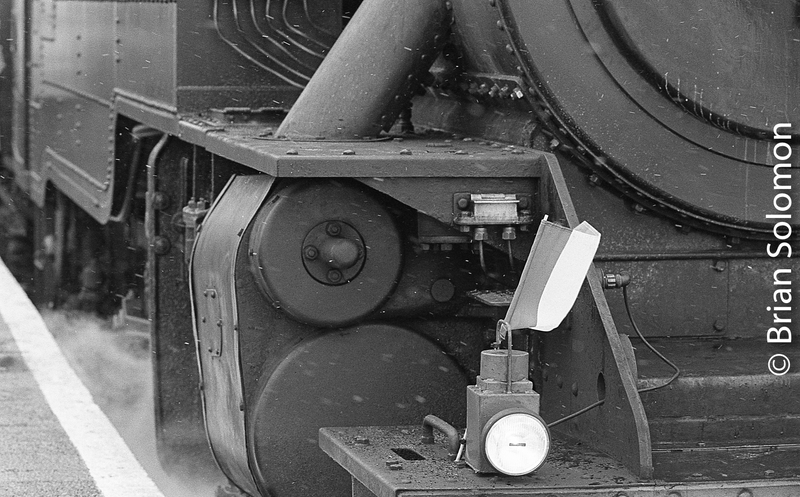 This series of posts will feature the locomotives in numerical order, while imaging them in various ways. 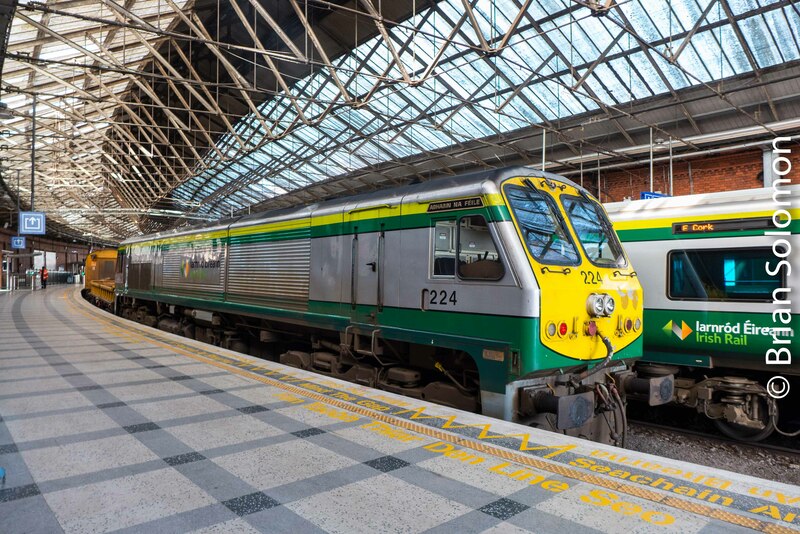 Here were have two of the liveries applied to the 201s by Irish Rail. I realise this is a specialised exercise (Americans may substitute ‘ize’ of ‘ise’ as required), but I though it would fun. 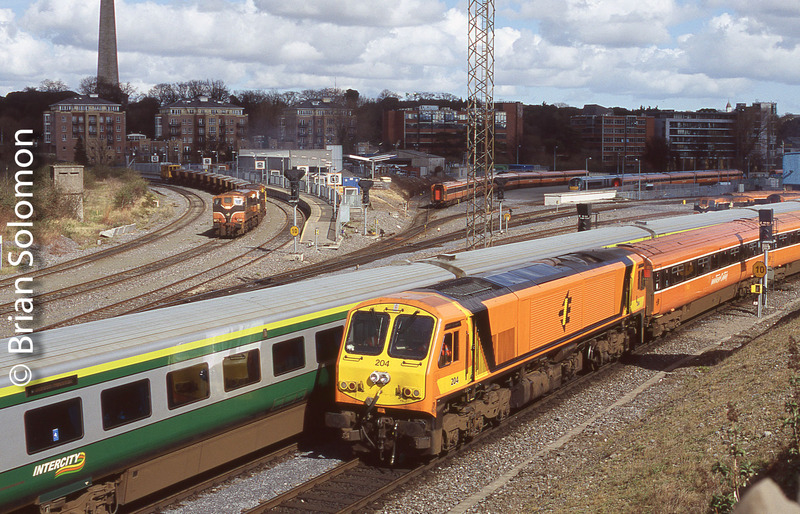 So after some serious closet scouring and sifting though other arrays of old photos resulted my locating of various images of the every elusive Irish Rail 202 (presently stored out of service at Inchicore in Dublin). Now over the coming weeks, I’ll be making EXTRA posts with images of the 201 in order. Tracking the Light EXTRA Post. 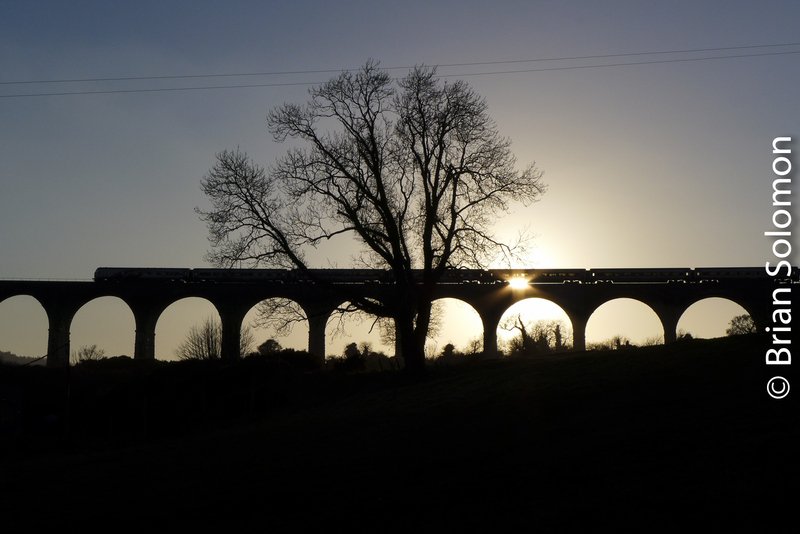 A few weeks ago I posted a shadow silhouette made from the Belfast-Dublin Enterprise crossing the old Great Northern Railway (of Ireland) Craigmore Viaduct. LX7 photo from the train. Last week I had the opportunity to make a photo of the same bridge from the ground, thus making use of the shadow from a completely different angle. 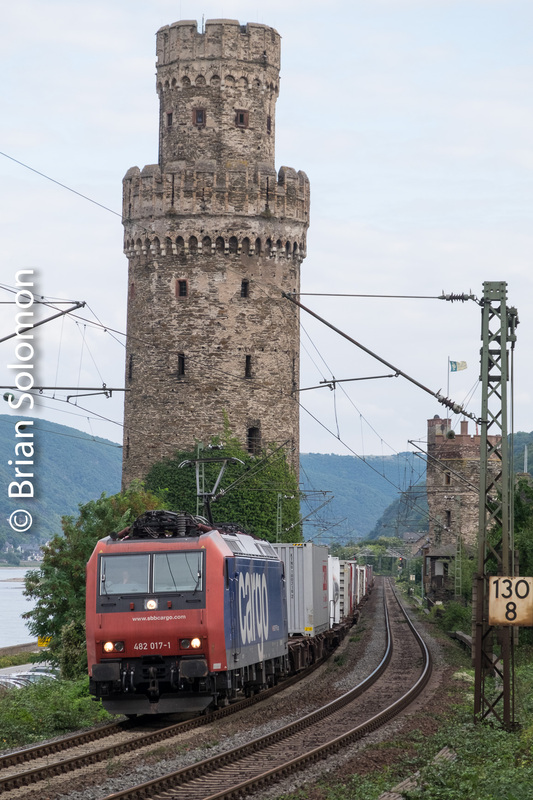 Exposure was the tricky part, since the sun was low on the horizon, but partially blocked by the passing train. 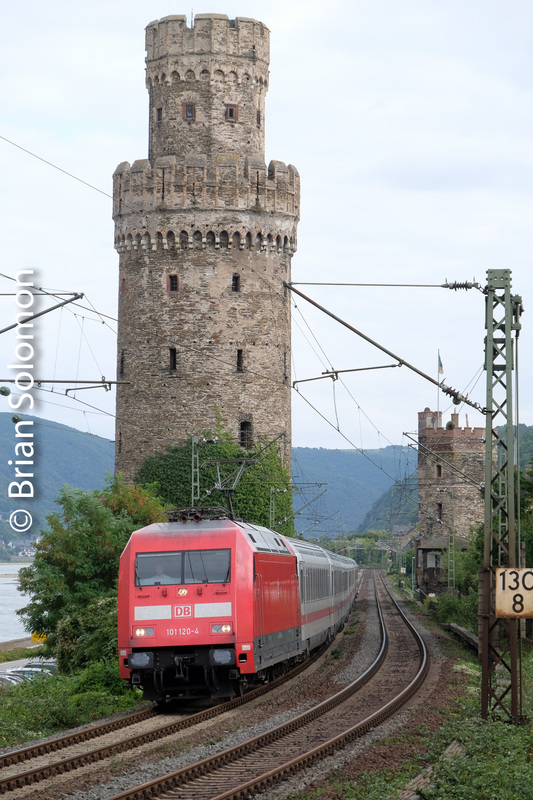 I made these photos with my Lumix LX7 without use of filters or post-processing adjustment. Lumix LX7 ISO80, f8 at 1/1000th second, 60mm setting on the zoom. Thanks to Honer Travers and William Malone with whom I was traveling. 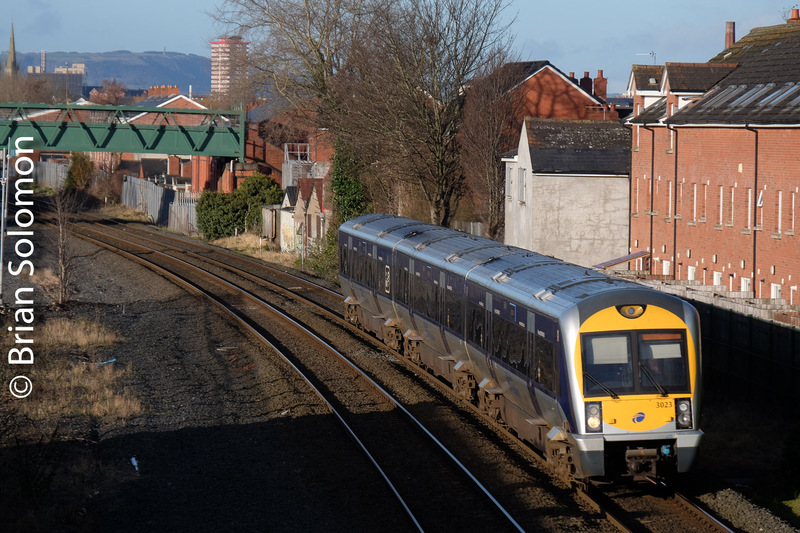 Tracking the Light Extra: Views from today’s 1320 Enterprise to Belfast. 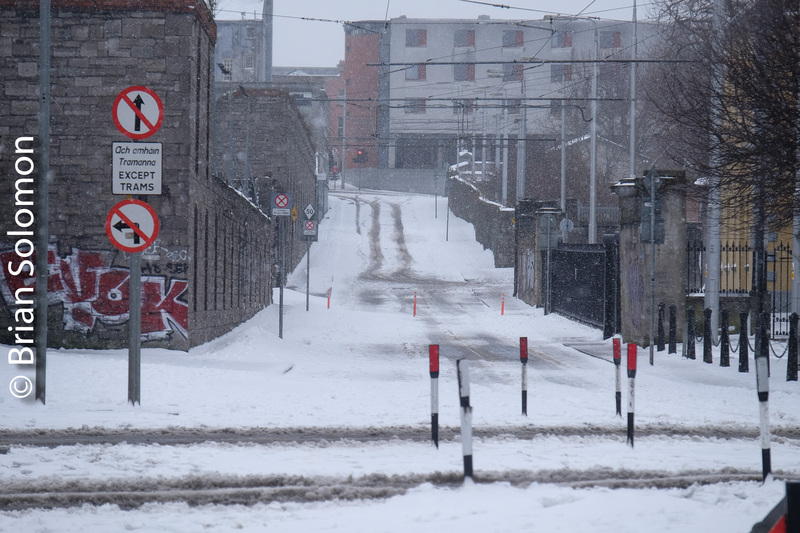 Ground transport was still non-functional when I left Islandbridge, so I made my way through the slush to Connolly on foot, mostly following the rusted over LUAS tracks. 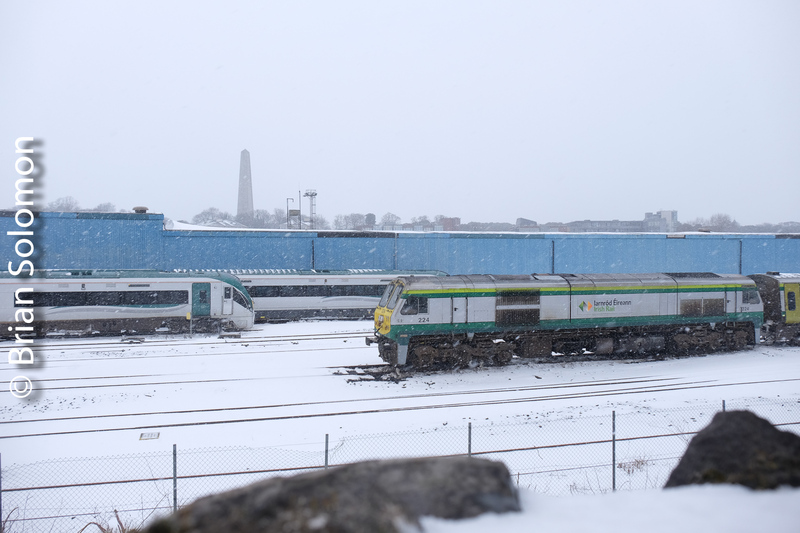 There was a big crowd for the train at Connolly. 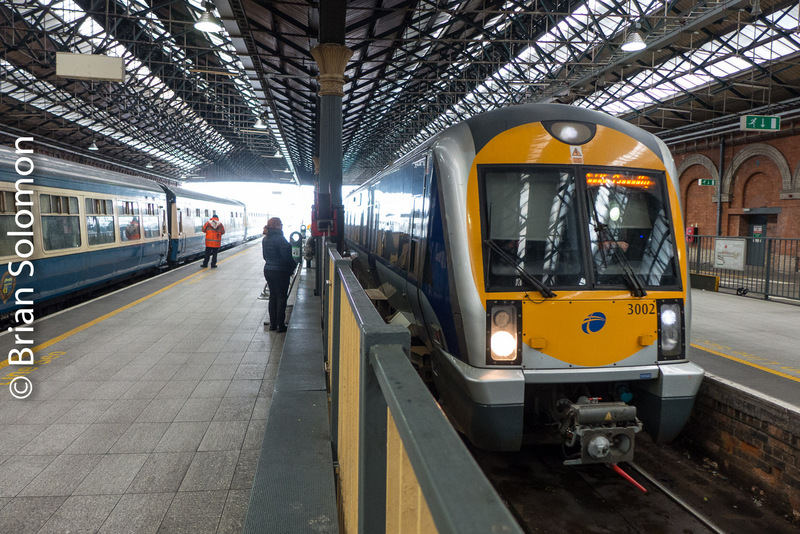 We were slow on the DART route to Malahide, then nominally delayed at Drogheda when a disruptive passenger fought with Irish Rail staff. All and all it was an interesting trip! 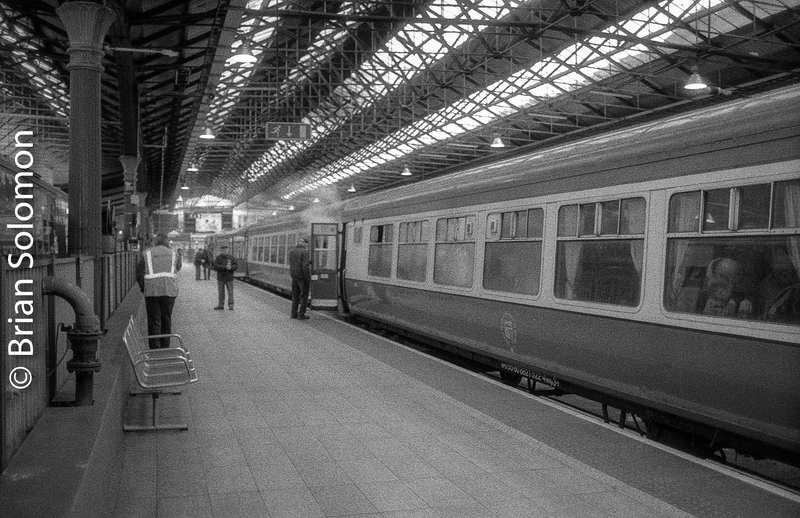 I’m posting from an NI Railways CAF on its way to Great Victoria Street. I made these views using Lumix LX7. 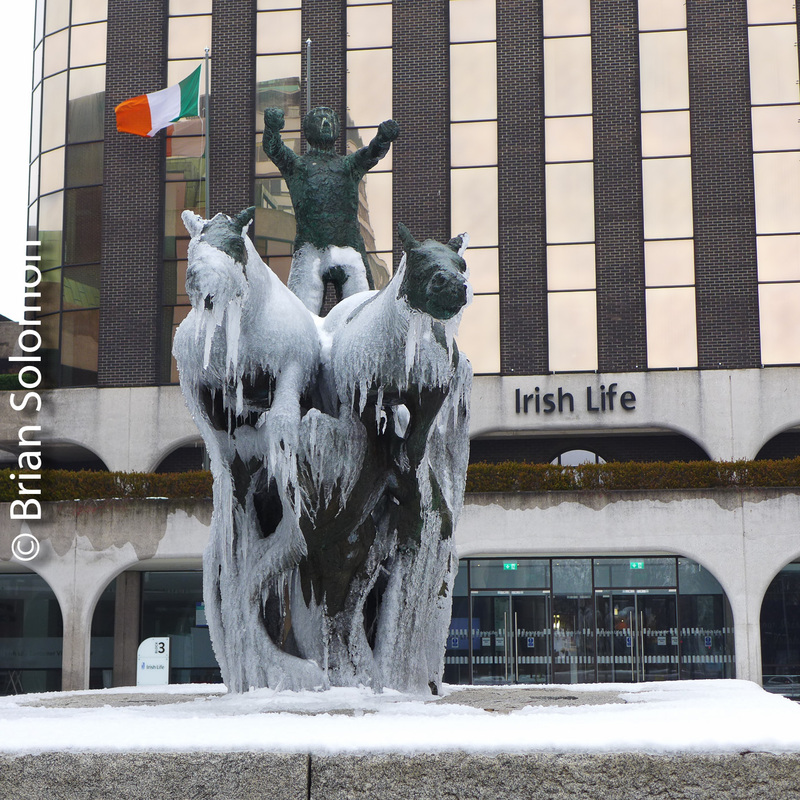 On my walk to Connolly I passed this scene on Abbey Street. 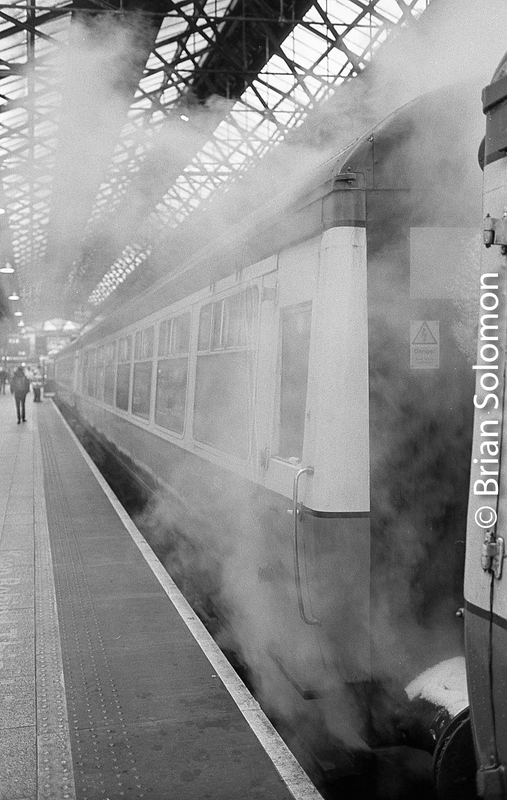 I was happy to see the Enterprise ready on Platform 2. 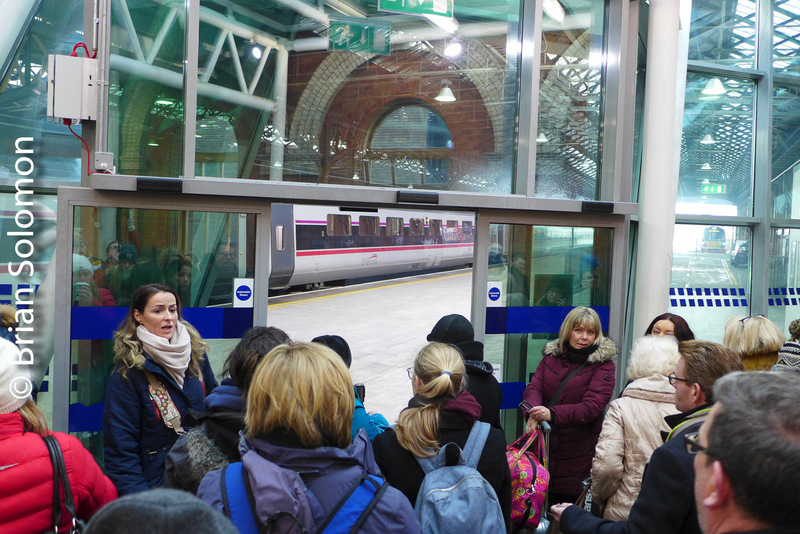 Passengers were anxious to get on the train. Finally a friendly member of staff came along and opened the doors. 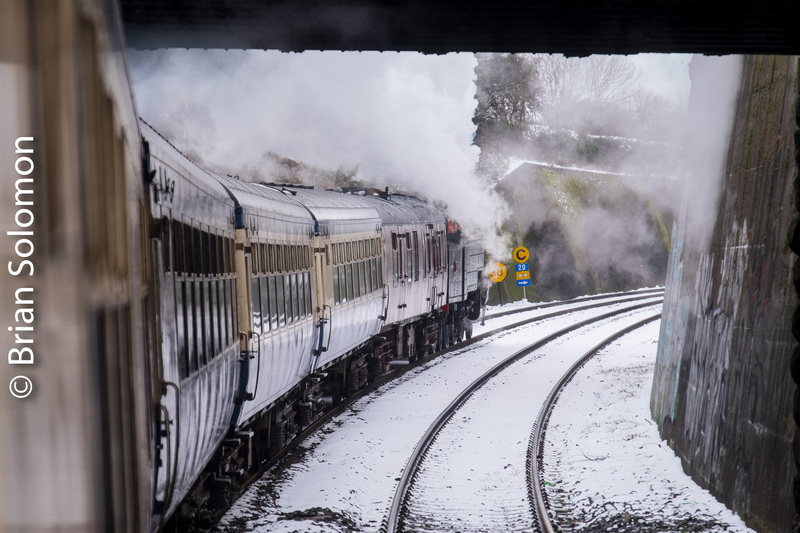 Hmm, snow on the platforms! 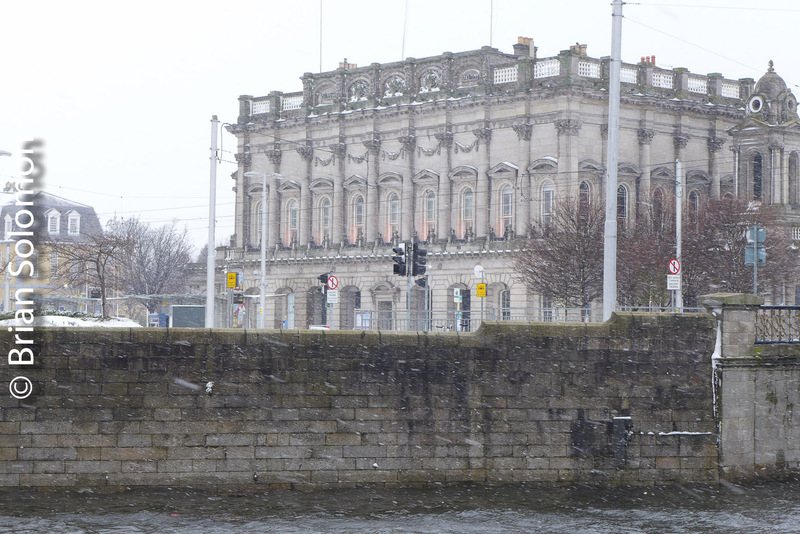 I’m checking the level of snow on the DART and lines from the North Wall. 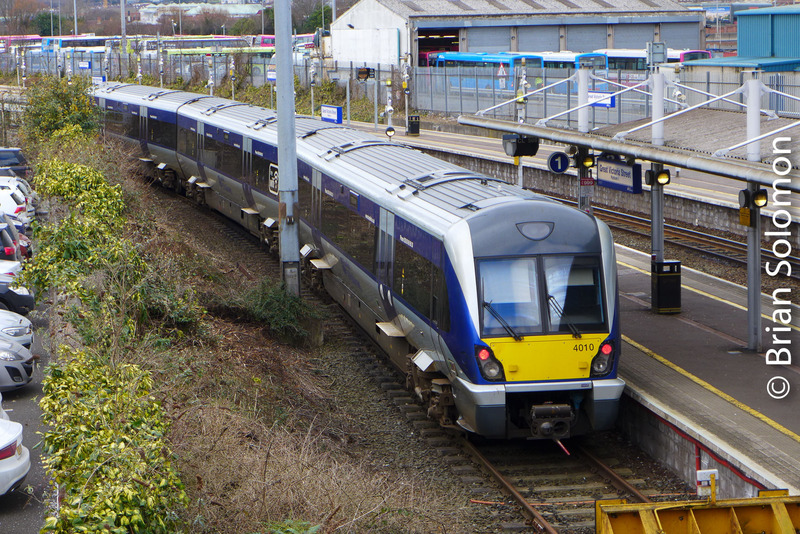 NI Railways CAF Railcars at Portadown a few minutes ago. LX7 photo. 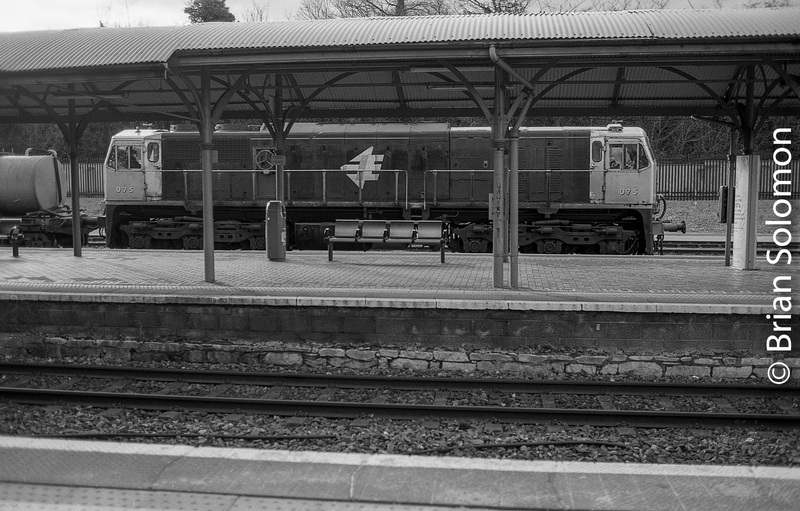 Irish Rail Sperry Train at Kent Station Cork. 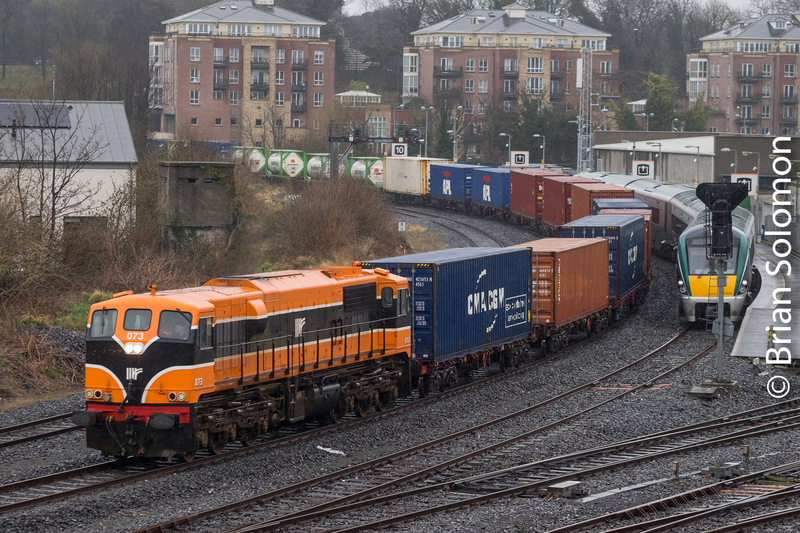 A couple of weeks ago Irish Rail’s Sperry train made a visit to Cork. 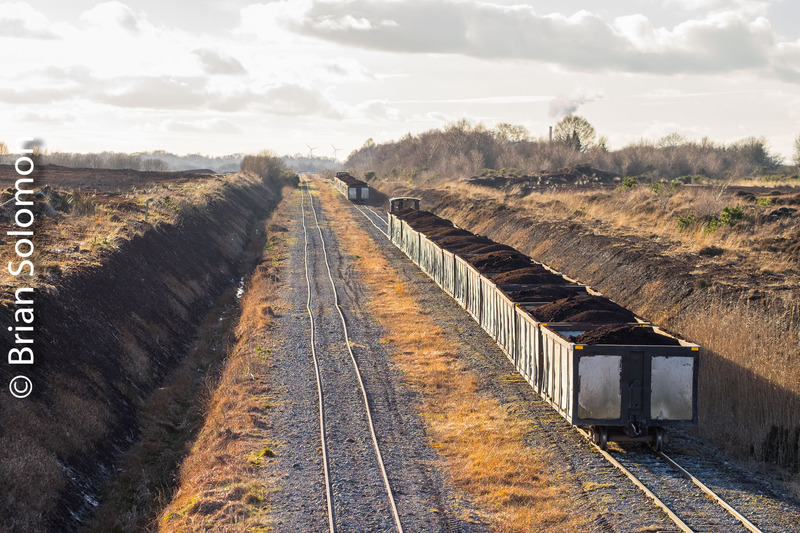 This train is essentially comprised of the weed-spraying consist with the addition of a container that carries the Sperry ultrasonic rail-defect detection equipment. 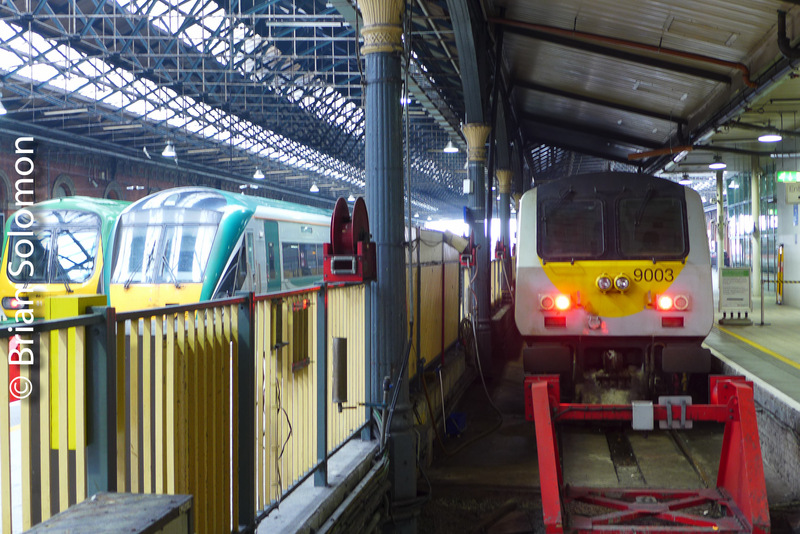 I made these views of the unusual train under the train shed at Cork’s Kent Station. 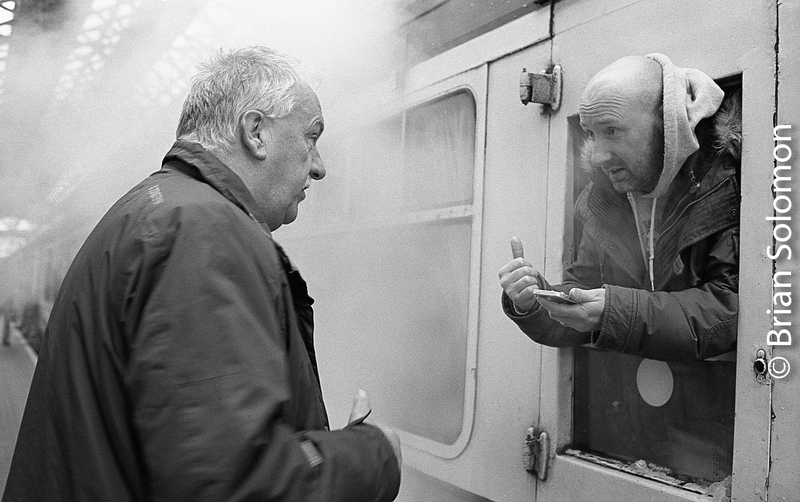 The spoil wagon in the consist was a novelty. 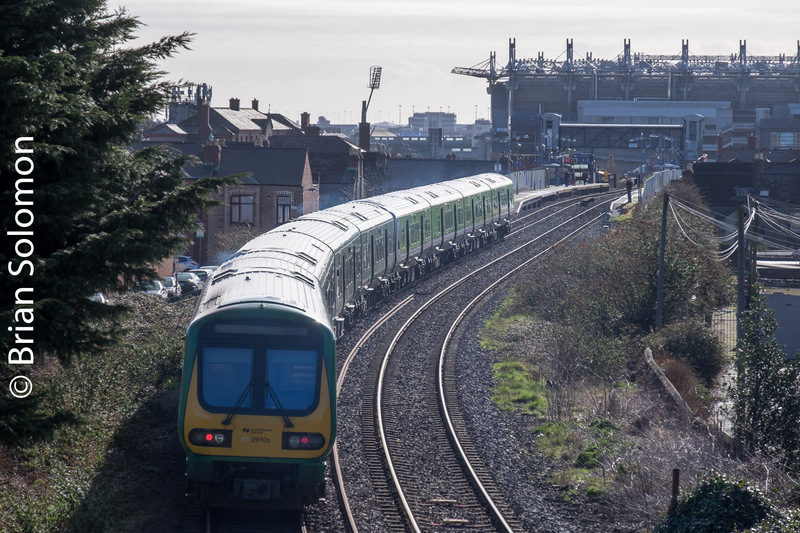 I’ve often photographed trains under Kent Station’s curved train-shed, which is one of the most distinctive locations on Irish Rail. Tracking the Light EXTRA! 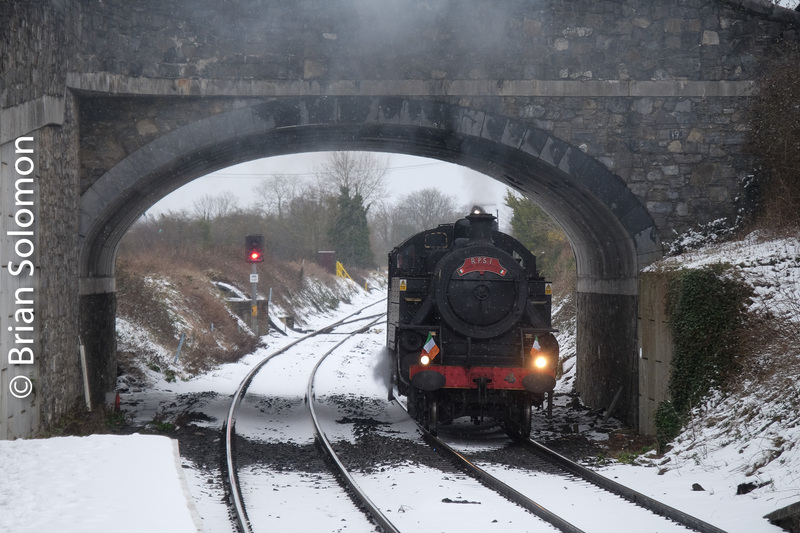 A Dozen photos: Irish Transport at a Standstill. 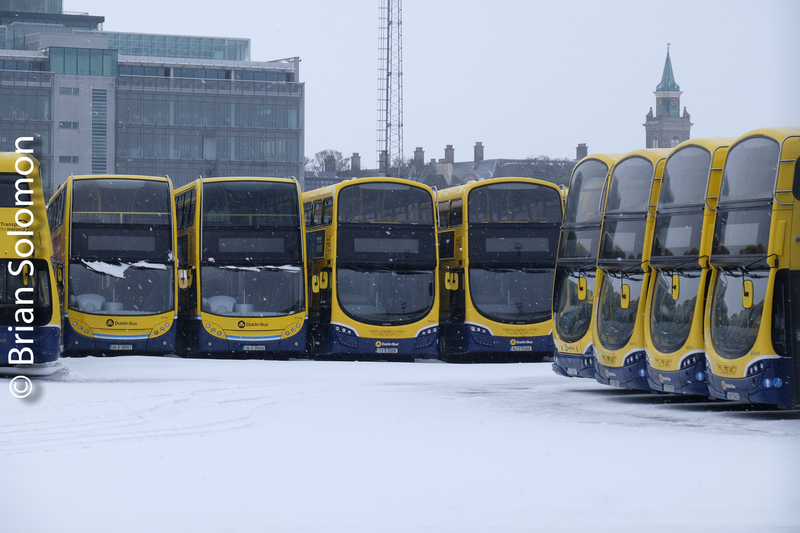 Heavy Snow Shuts Irish Rail, LUAS and Bus Services. 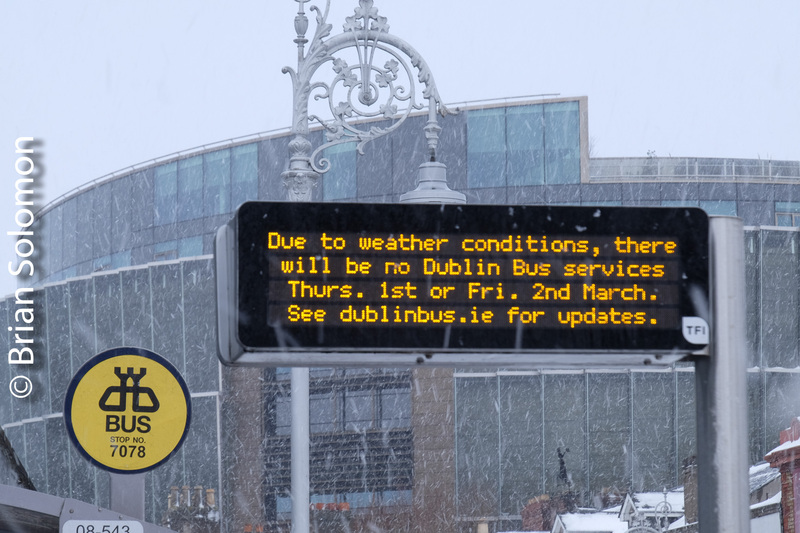 Today, 2 March 2018, public transport was suspended across the Republic of Ireland. 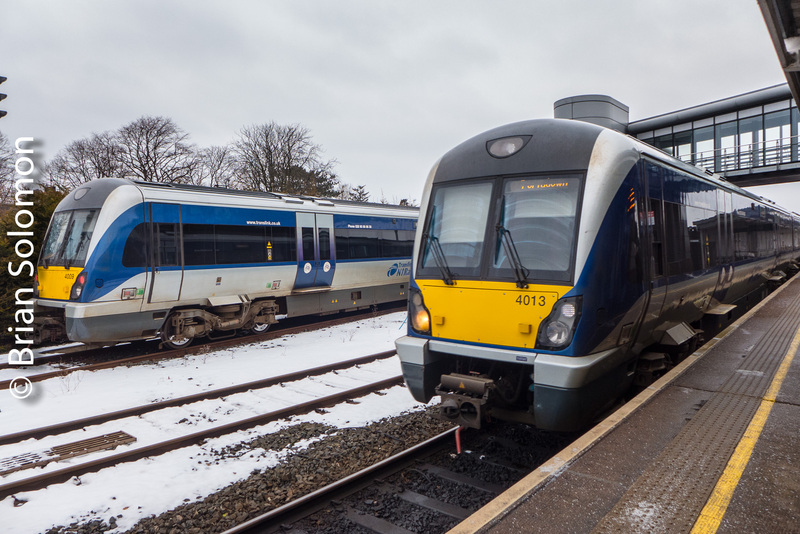 Irish Rail stopped operating trains yesterday afternoon. 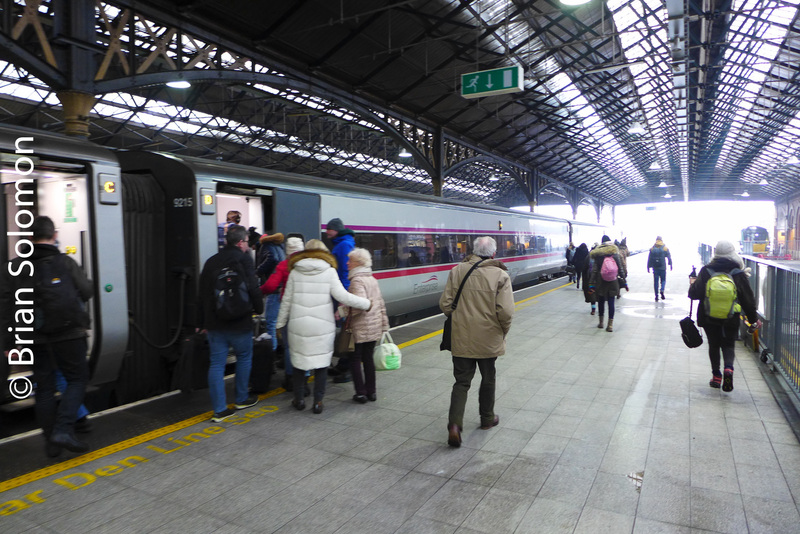 Earlier today I made a cursory inspection of Dublin’s Heuston Station. 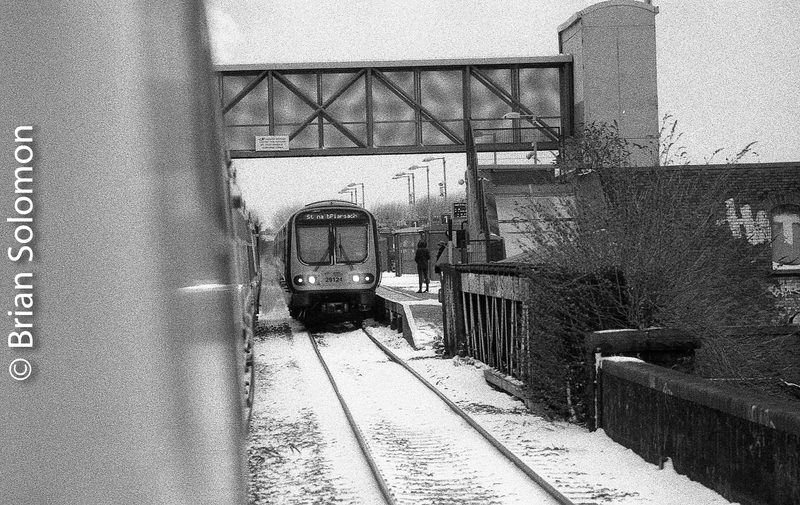 Drifts covered the line at Islandbridge Junction; trains were idle at the Heuston yards; the LUAS tram tracks were completely covered, and buses were idle at the Conyngham Road bus garage. 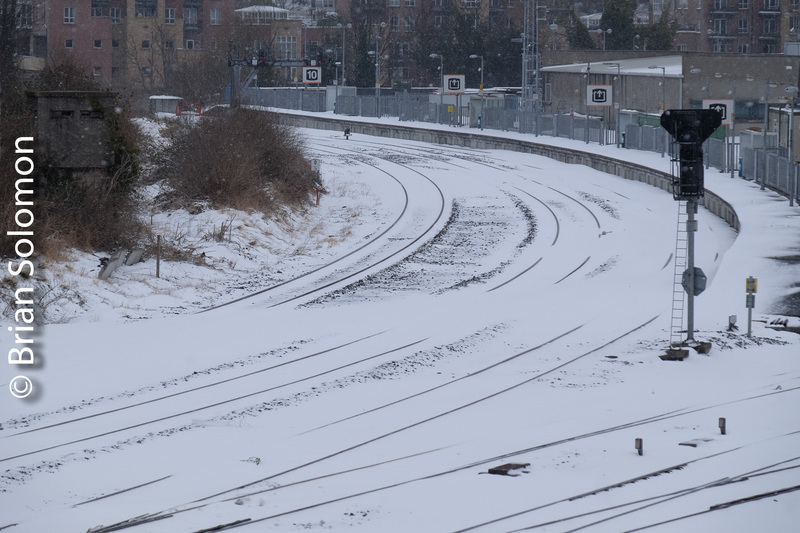 Snow covers Irish Rail tracks at Islandbridge Junction in Dublin. 2 March 2018. 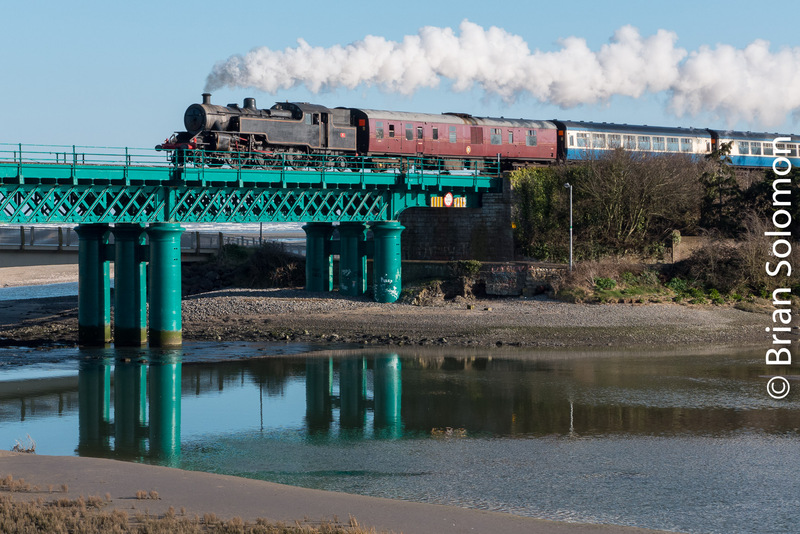 Irish Rail’s Liffey Bridge at Islandbridge, Dublin on 2 March 2018. 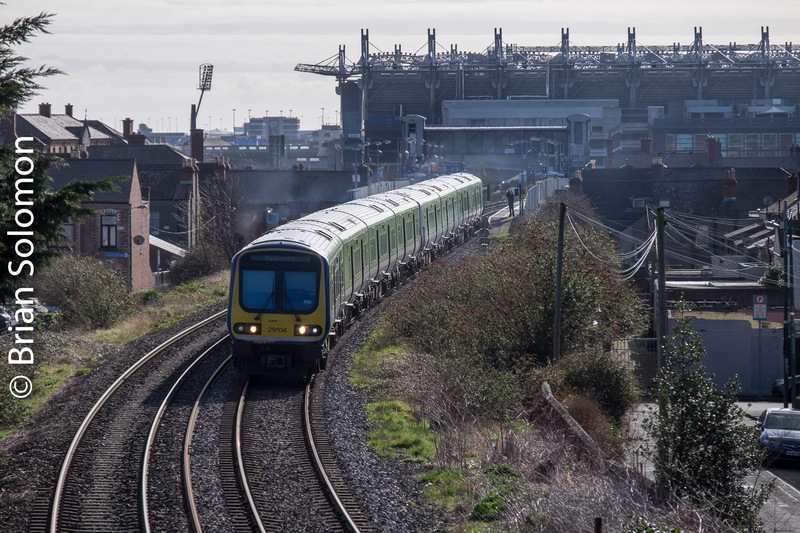 Irish Rail trains idled at the Heuston Station yards. 2 March 2018. 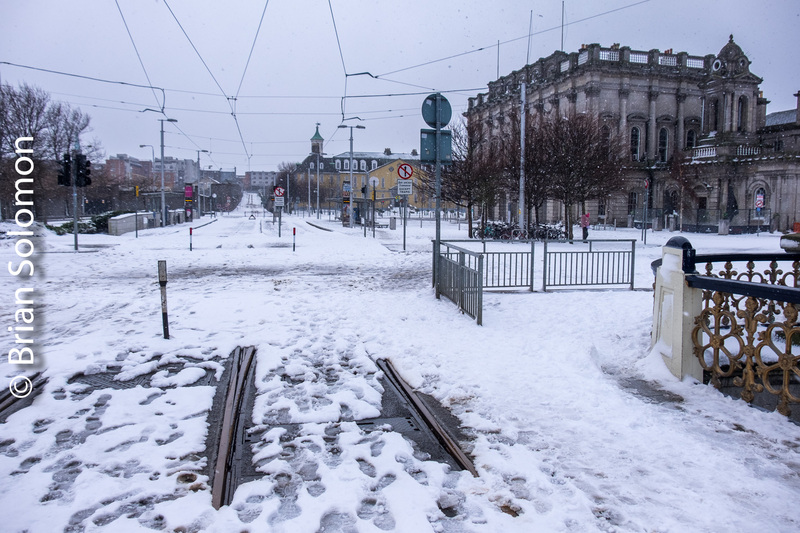 Snow covers the normally busy LUAS tram tracks at Heuston Station. 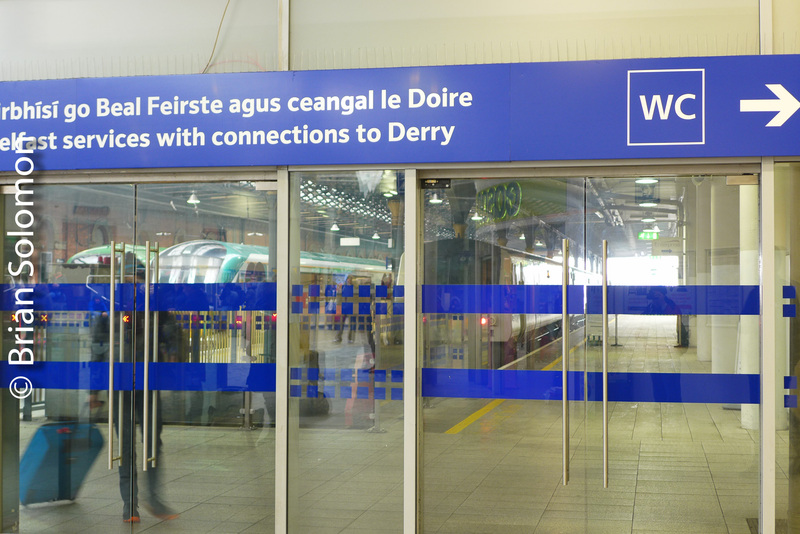 Irish Rail’s terminal is shut. 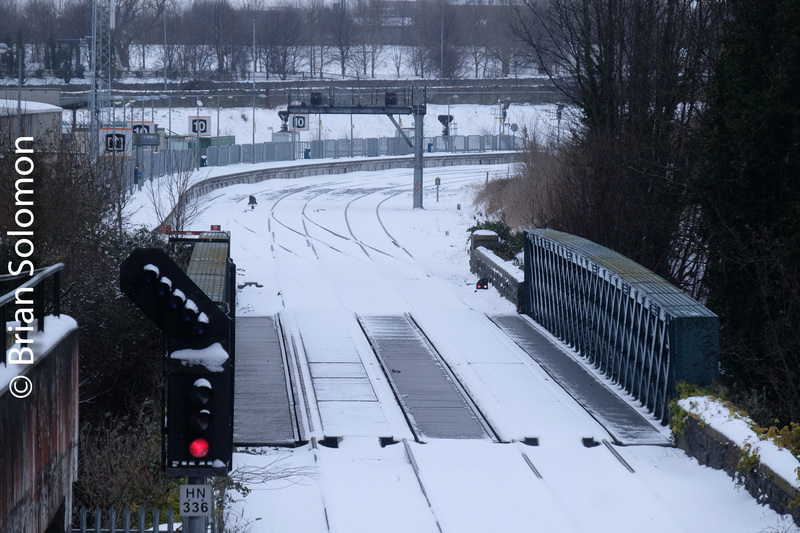 LUAS tracks lay beneath a blanket of snow on Steevens Lane. 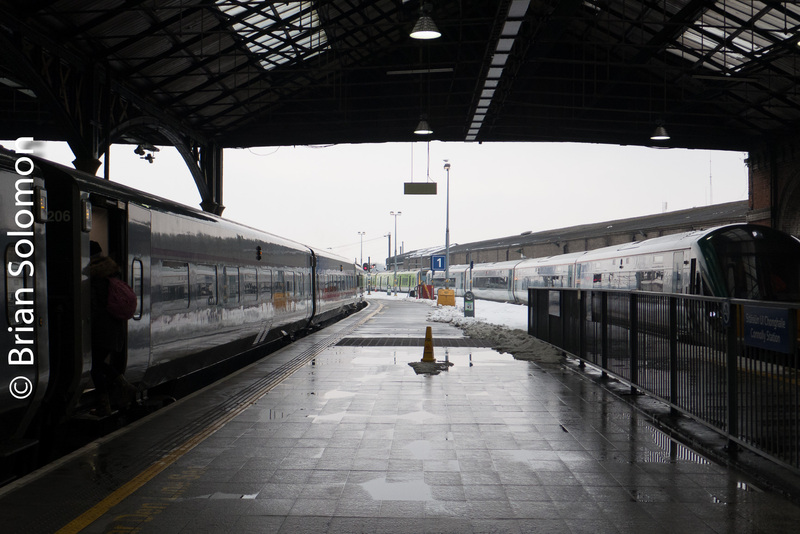 All is quiet at Heuston Station. 2 March 2018. 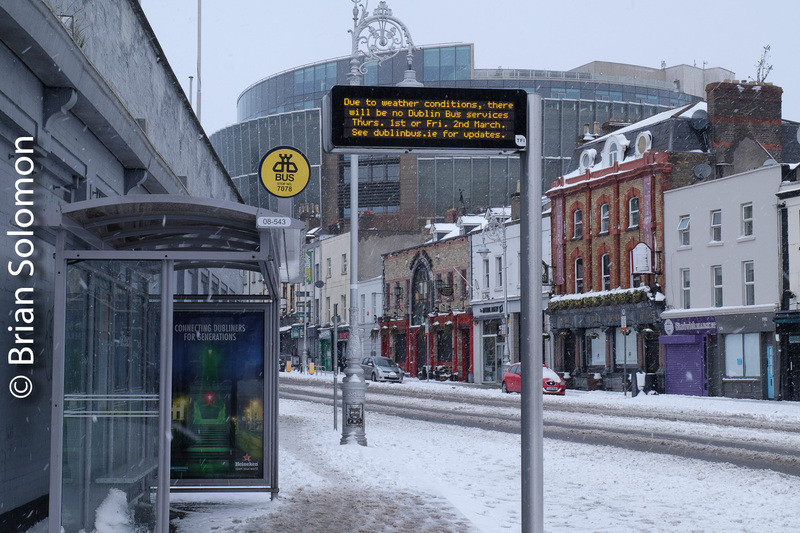 Dublin Bus stop at Parkgate Street. 2 March 2018. Idle buses at Conynham Road Garage. 2 March 2018. 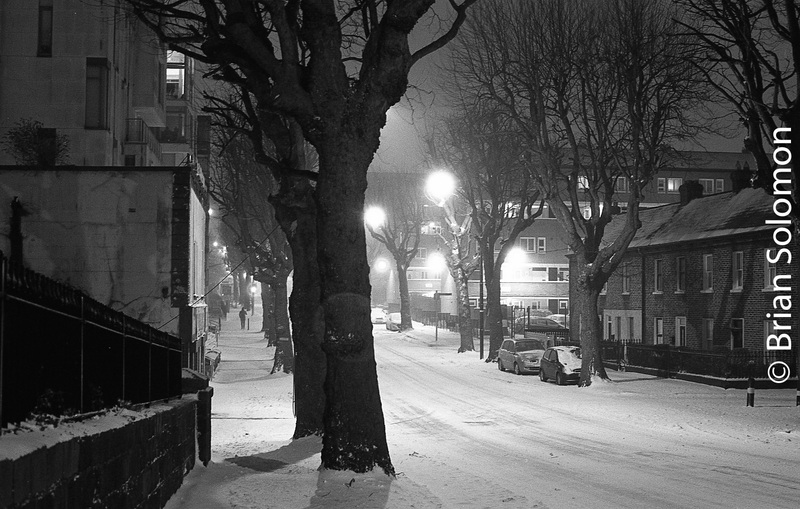 I’ve heard that there’s greater amounts of snow inland. In many places roads are impassible. Air travel has been grounded. 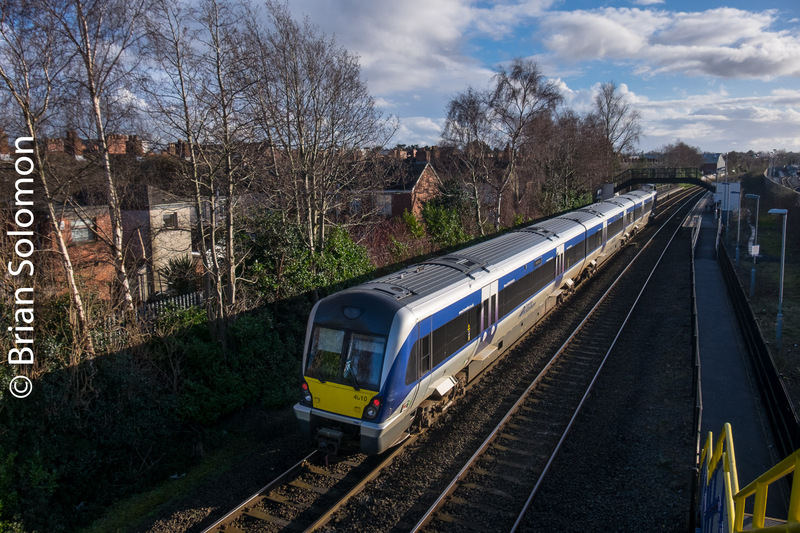 Reports from Northern Ireland indicate that NI Railways continues to provide service, possibly with some delays. My photos were exposed digitally using Lumix LX7 and FujiFilm XT1 cameras.